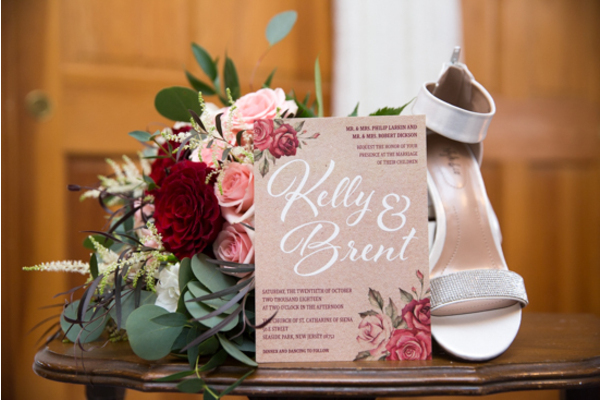 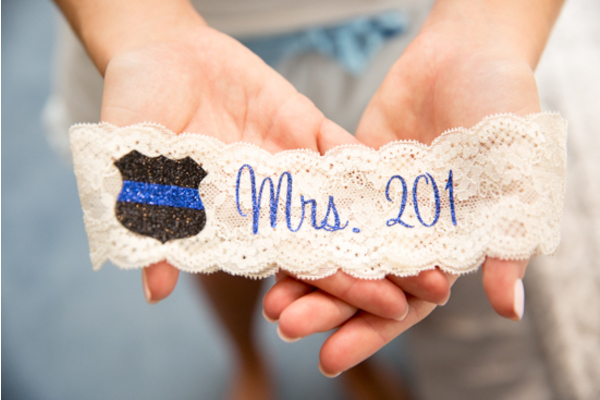 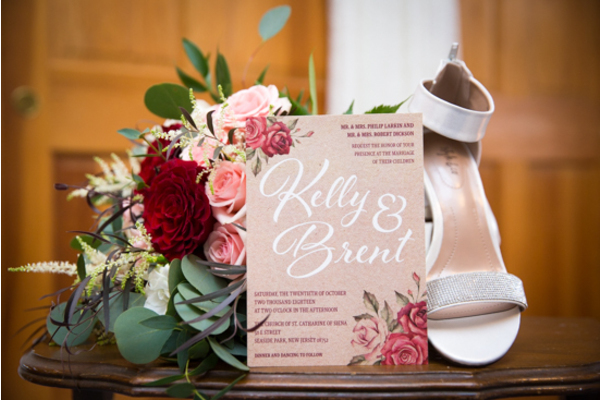 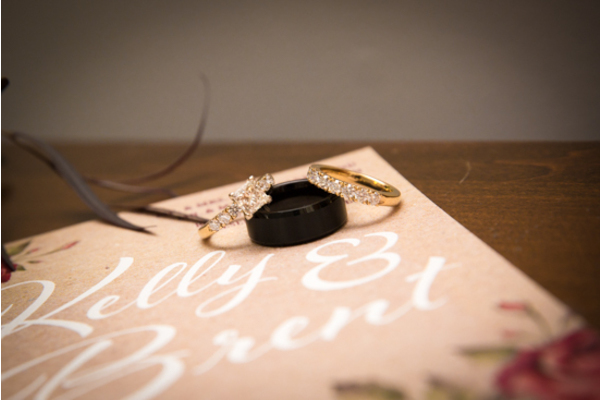 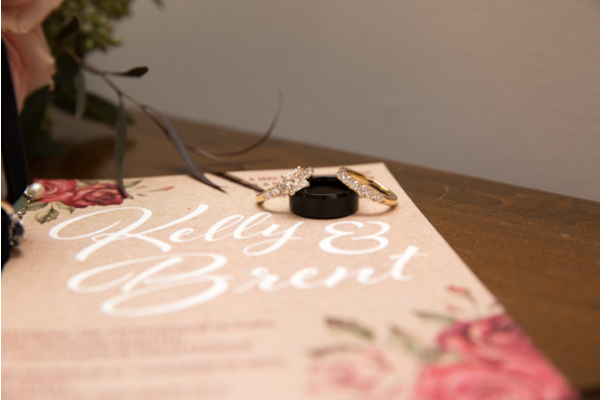 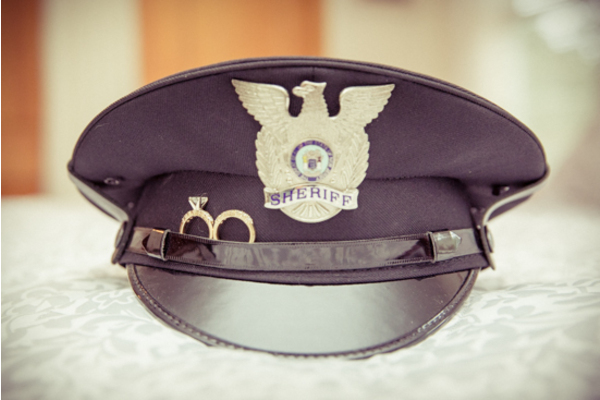 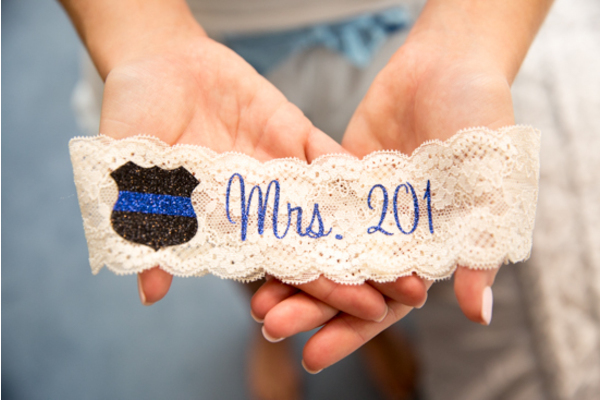 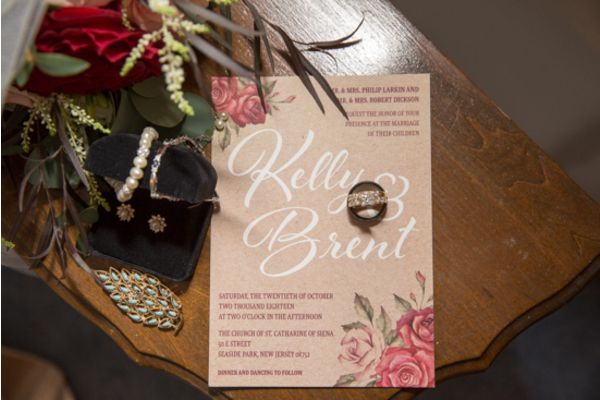 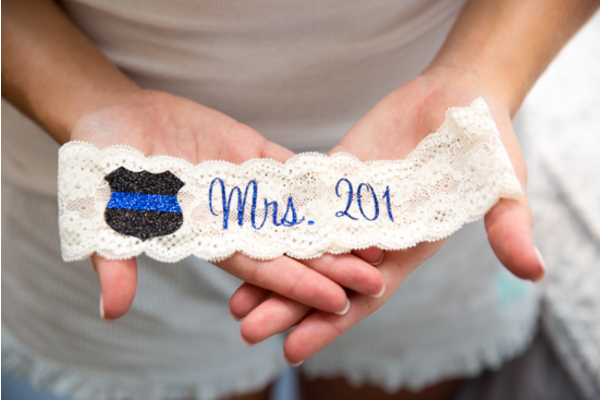 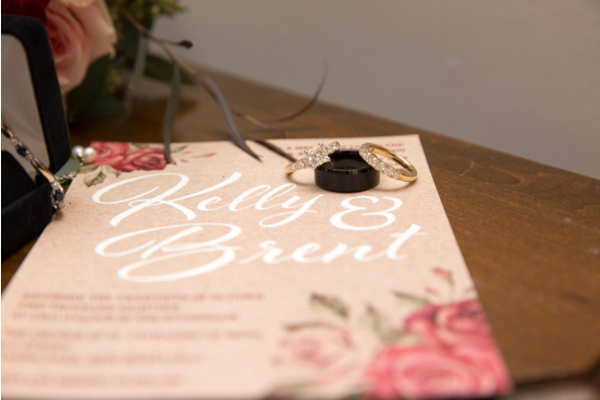 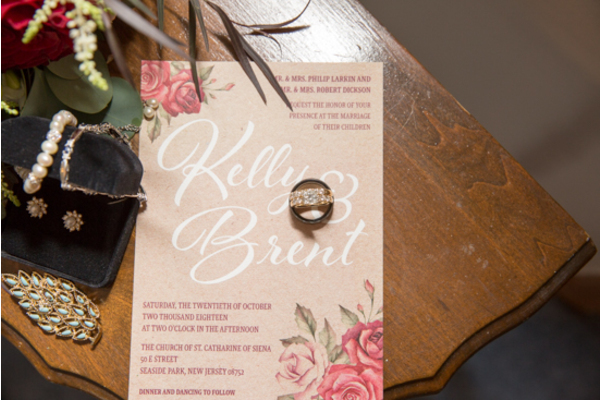 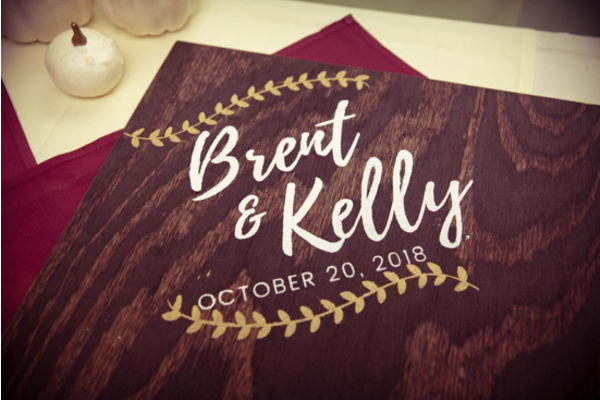 A huge congratulations is in order for Kelly and Brent! 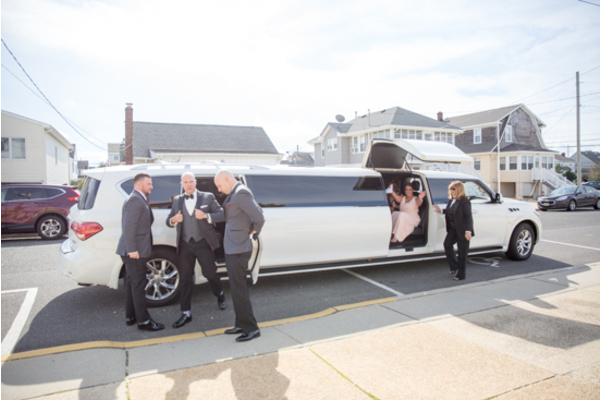 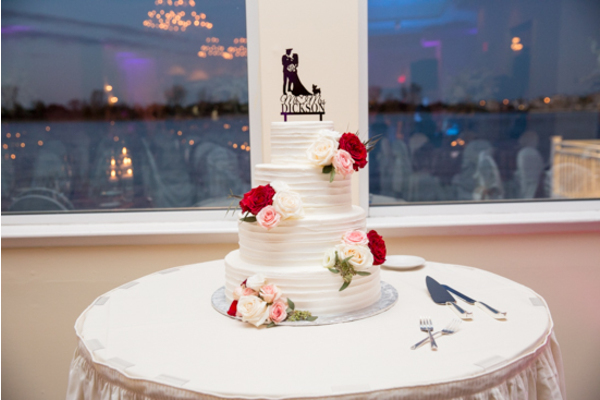 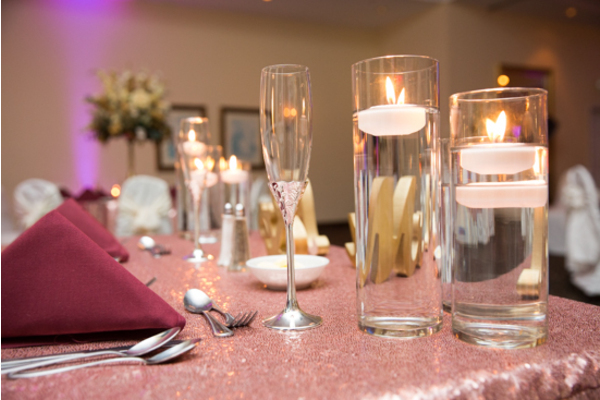 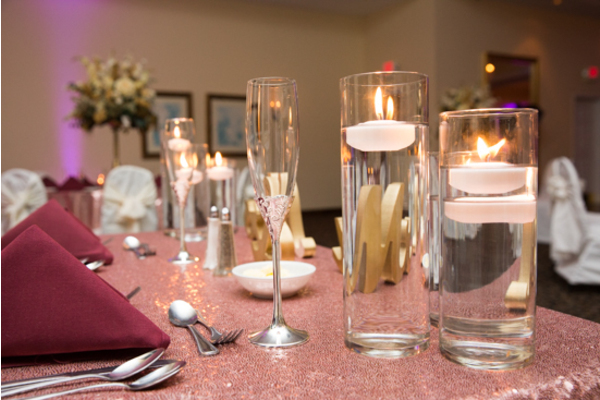 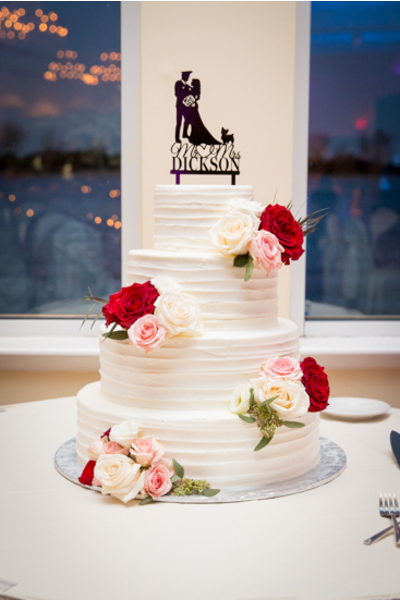 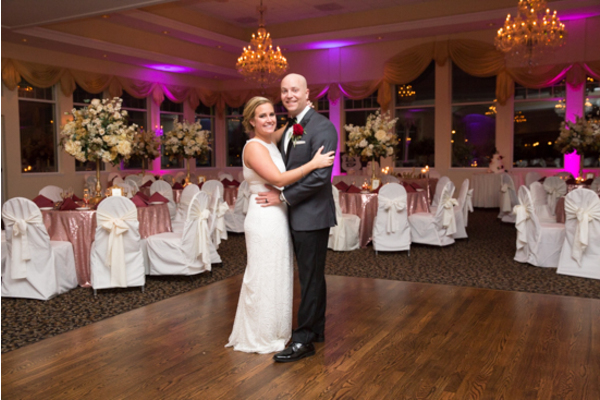 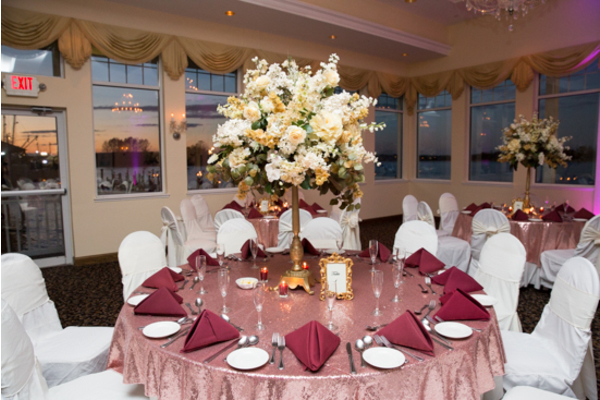 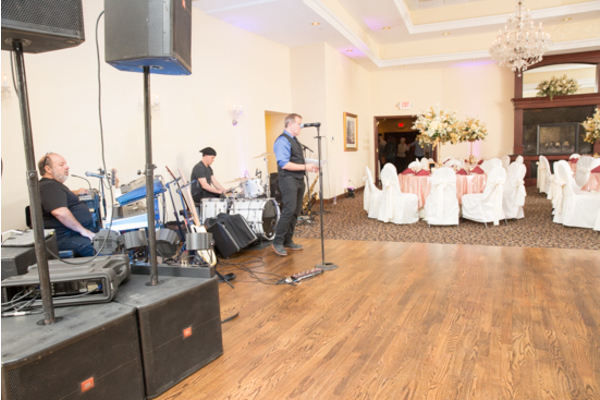 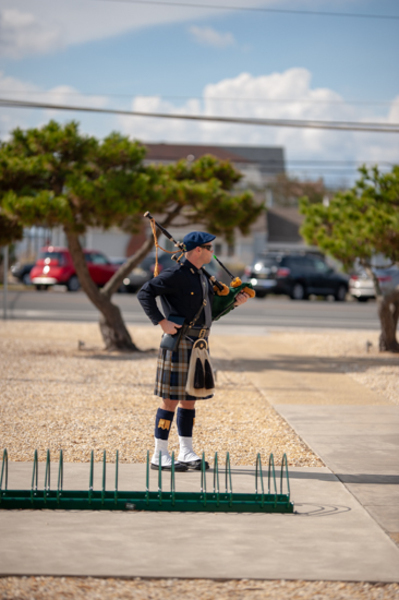 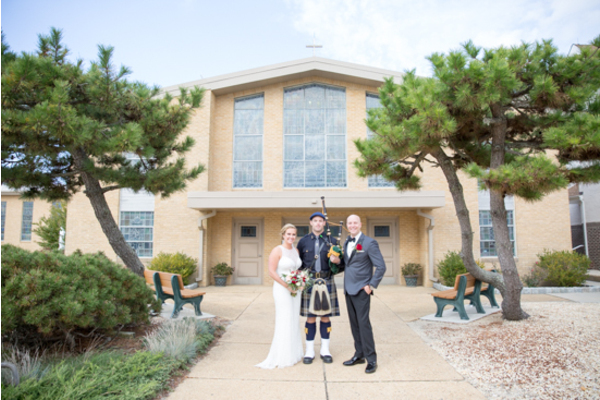 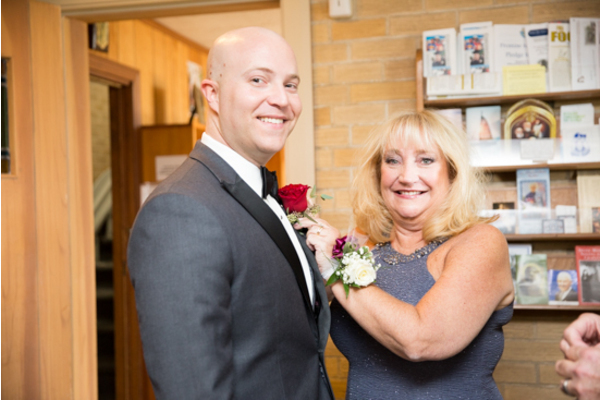 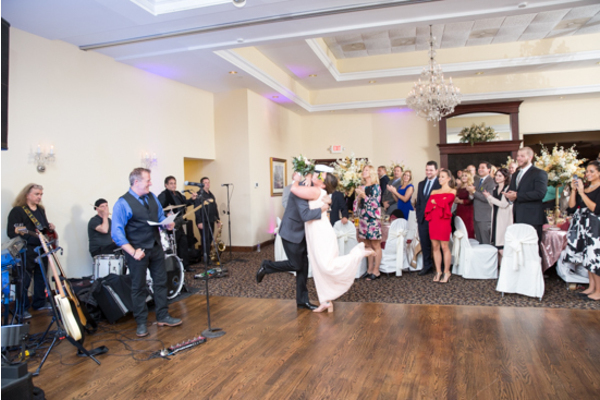 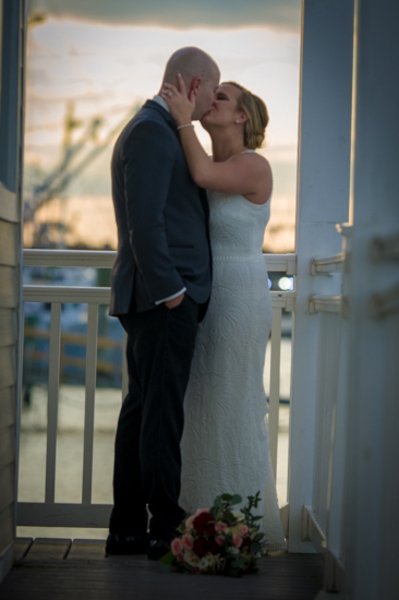 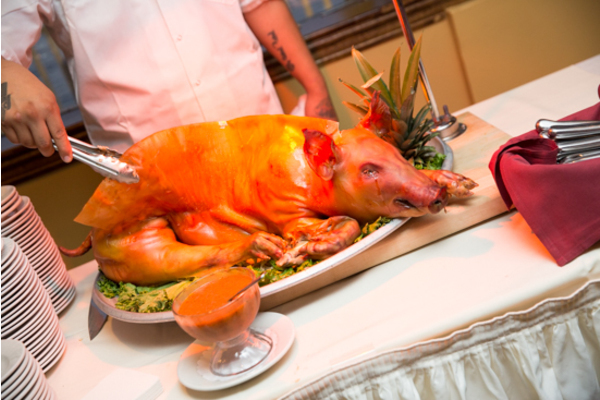 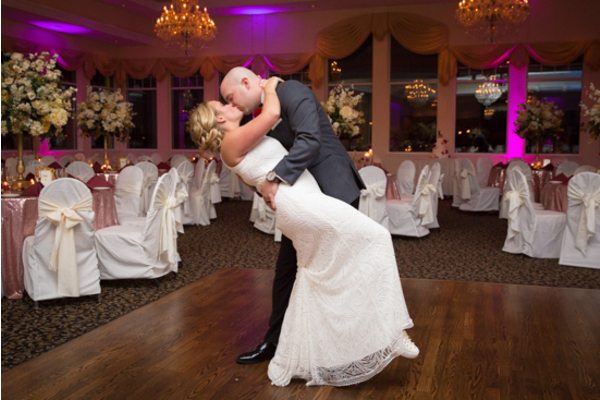 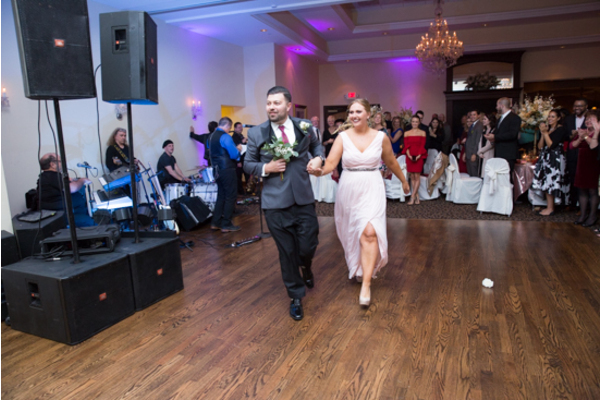 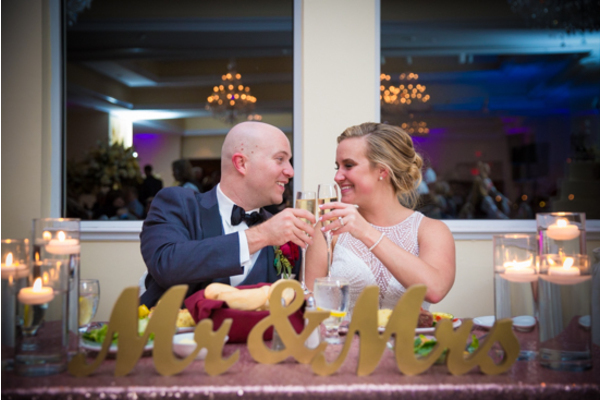 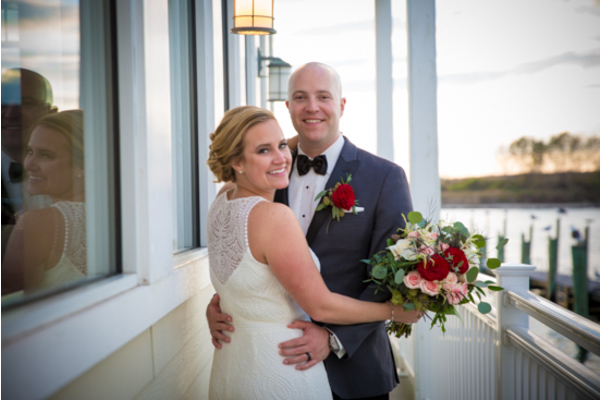 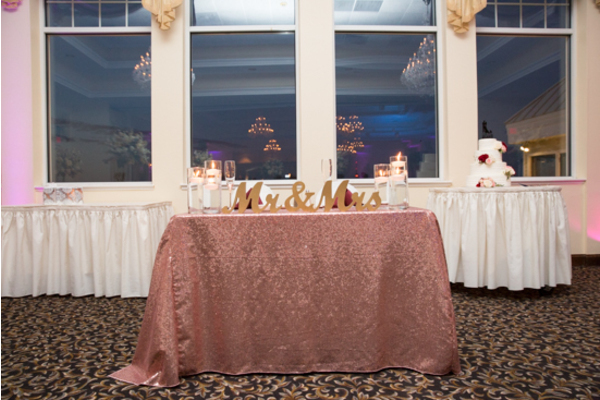 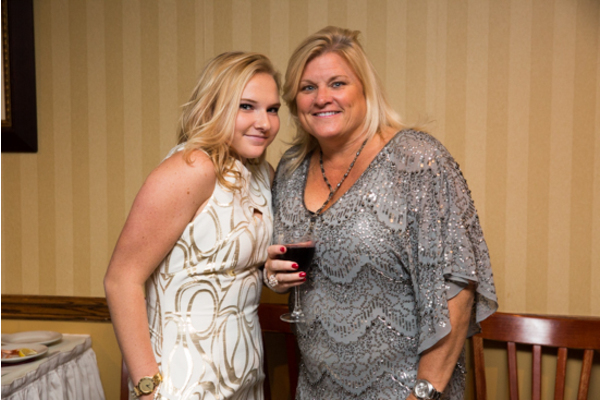 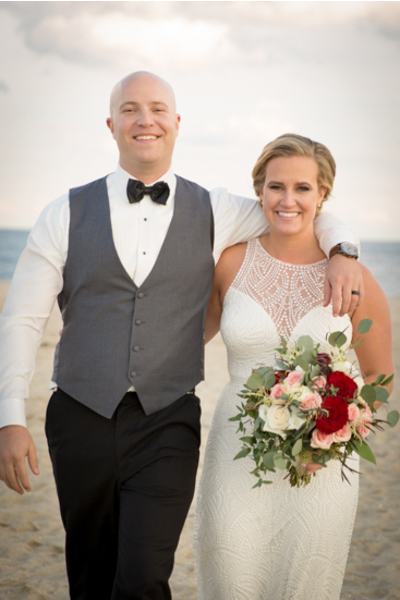 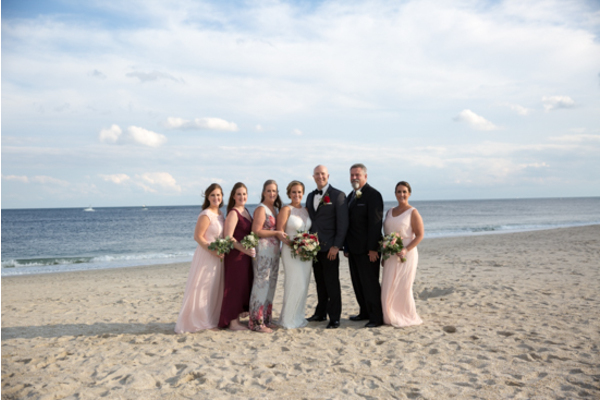 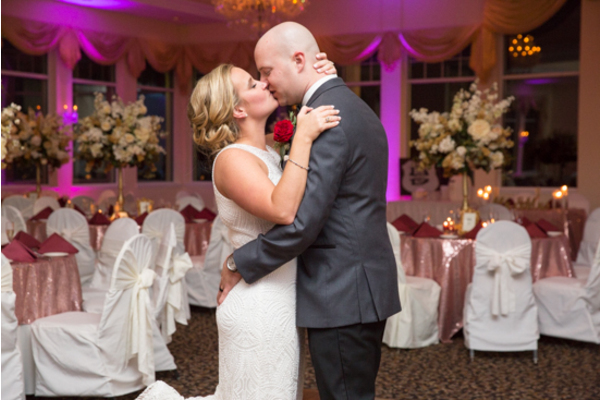 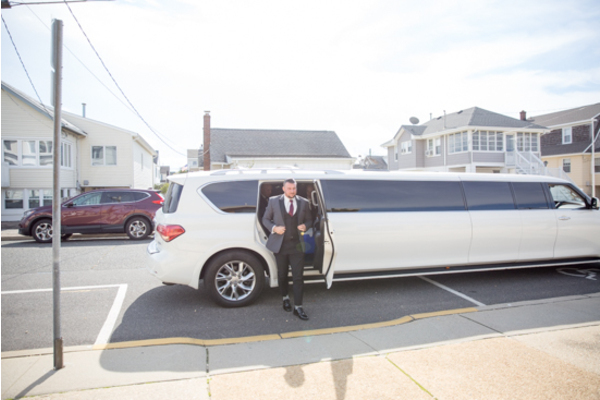 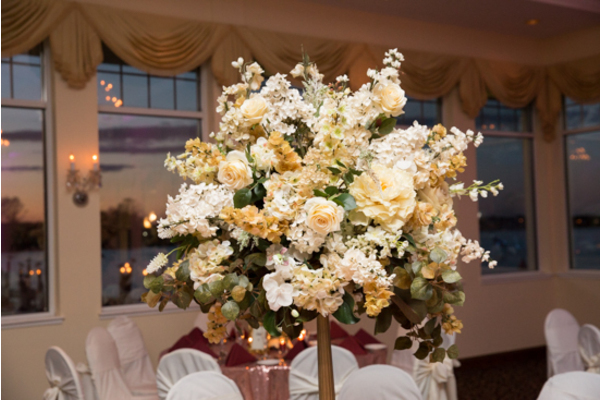 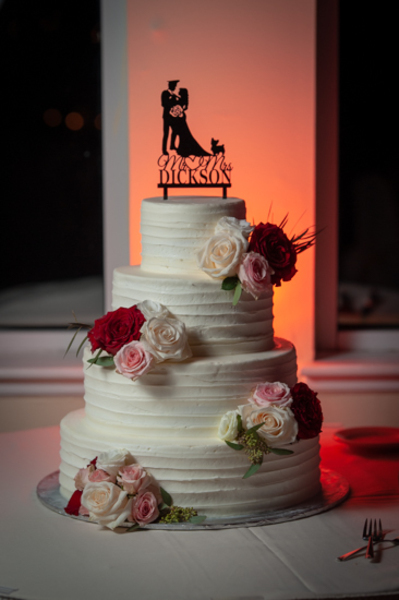 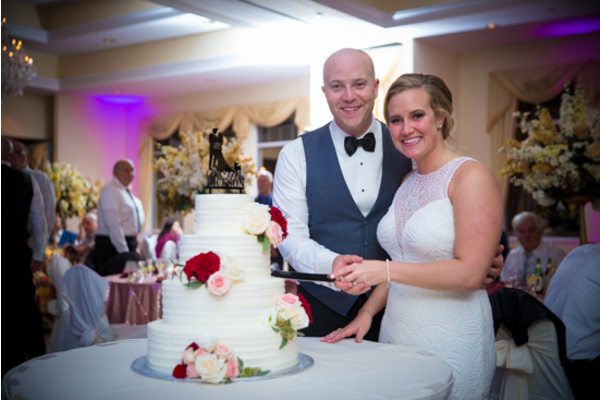 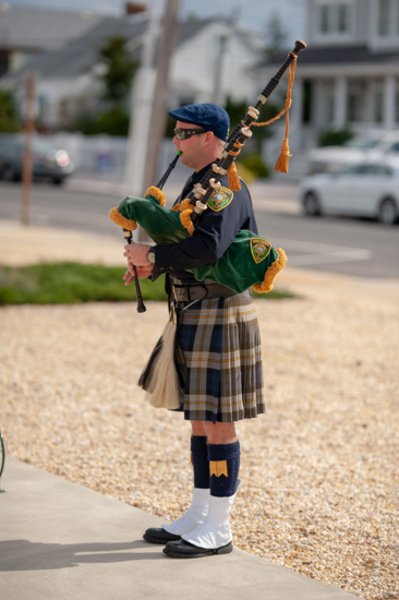 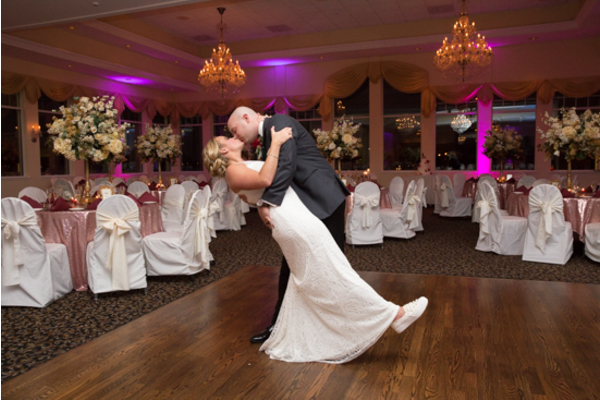 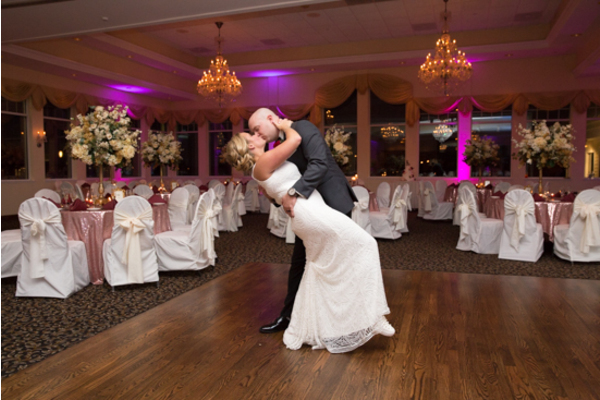 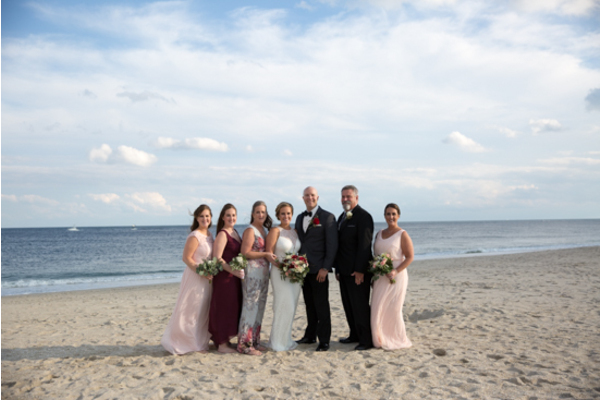 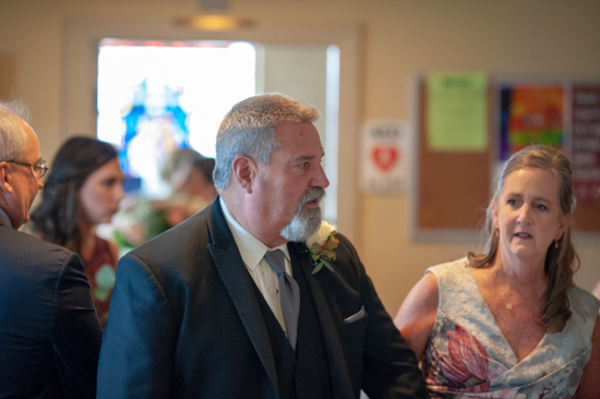 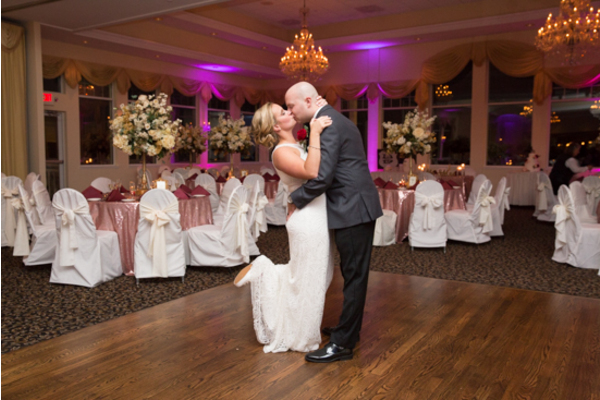 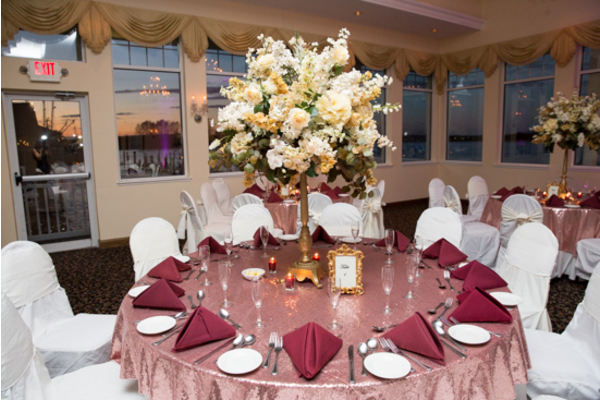 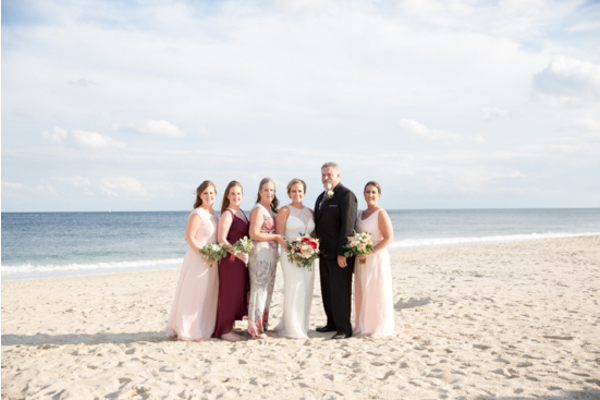 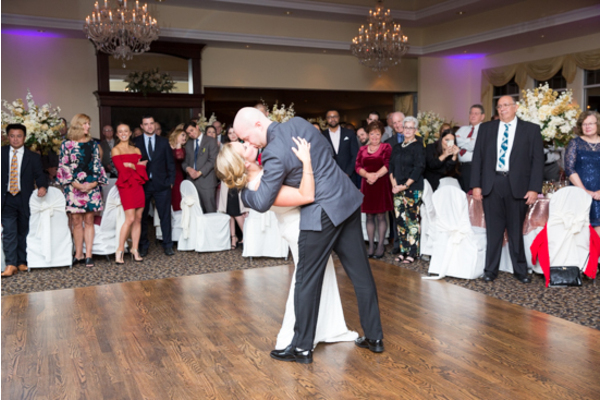 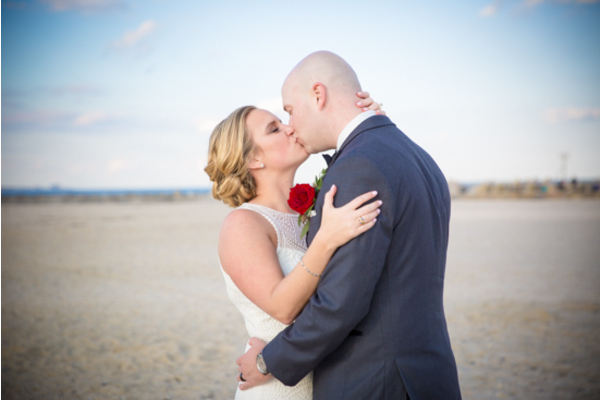 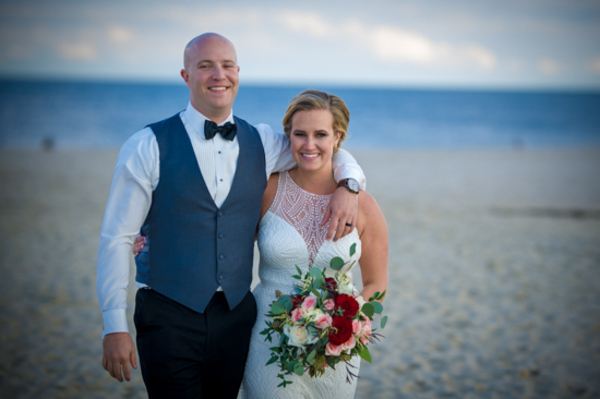 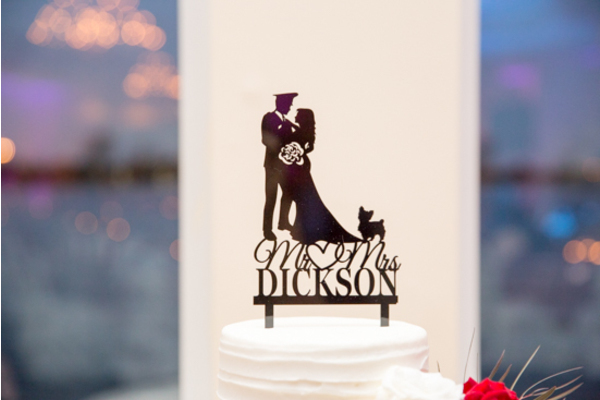 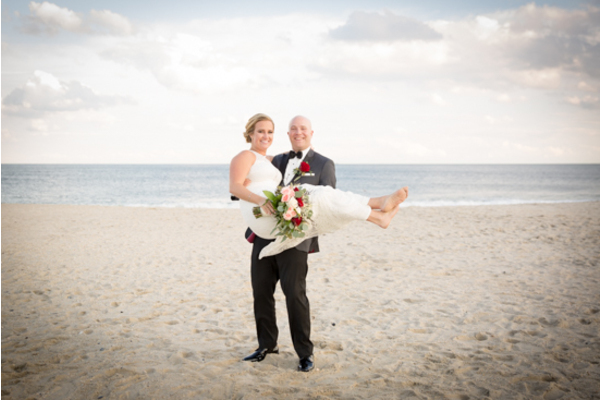 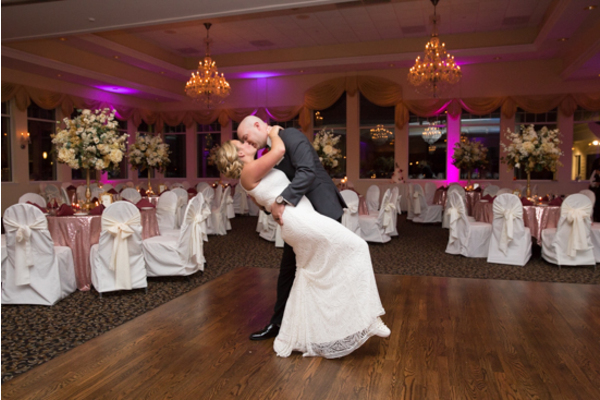 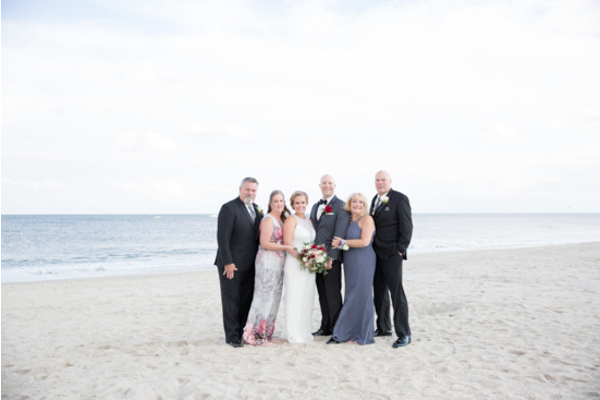 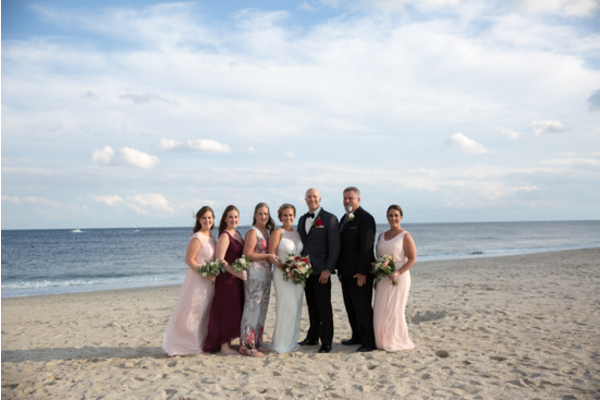 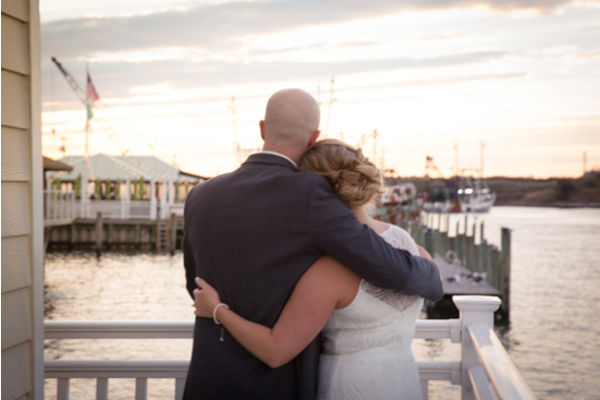 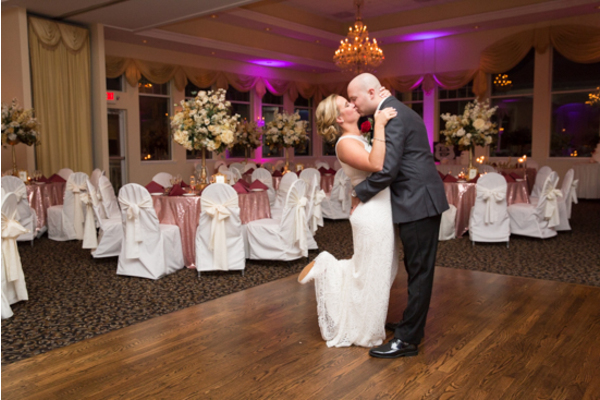 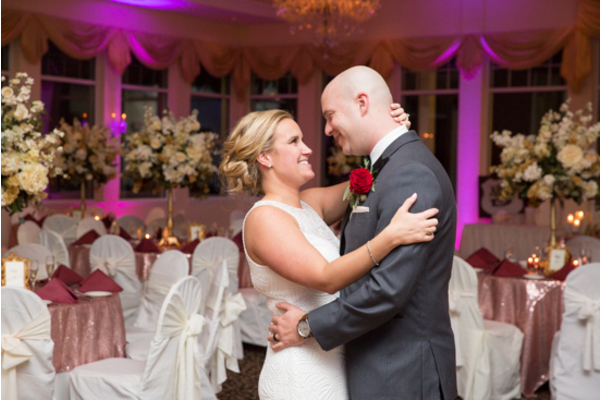 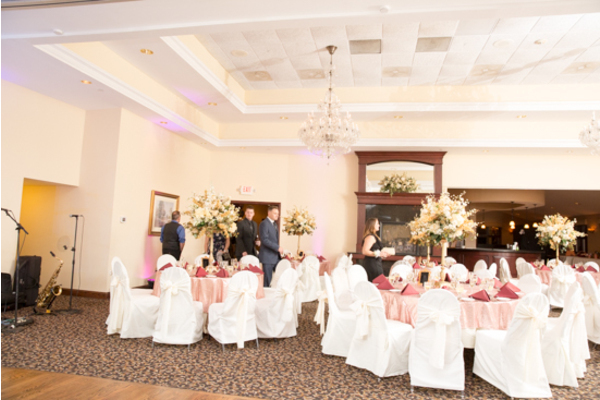 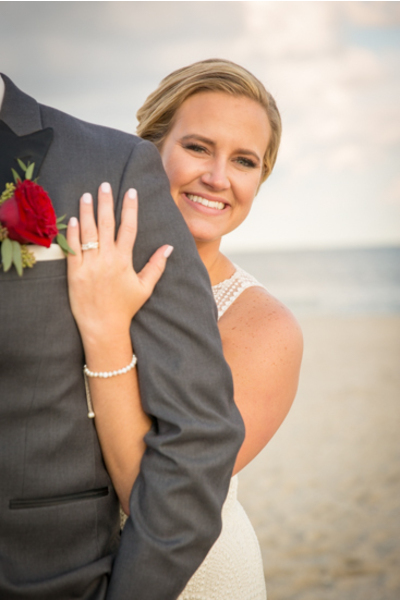 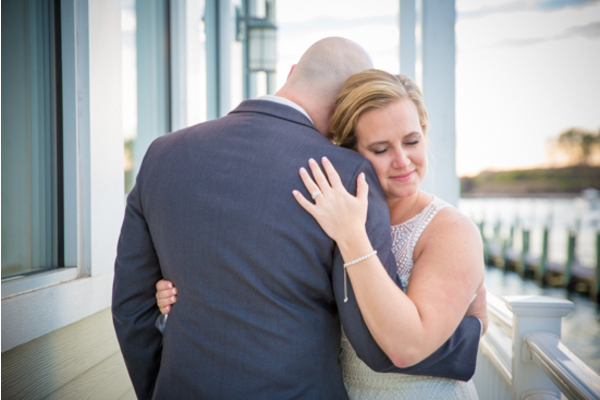 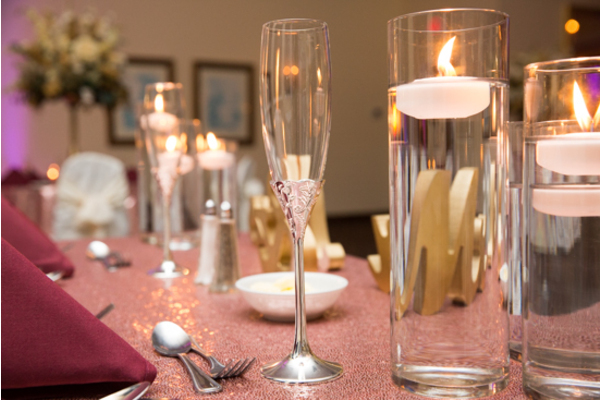 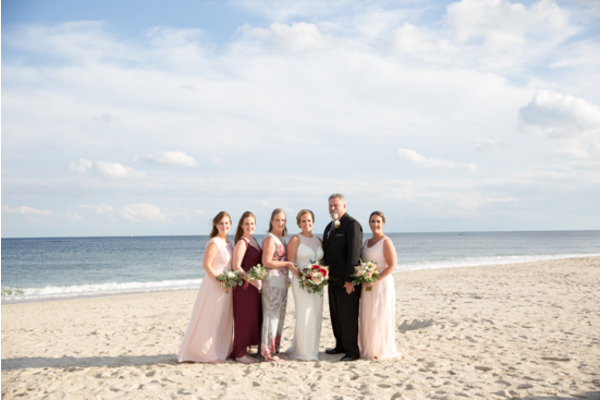 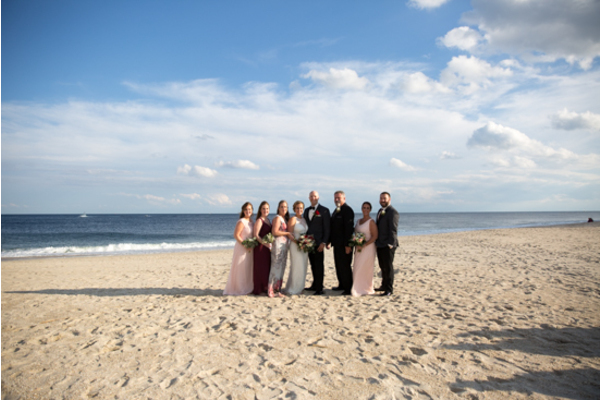 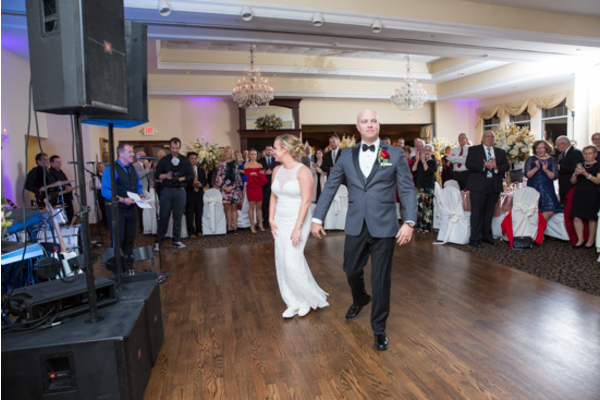 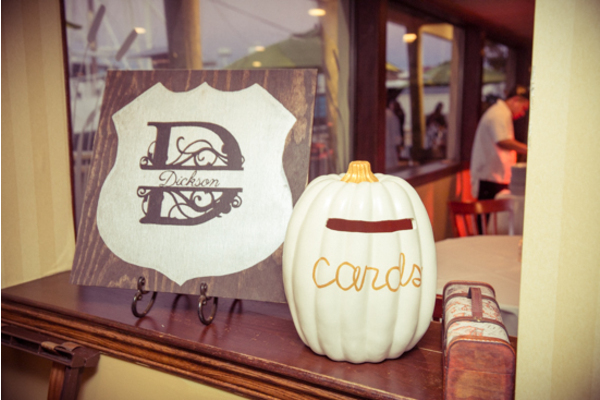 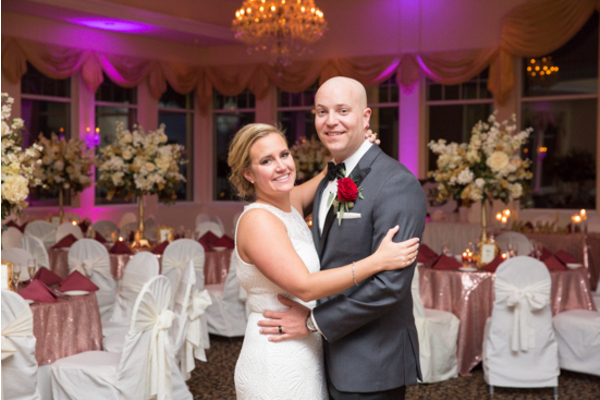 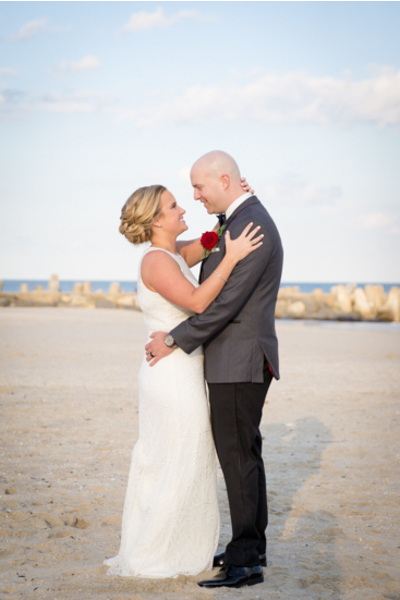 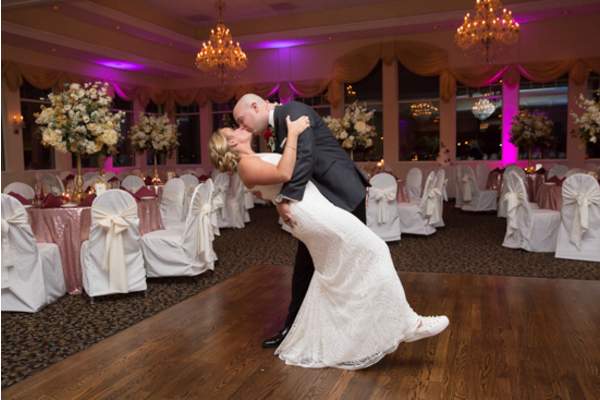 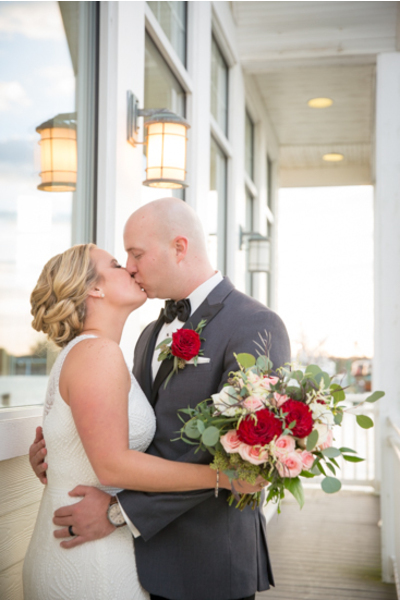 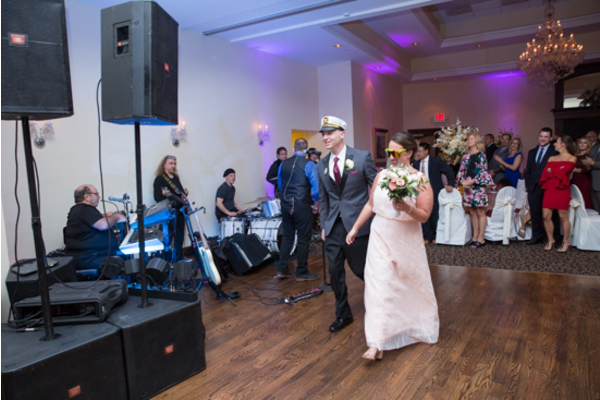 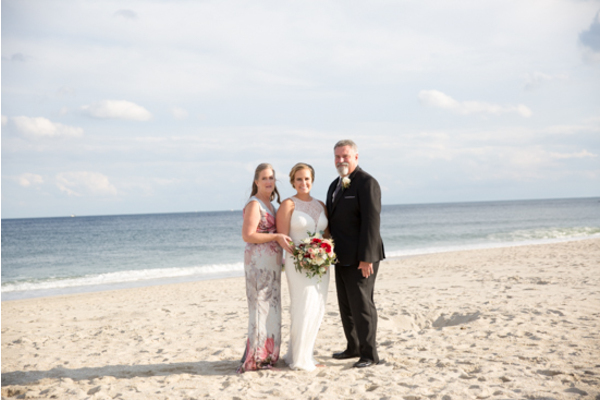 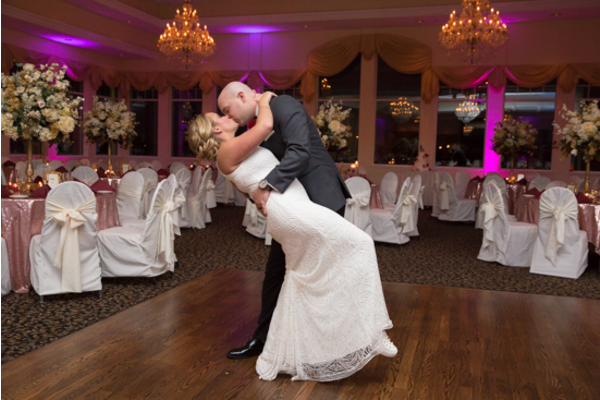 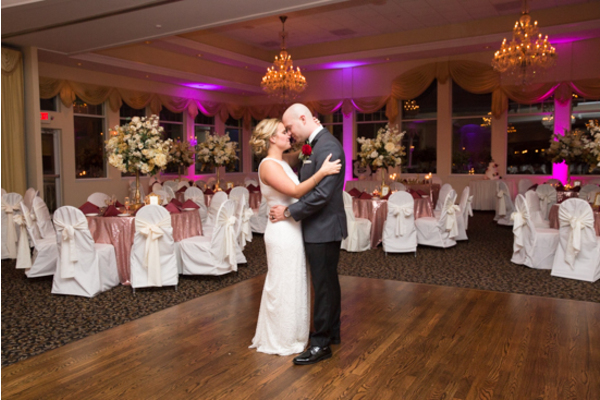 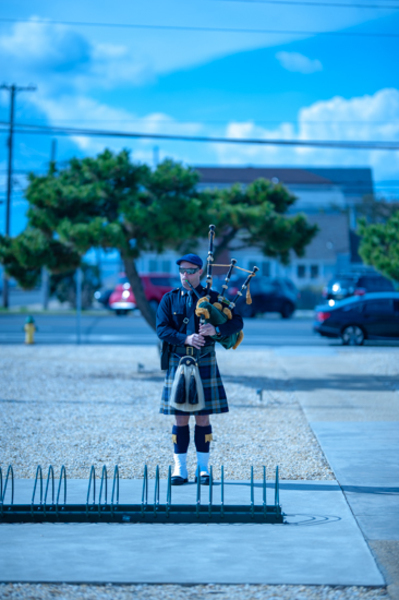 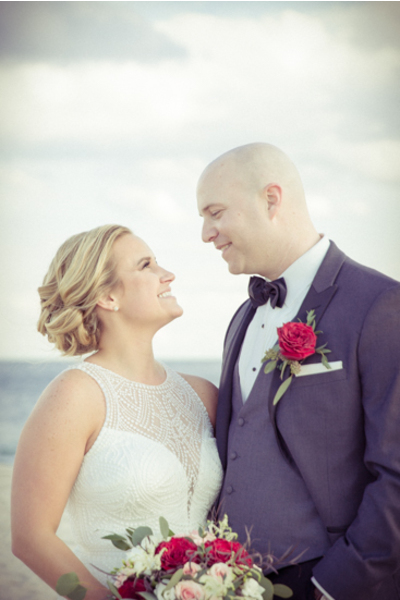 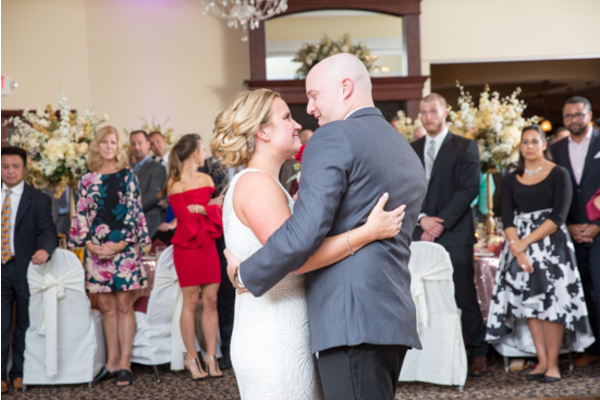 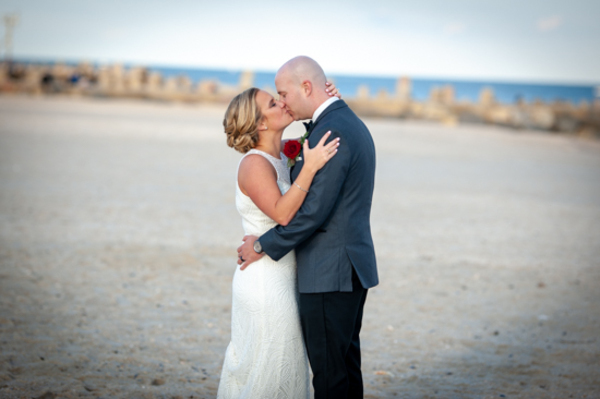 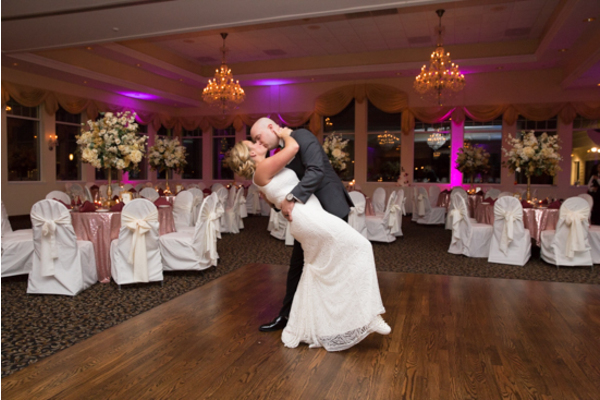 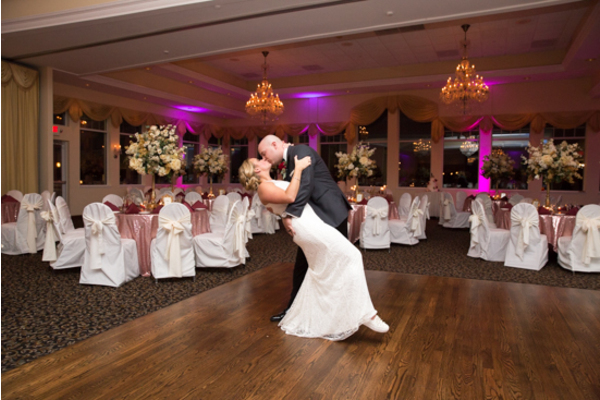 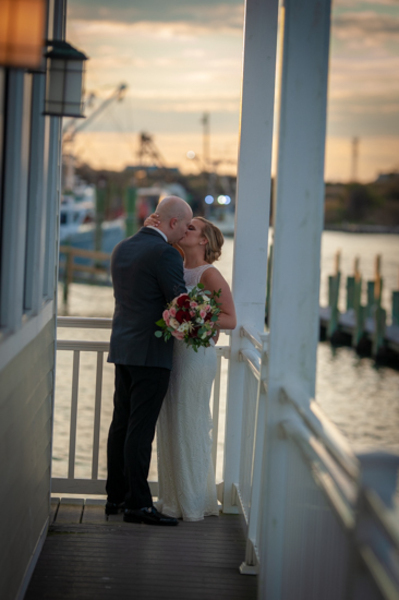 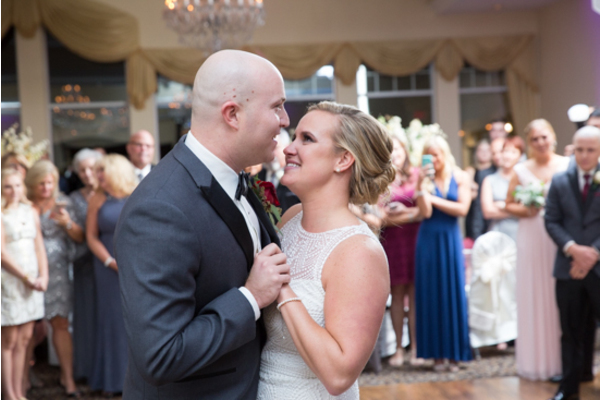 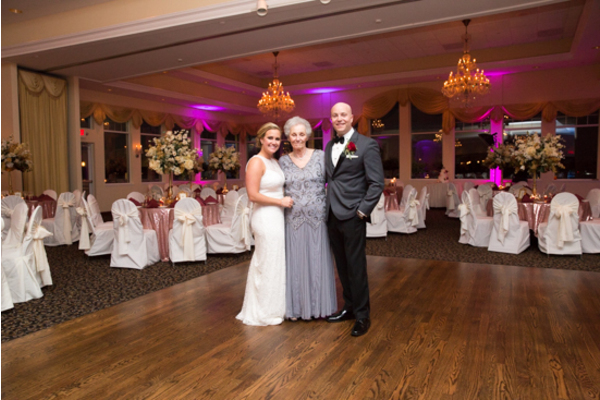 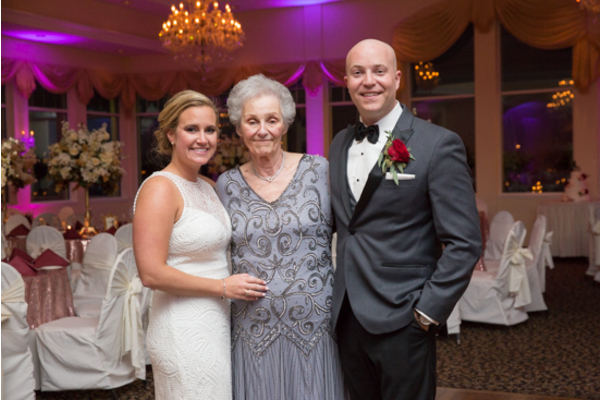 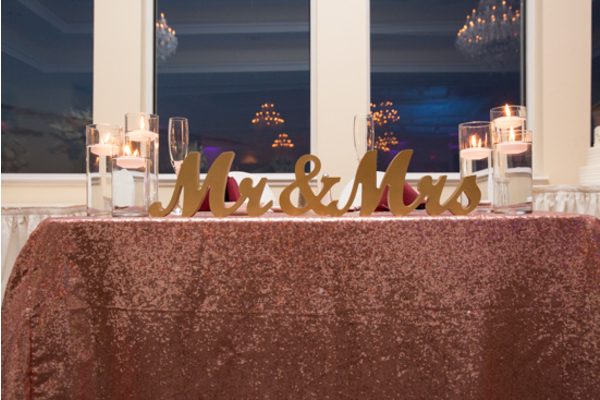 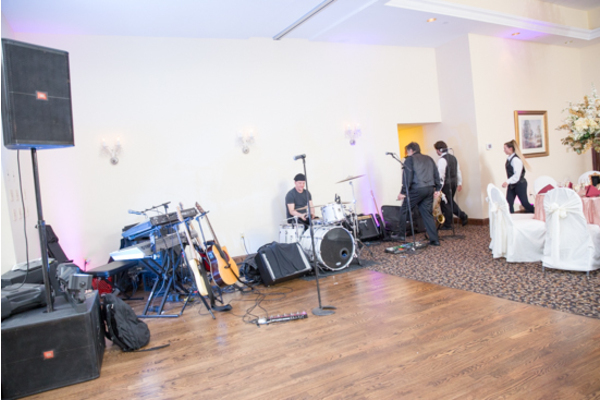 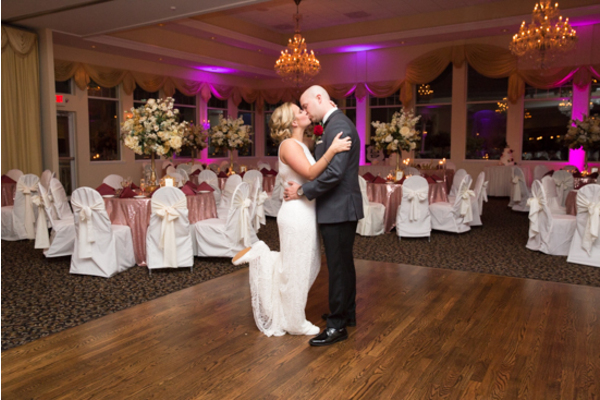 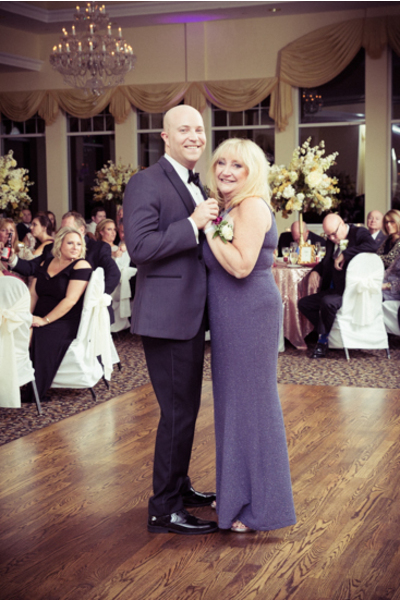 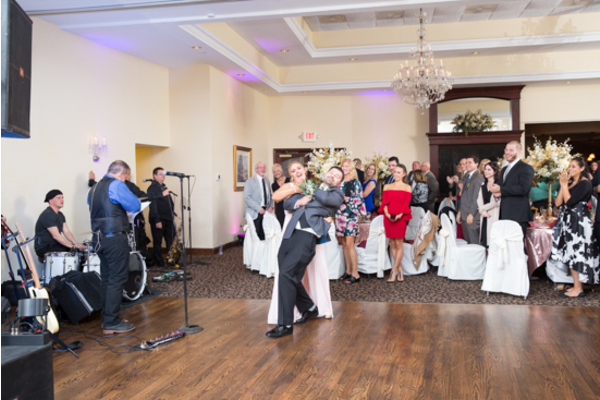 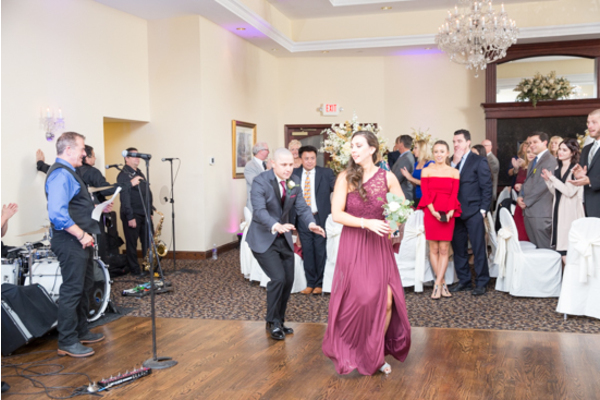 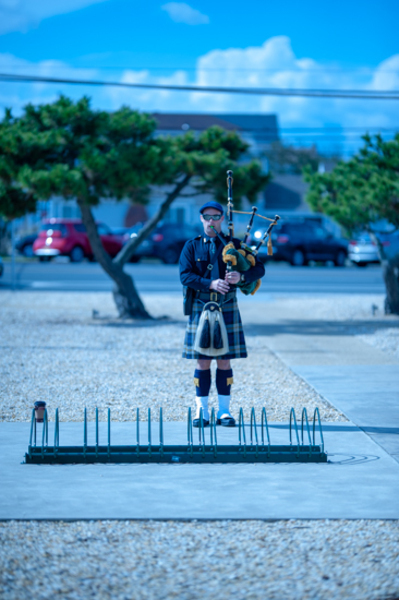 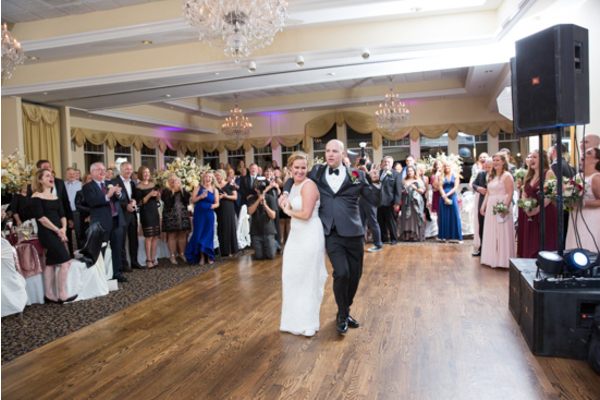 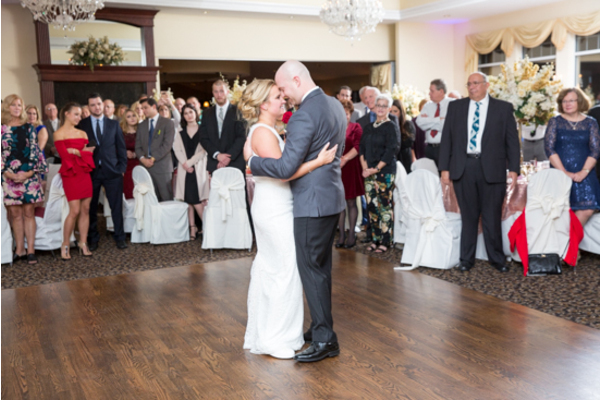 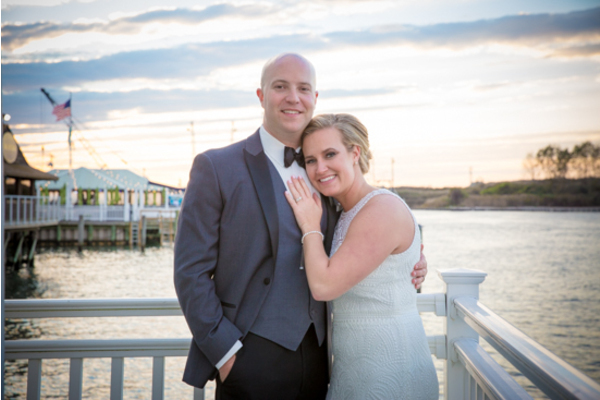 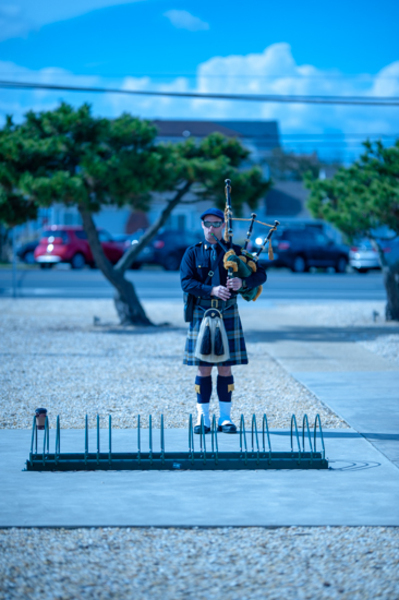 This lovely couple got married this past October at Jack Baker’s Lobster Shanty Sunset Ballroom in Point Pleasant, NJ. 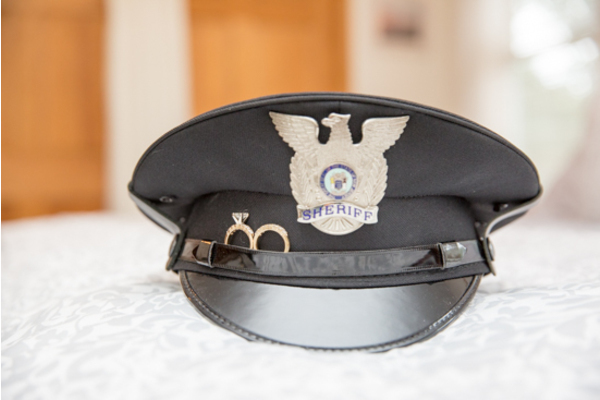 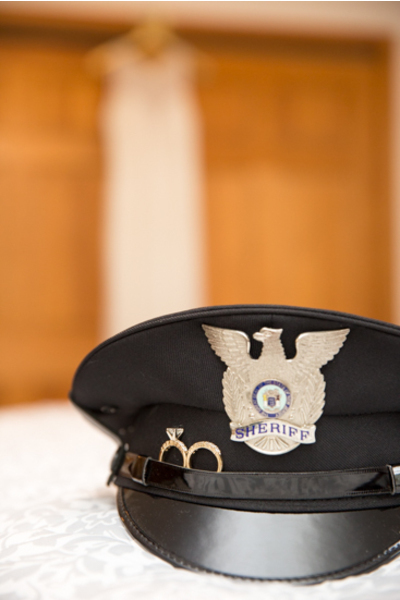 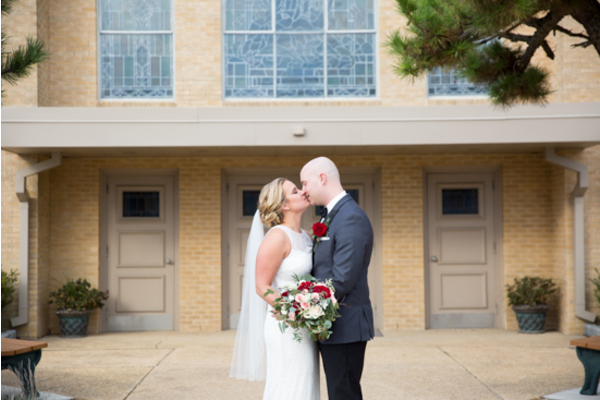 These two started their day off surrounded by their loved ones. 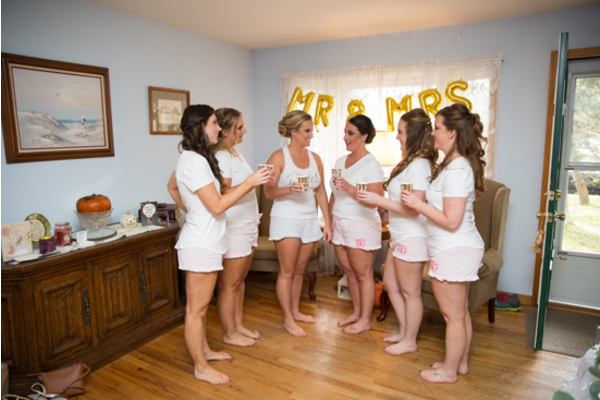 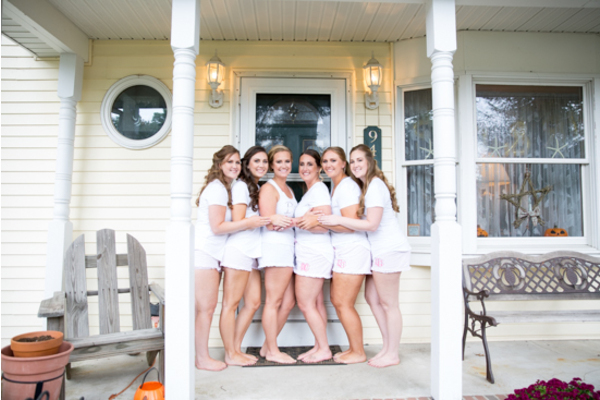 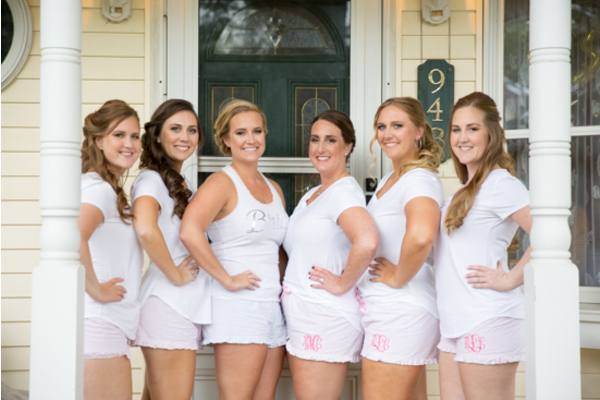 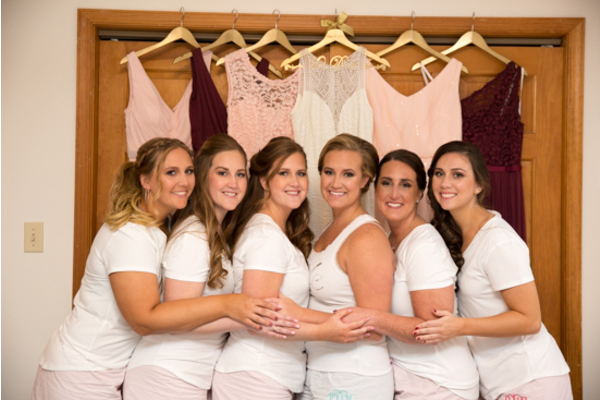 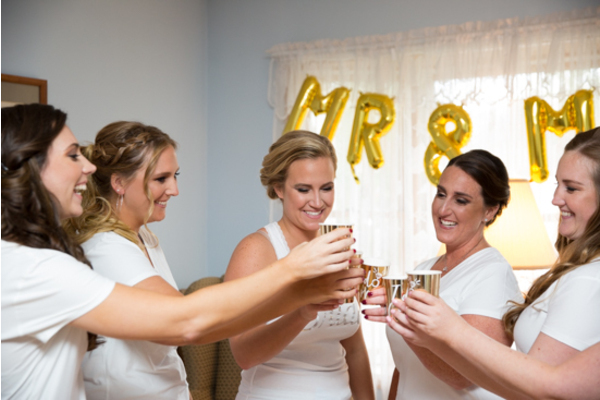 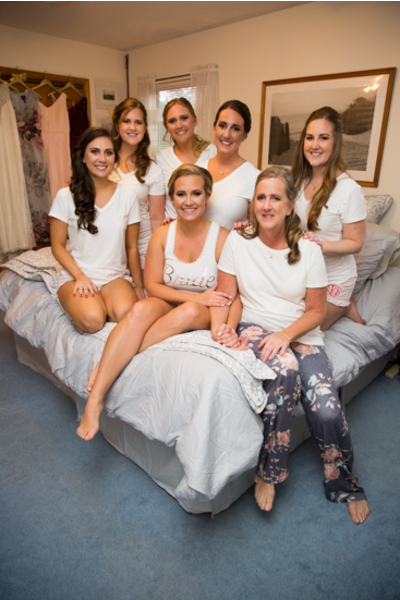 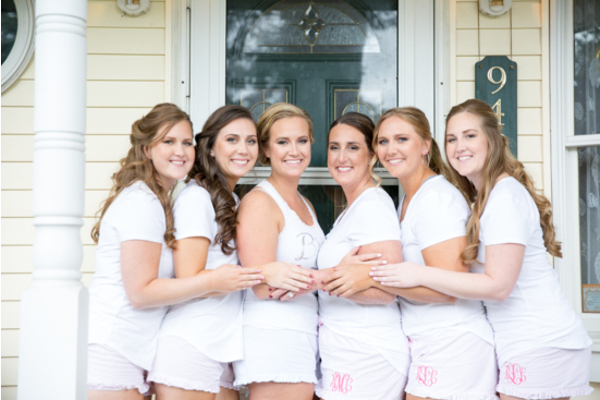 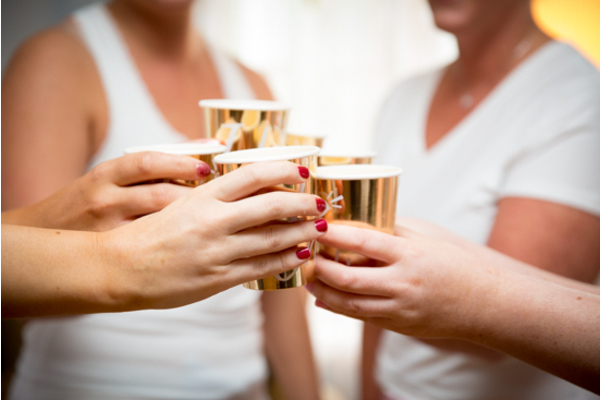 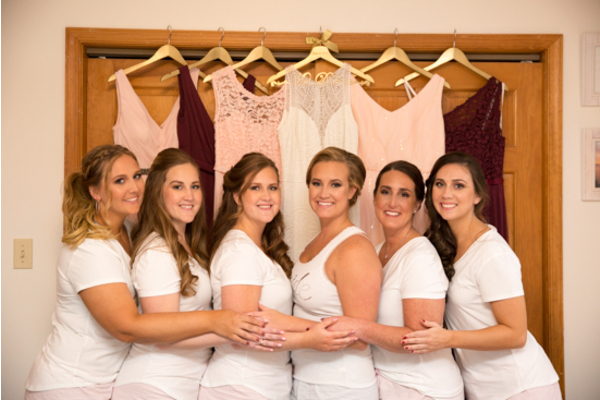 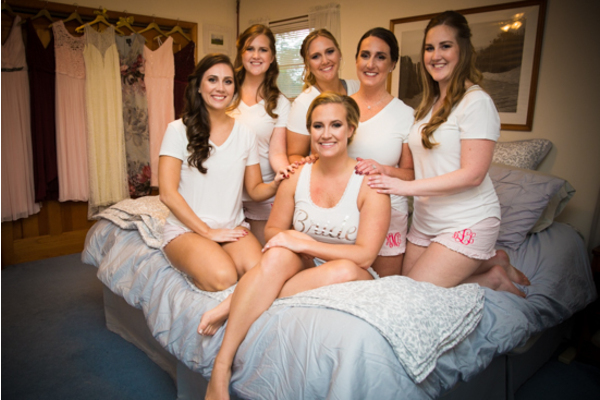 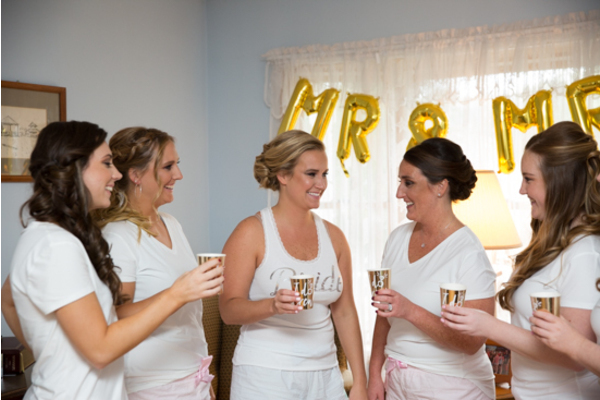 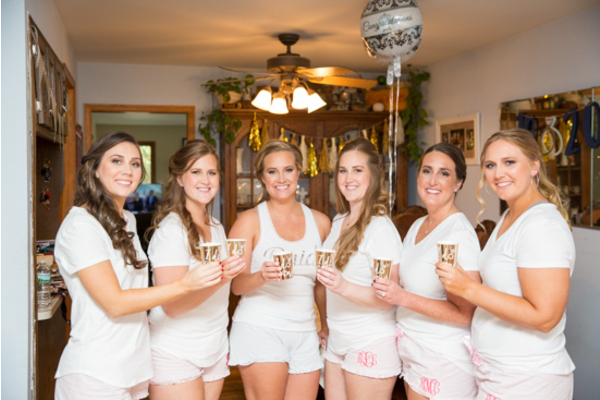 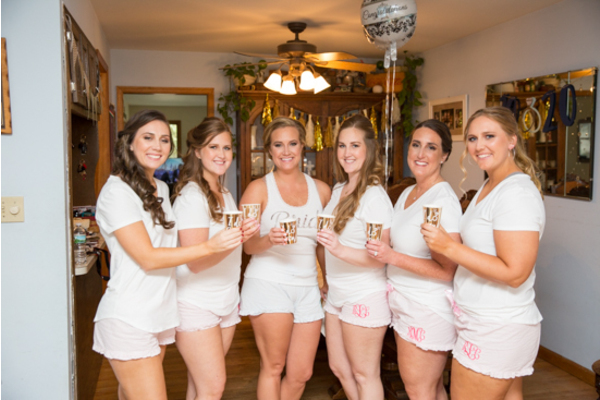 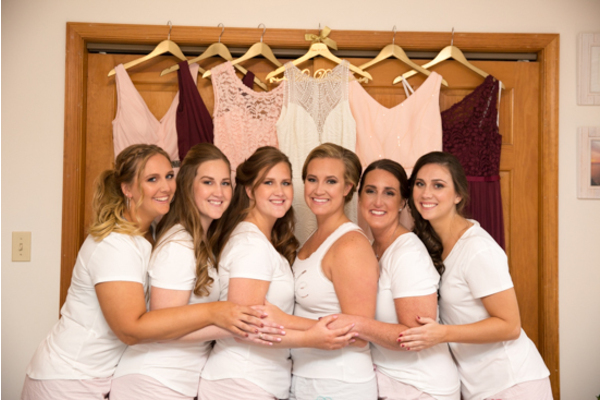 Firstly, Kelly and her bridesmaids shared some champagne in their matching white outfits. 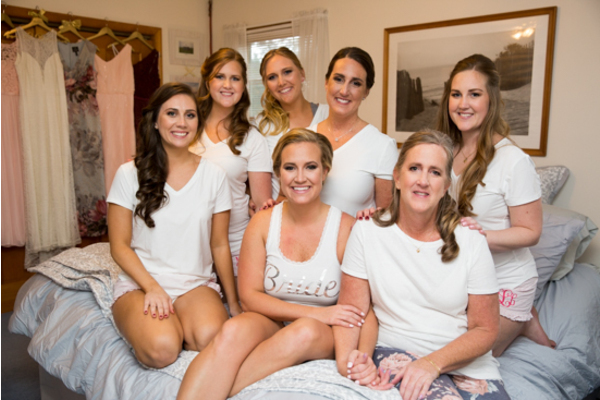 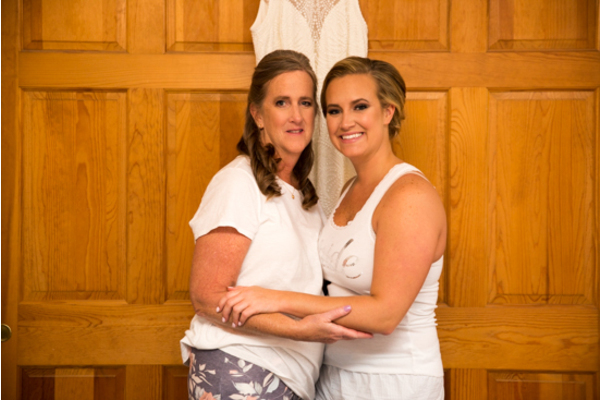 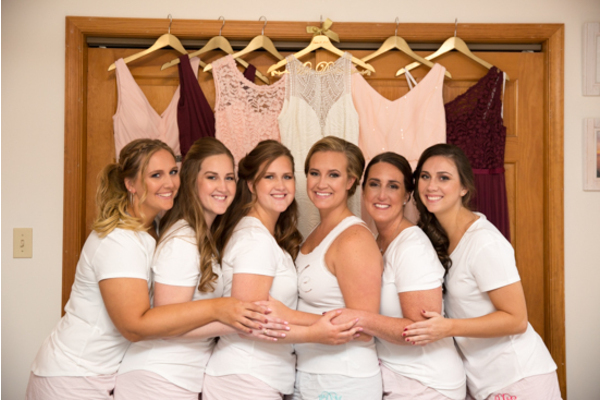 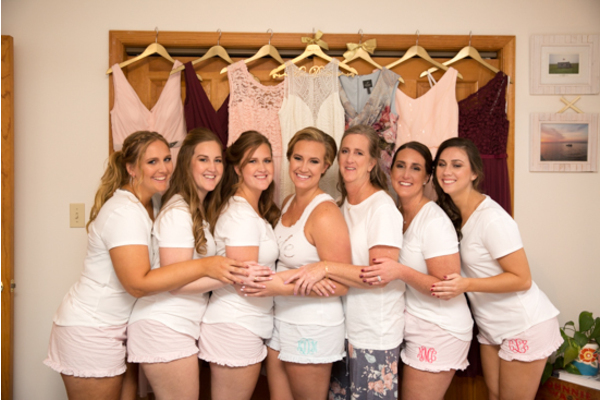 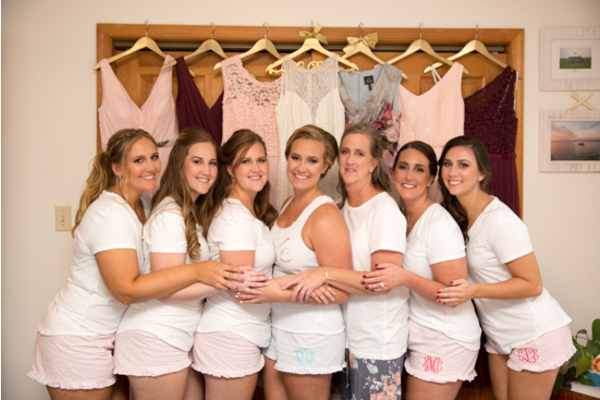 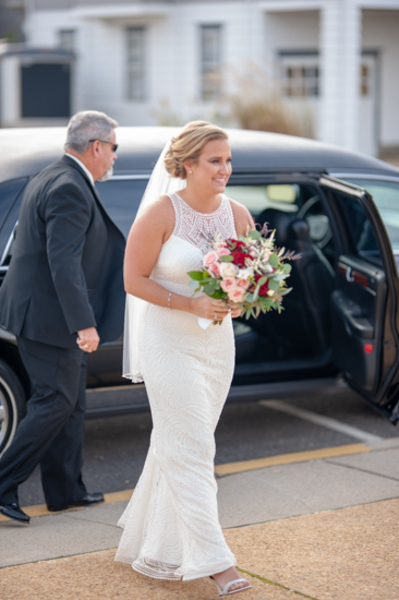 With the careful help from her girls, Kelly’s outfit was all in place as she excitedly made her way outside for her first look! 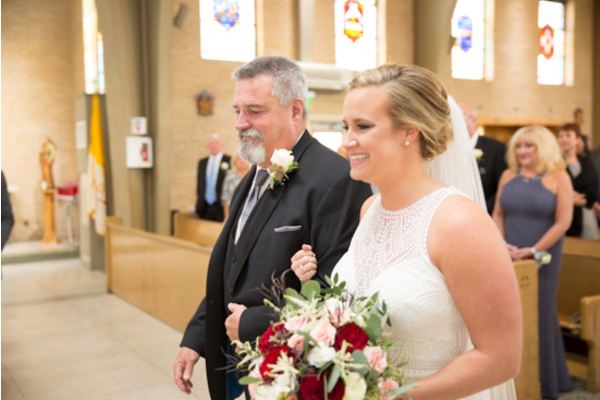 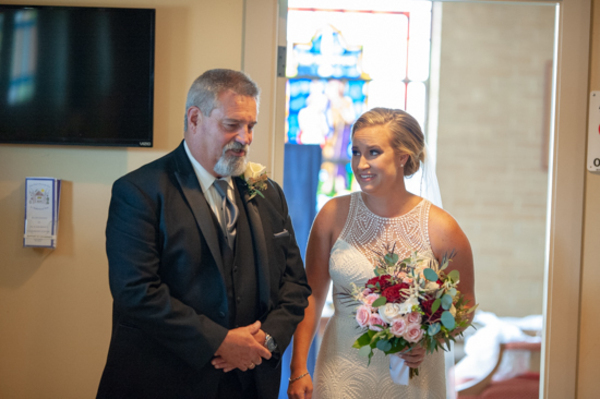 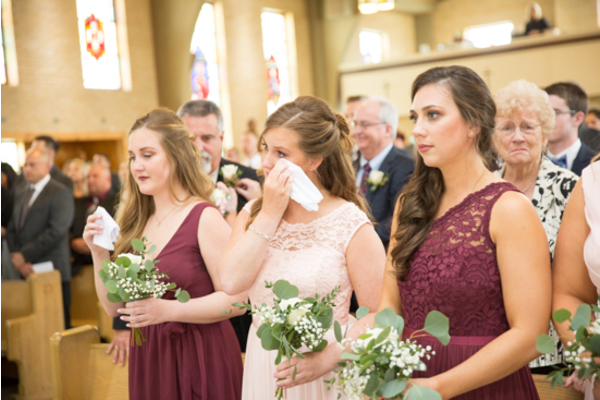 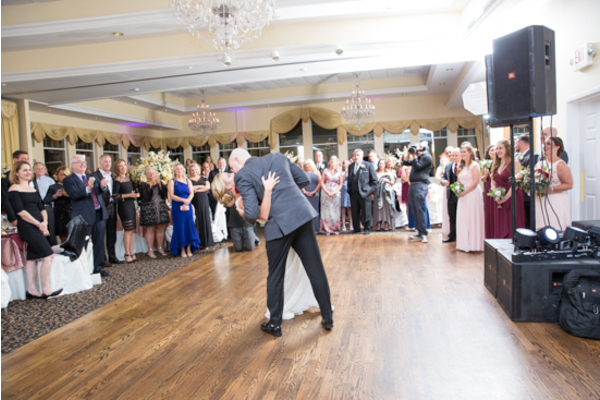 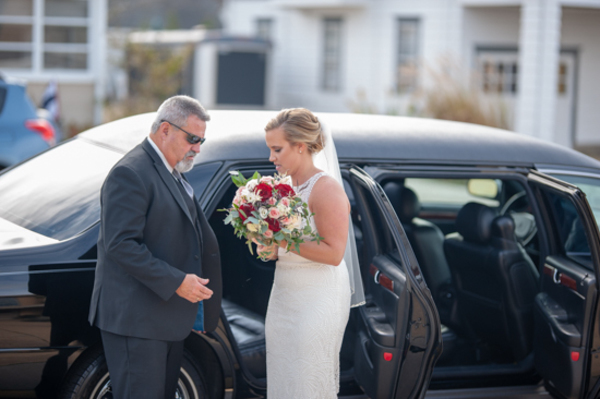 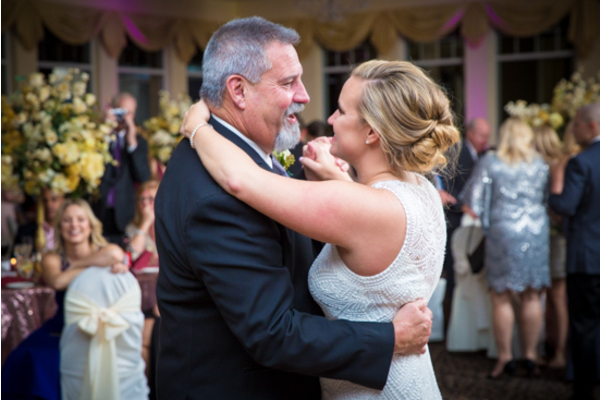 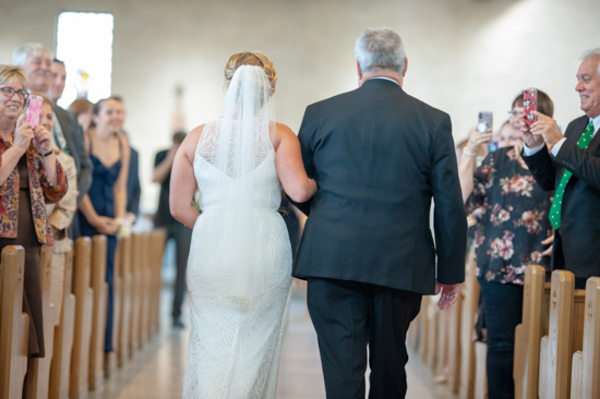 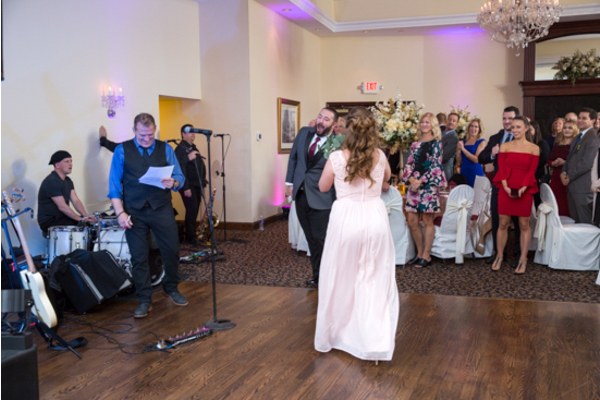 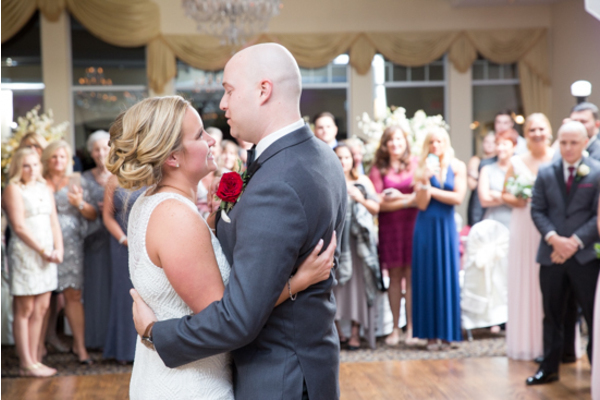 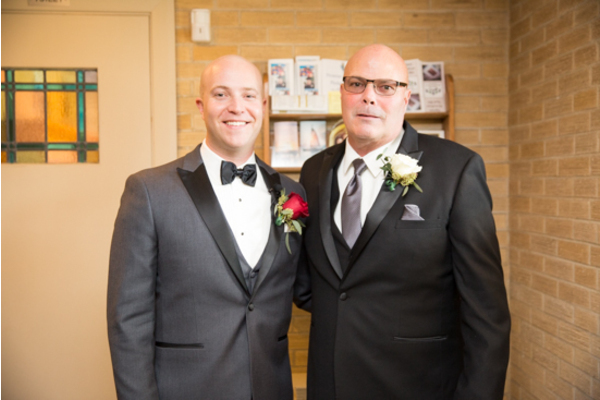 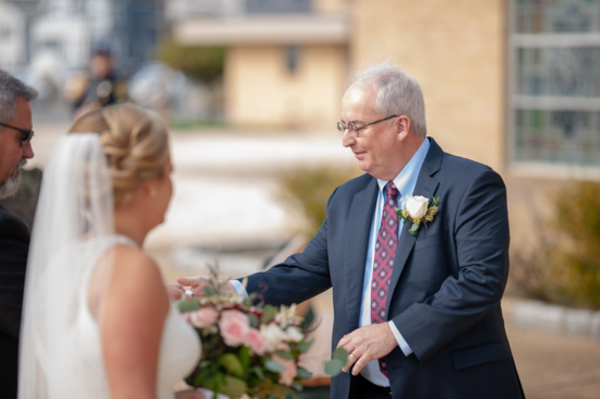 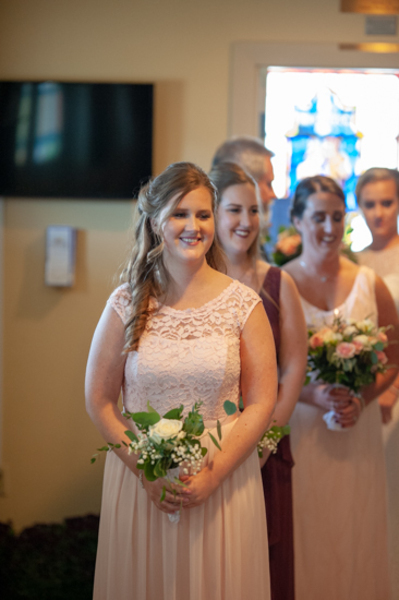 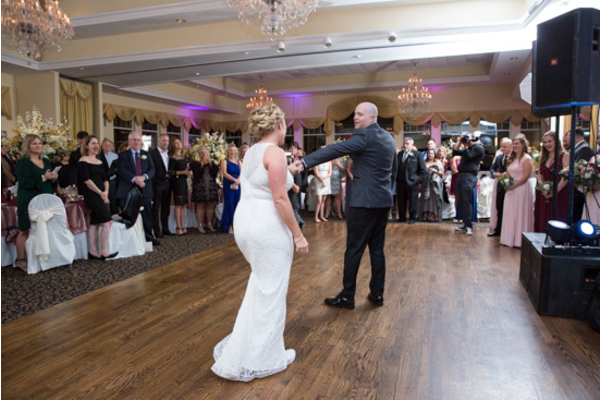 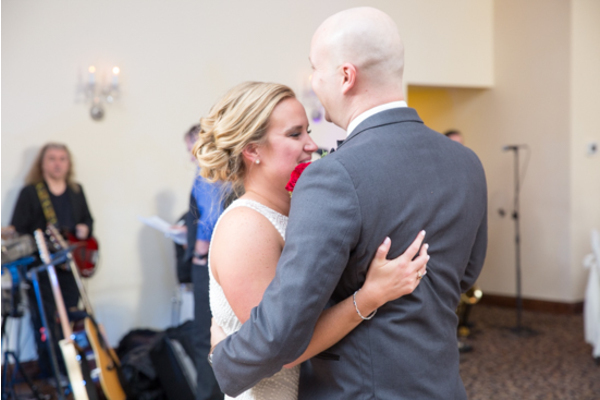 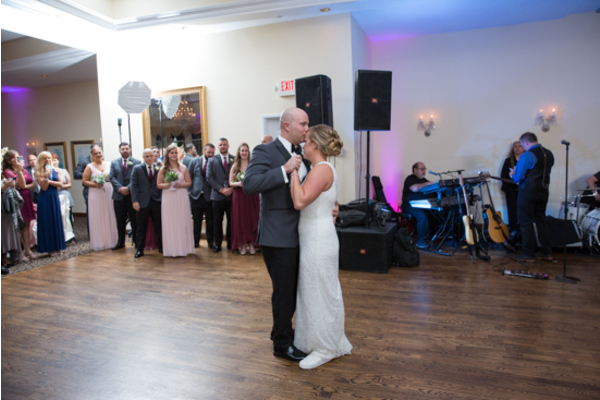 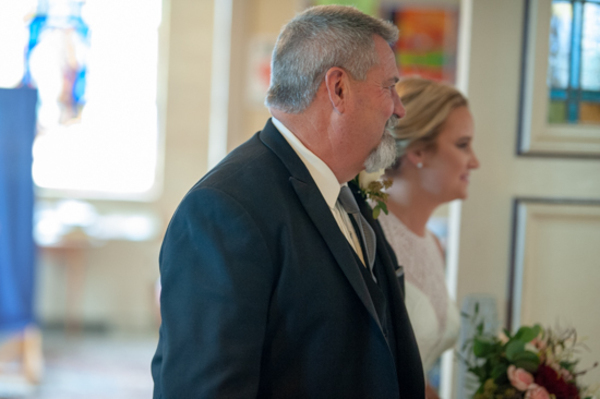 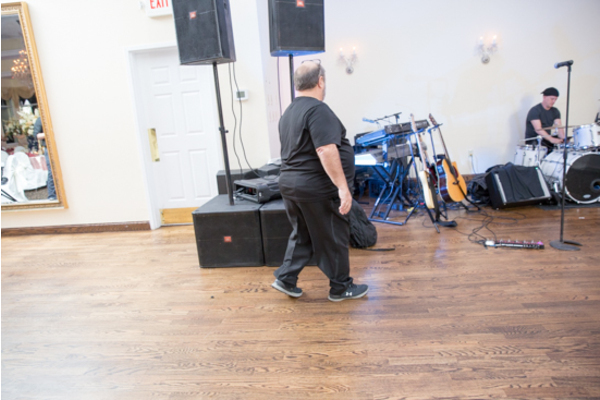 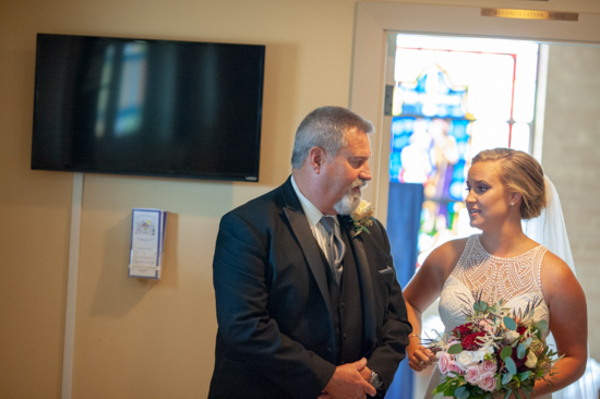 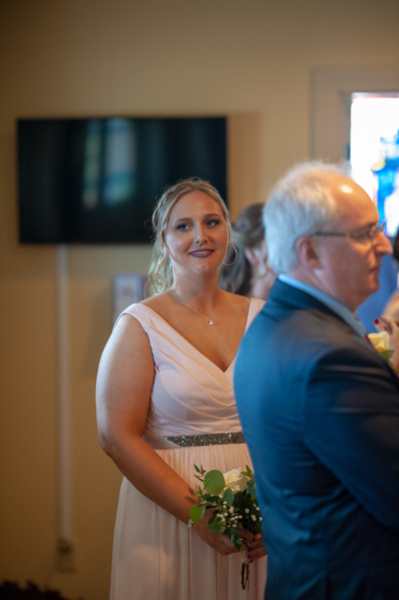 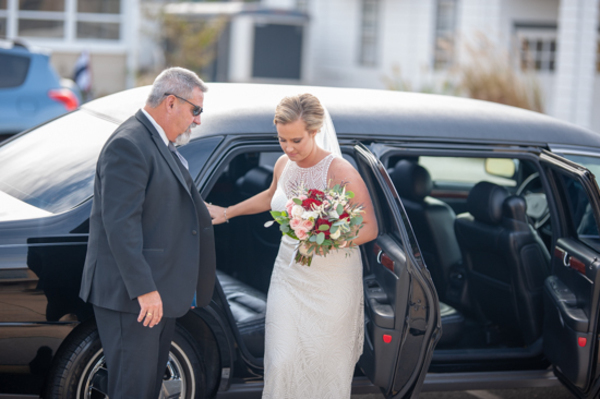 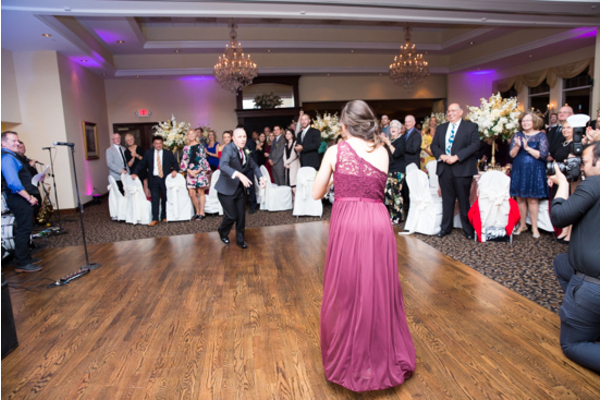 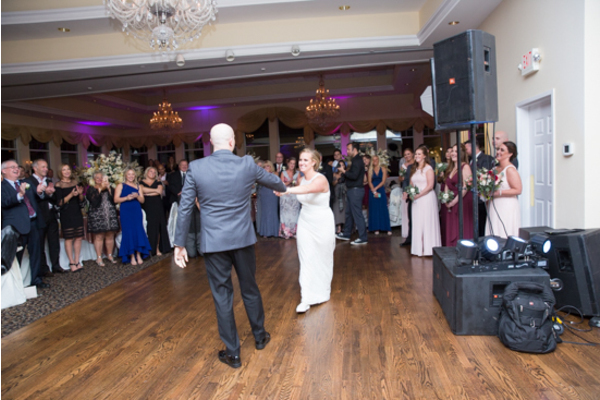 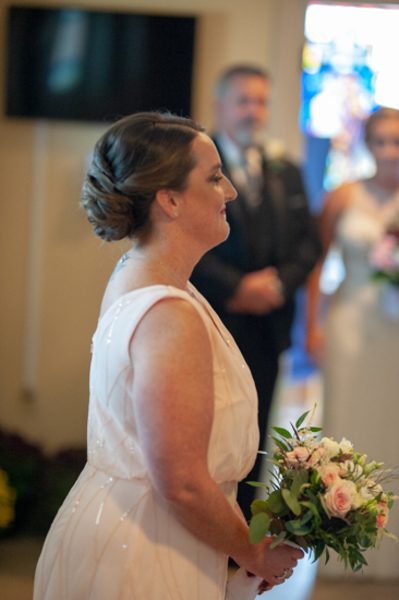 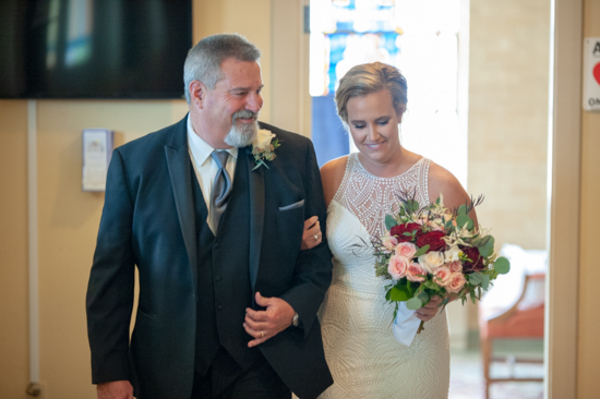 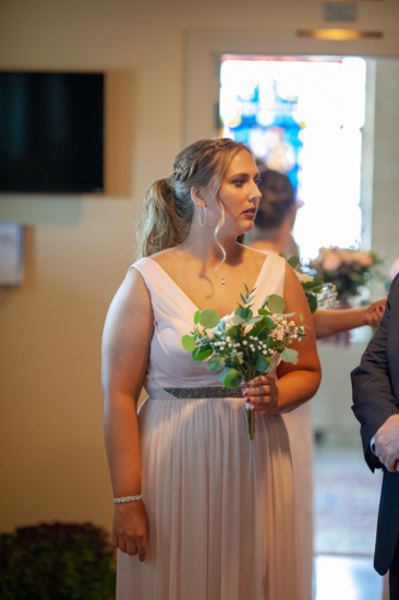 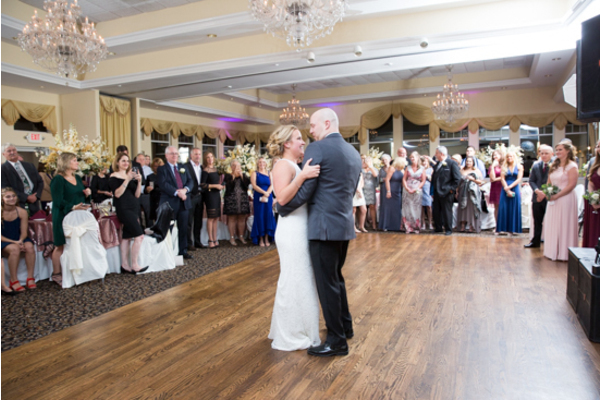 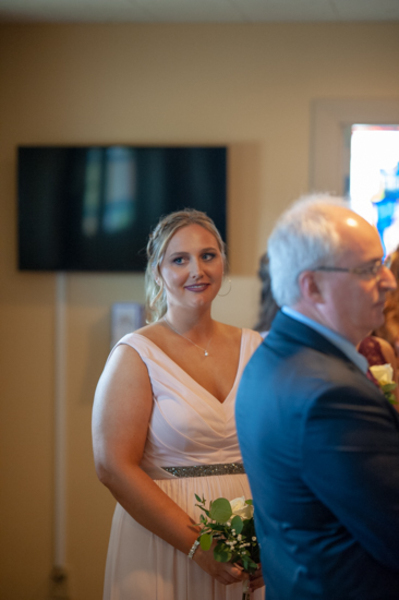 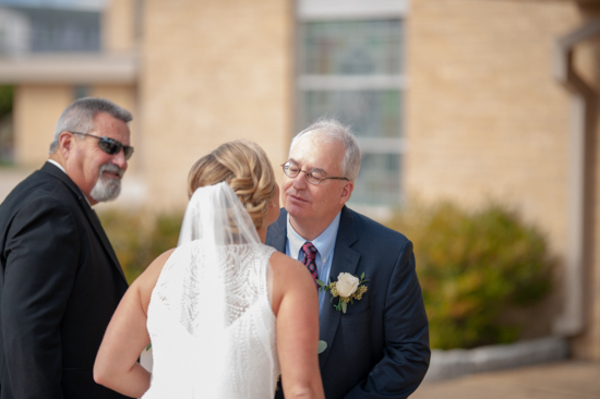 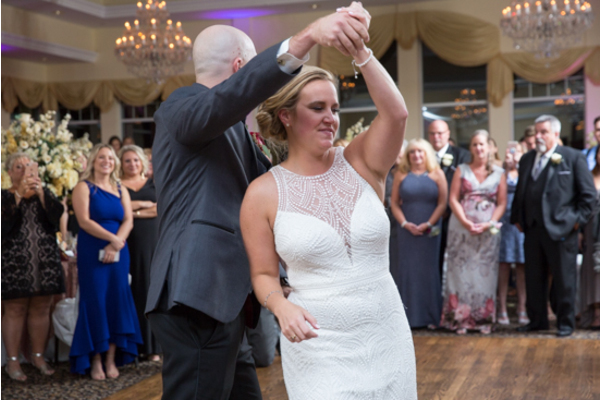 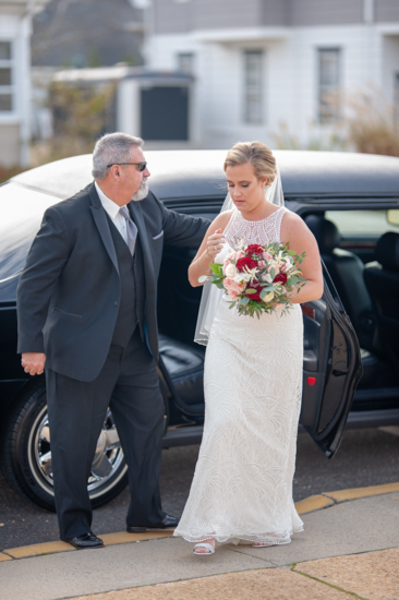 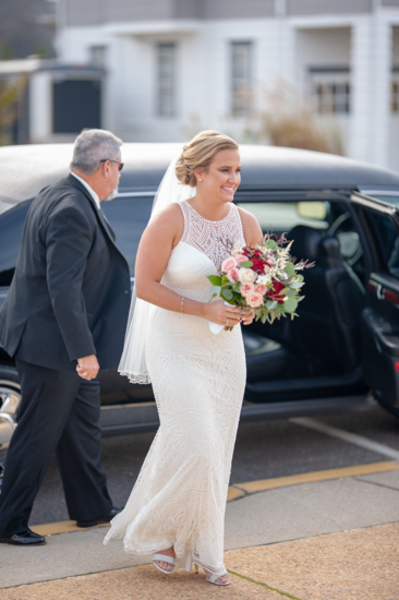 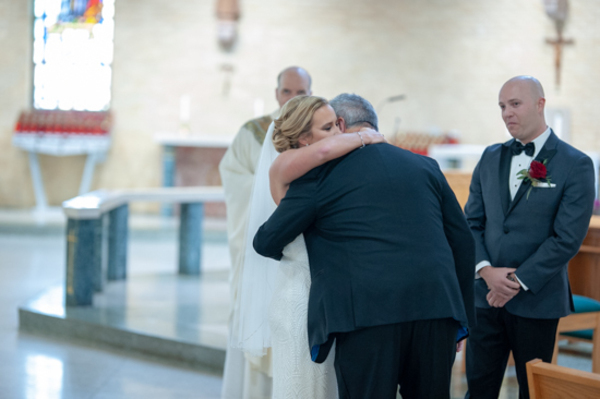 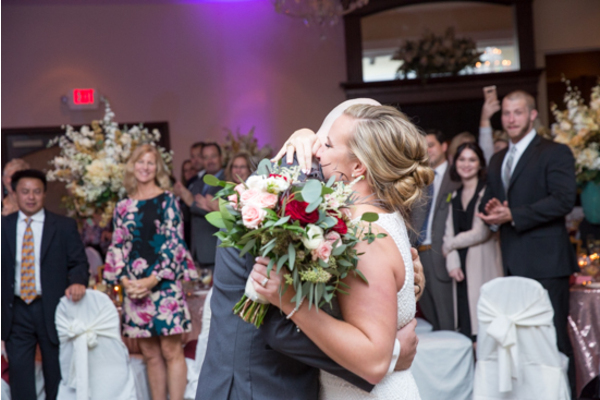 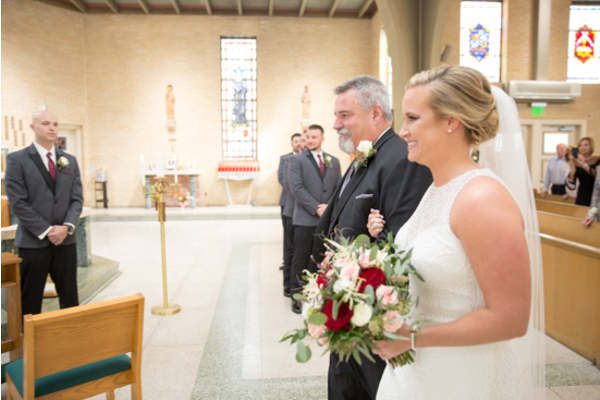 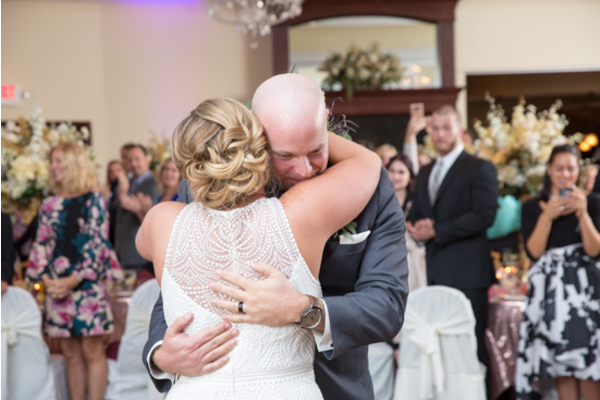 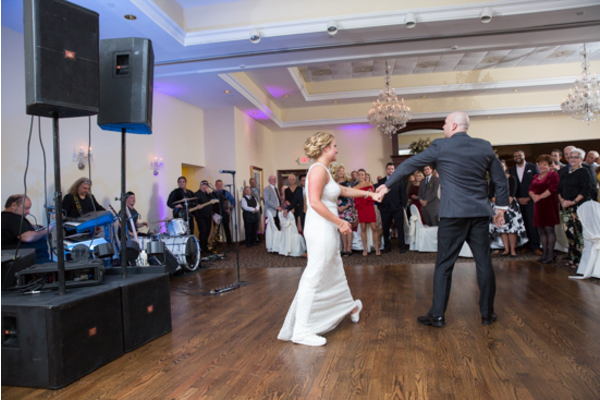 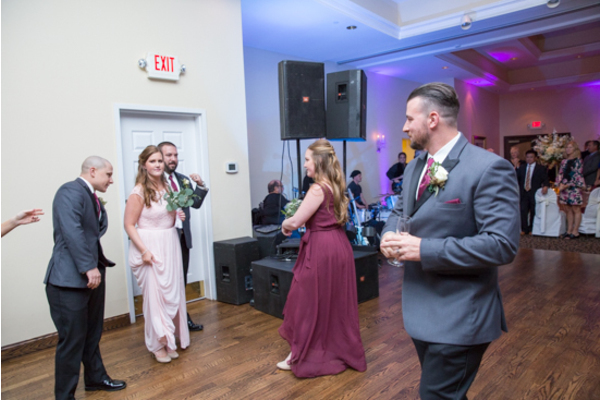 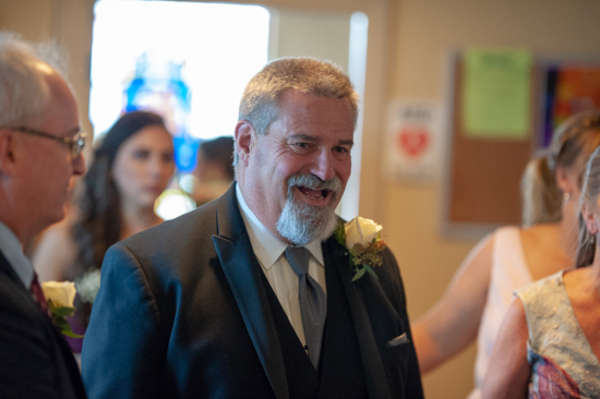 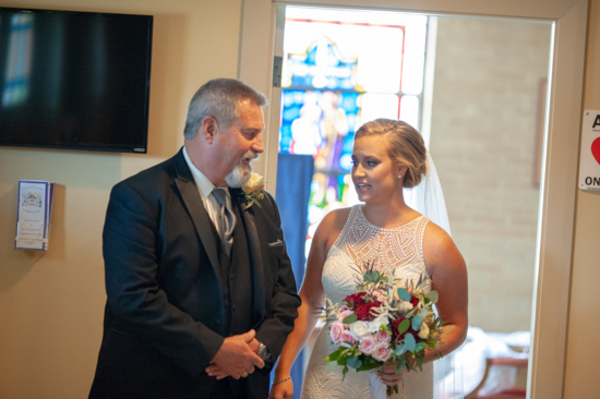 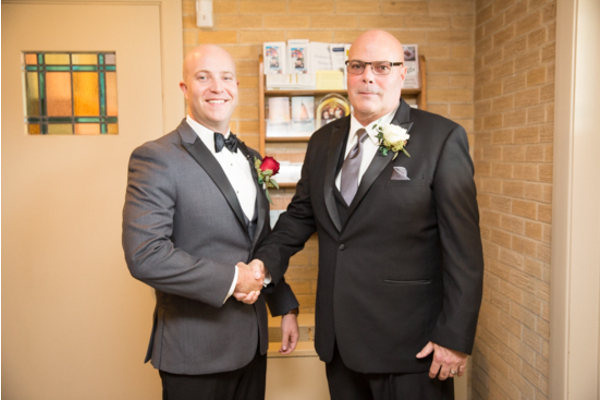 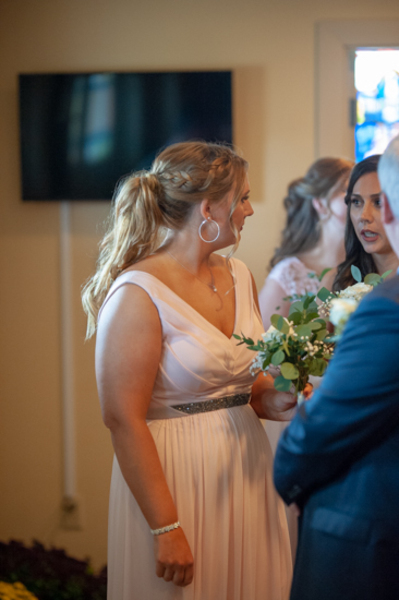 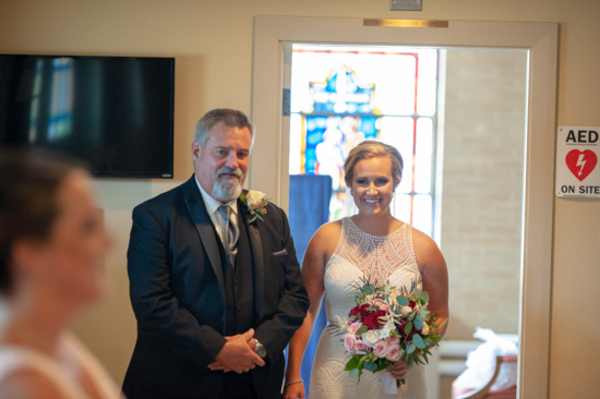 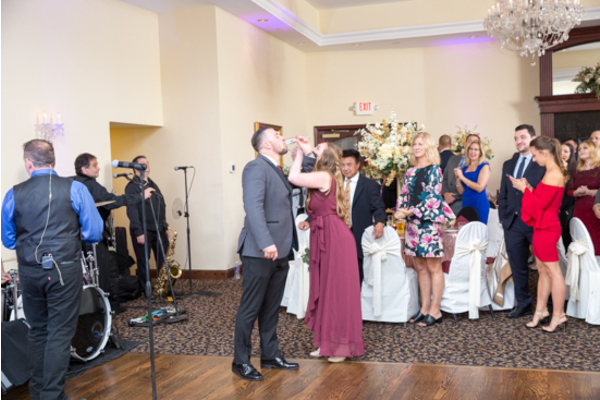 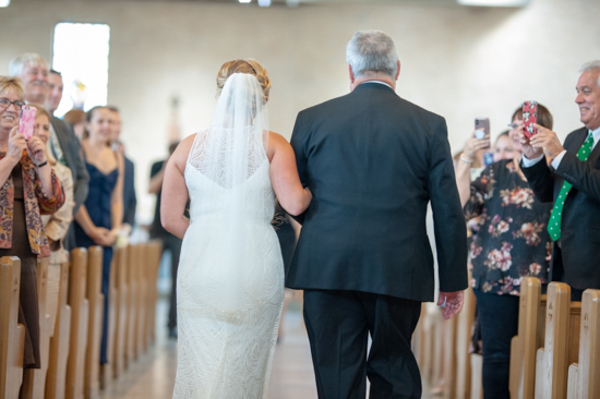 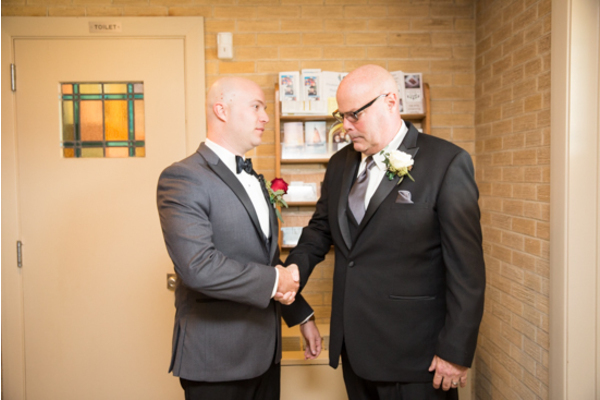 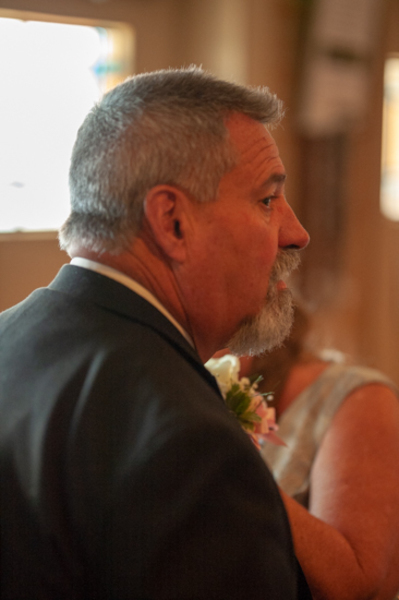 Our NJ Wedding Photographer captured the beautiful emotional moment shared between father and daughter as he first saw her. 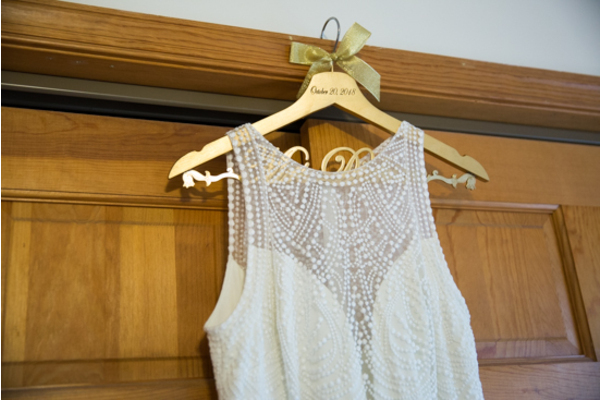 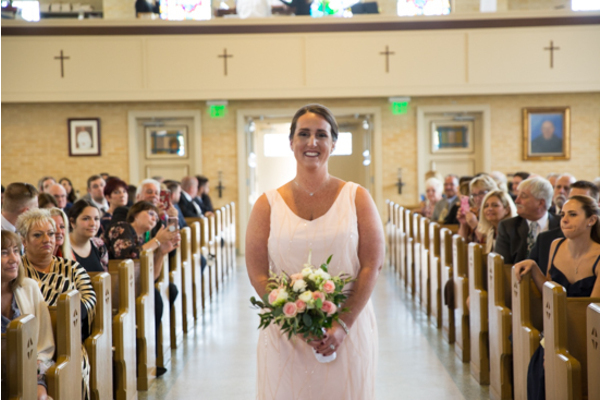 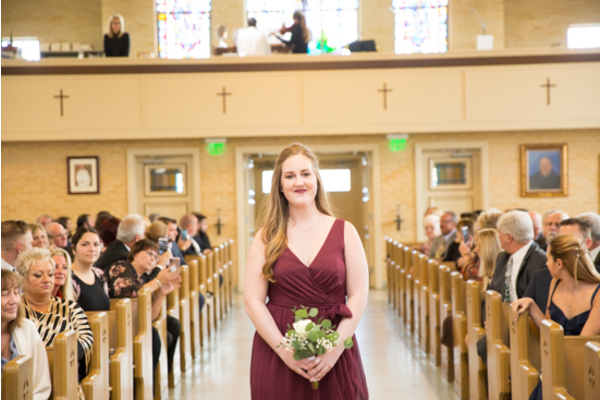 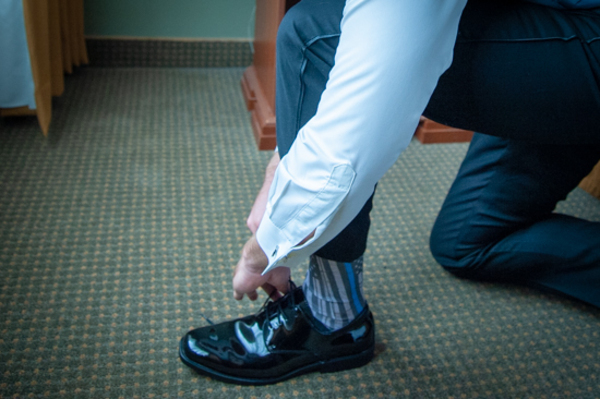 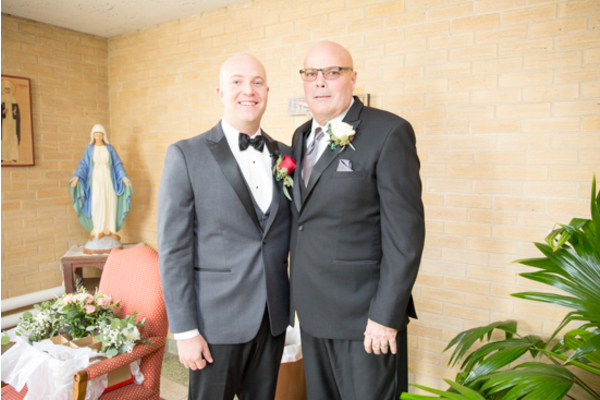 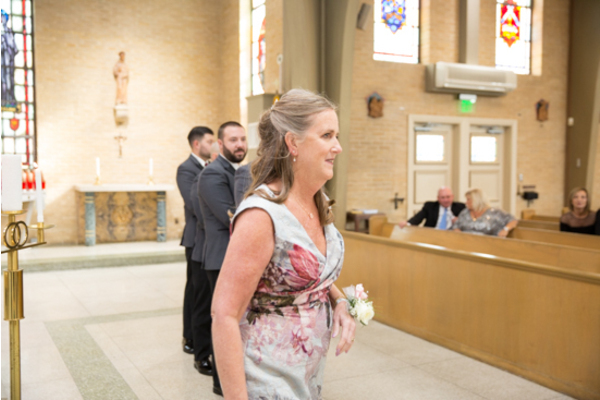 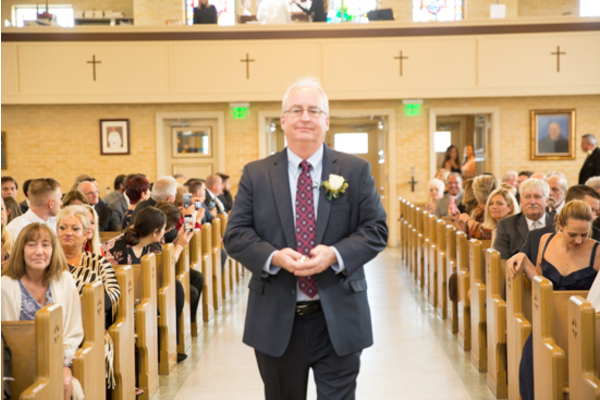 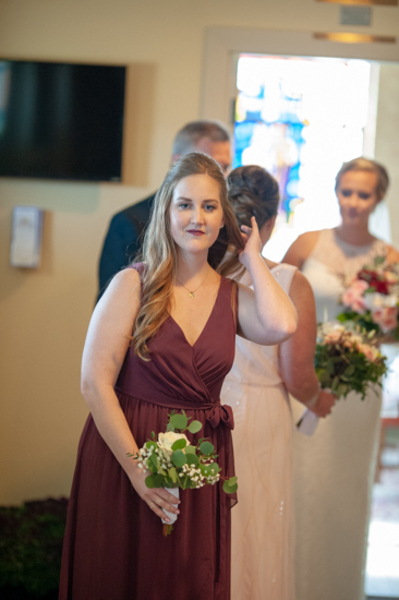 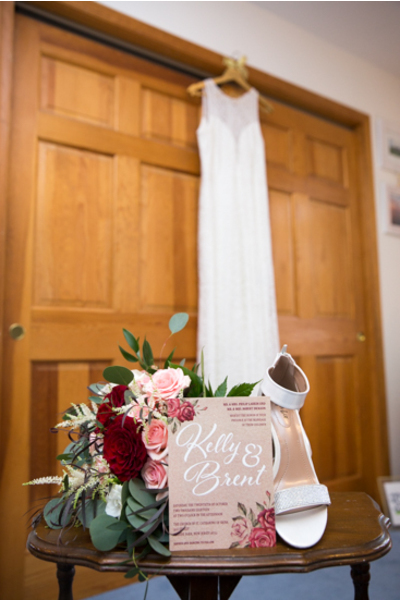 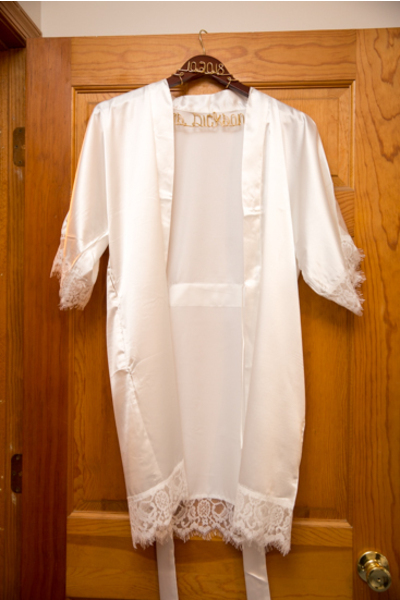 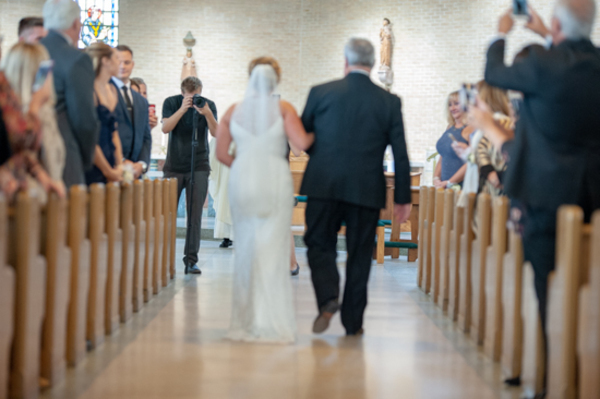 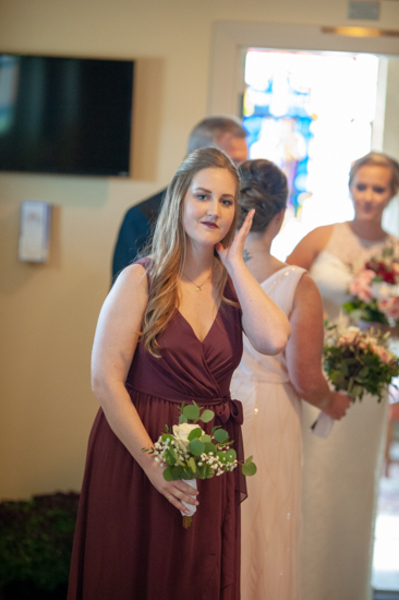 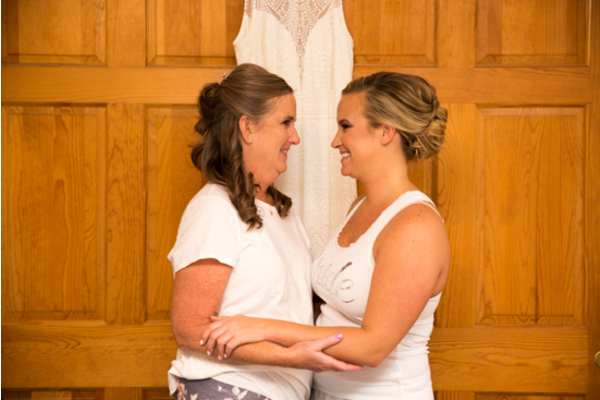 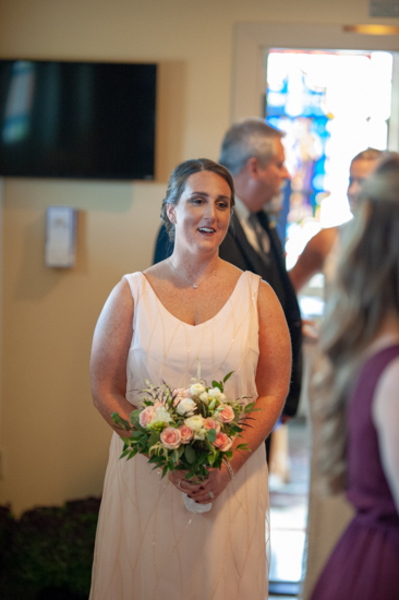 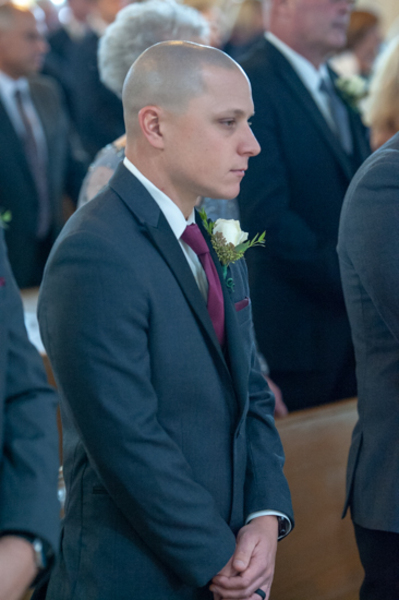 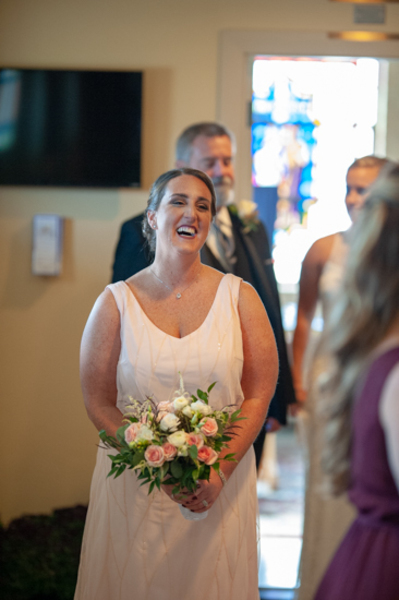 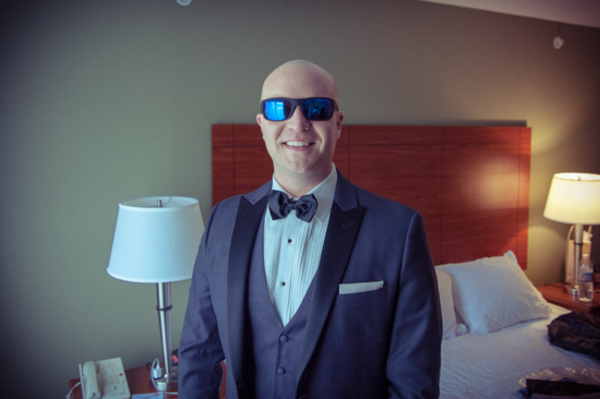 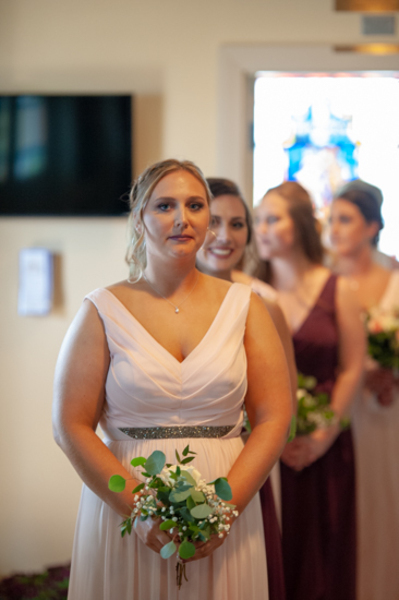 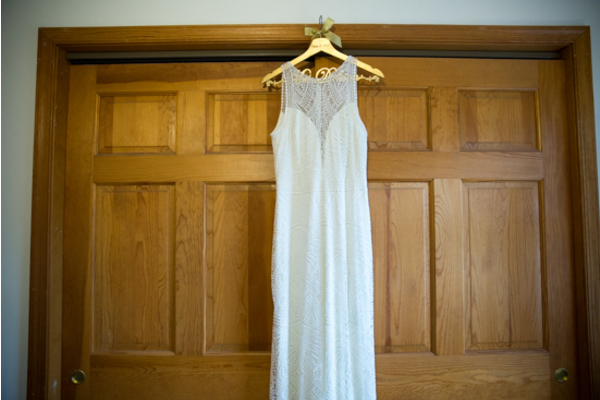 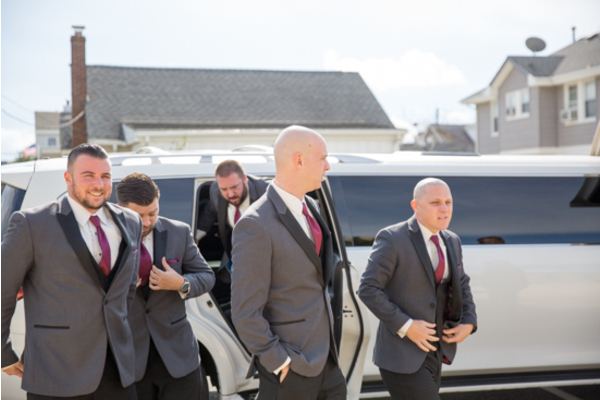 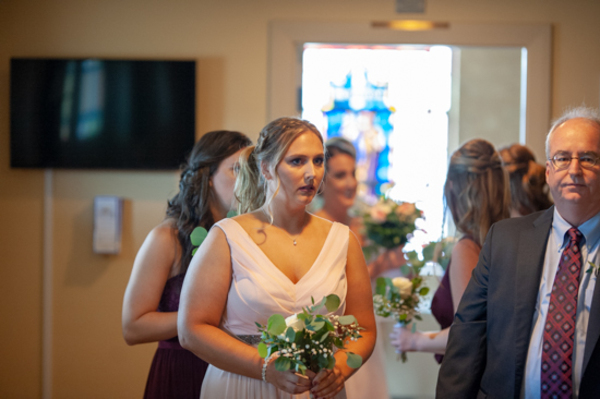 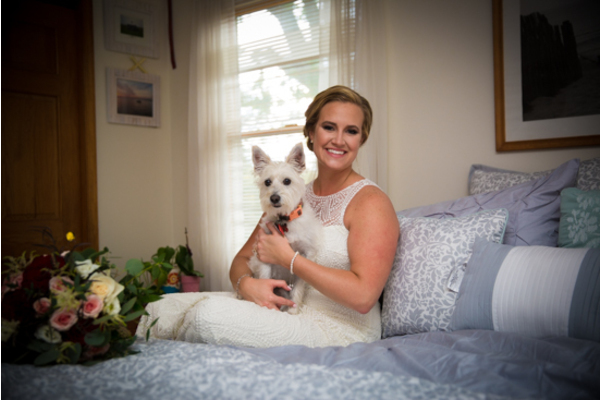 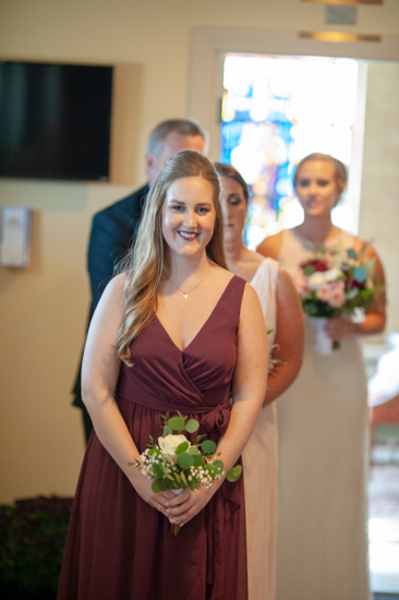 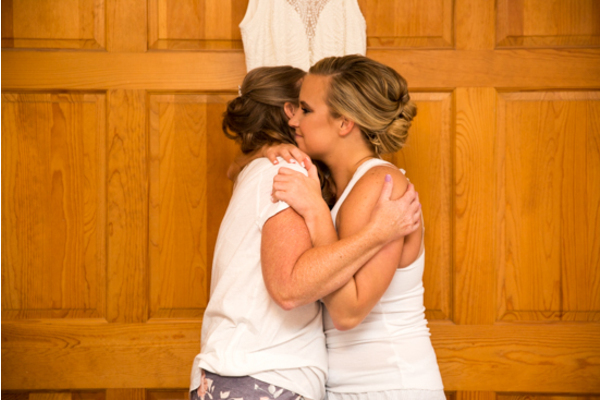 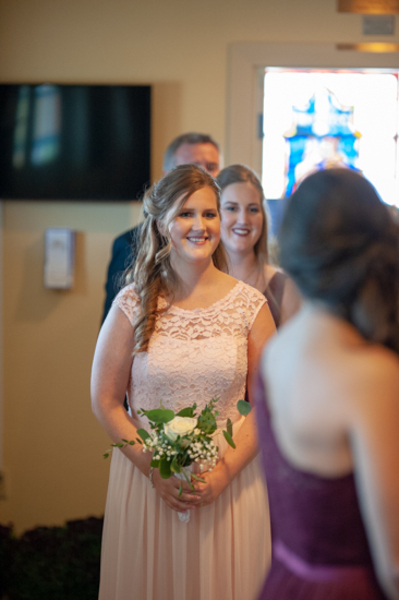 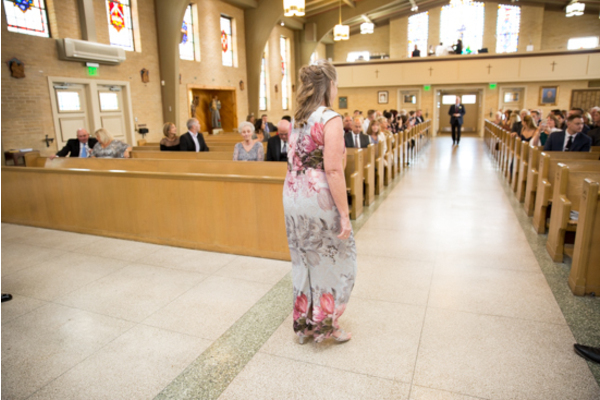 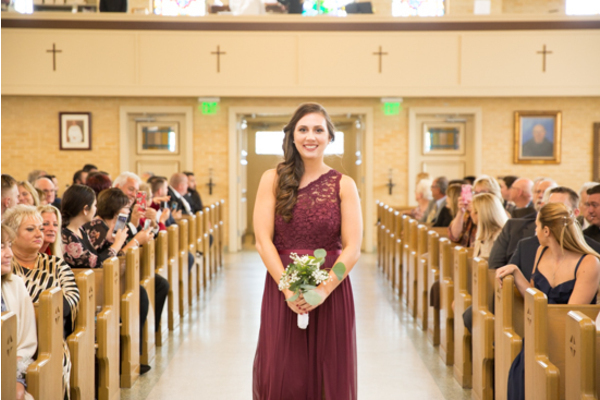 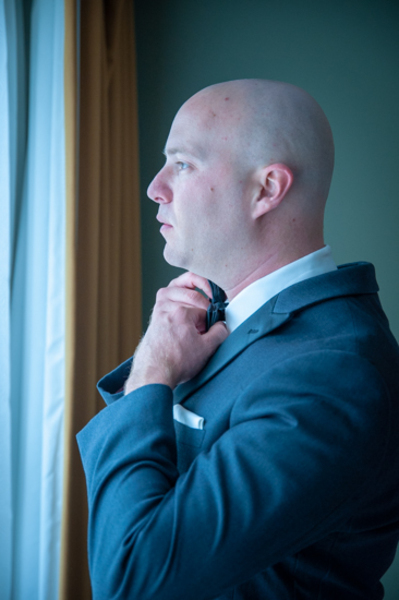 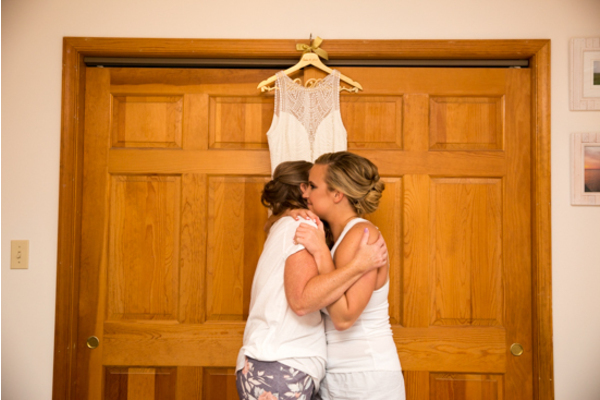 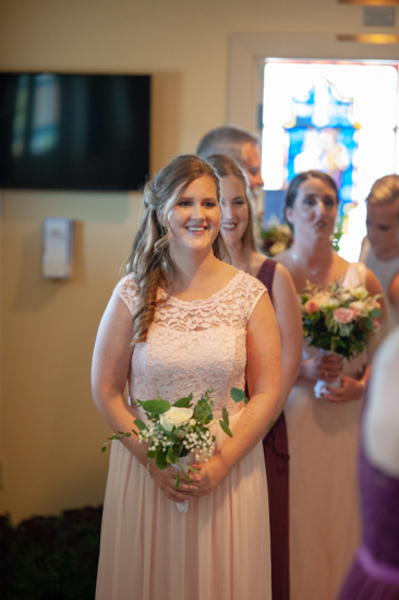 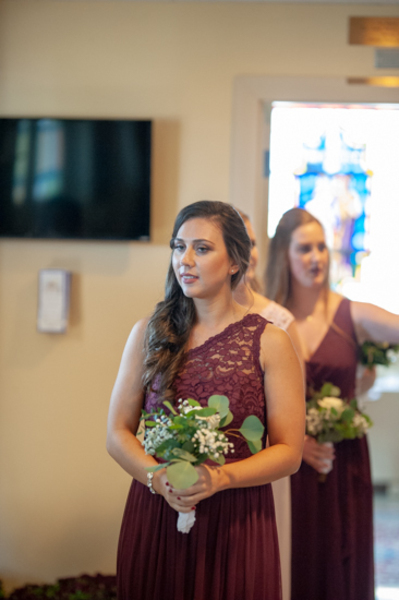 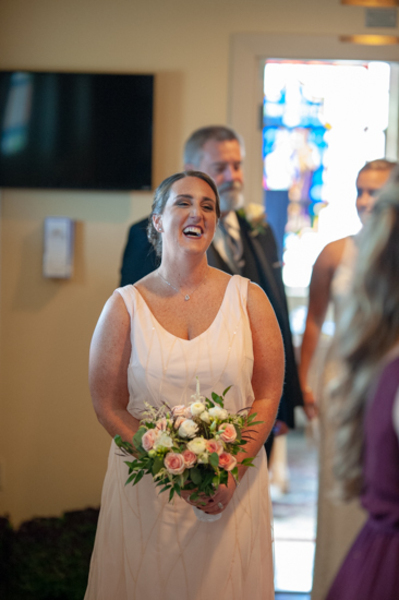 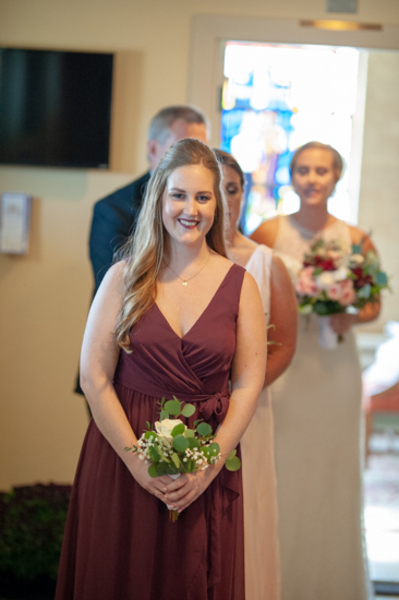 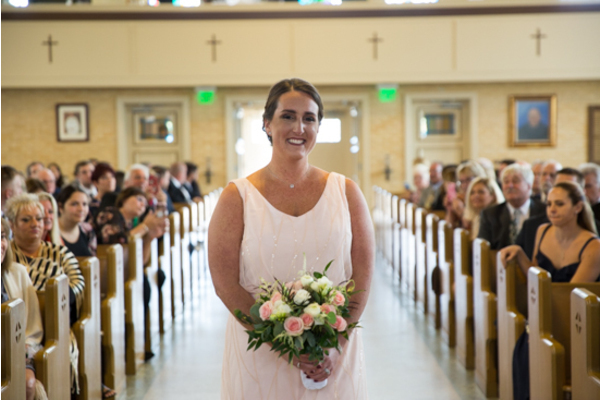 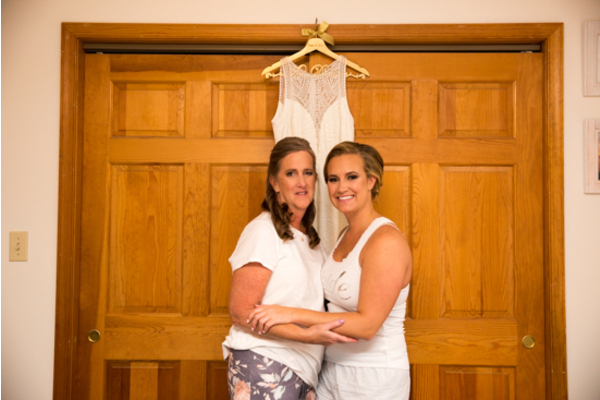 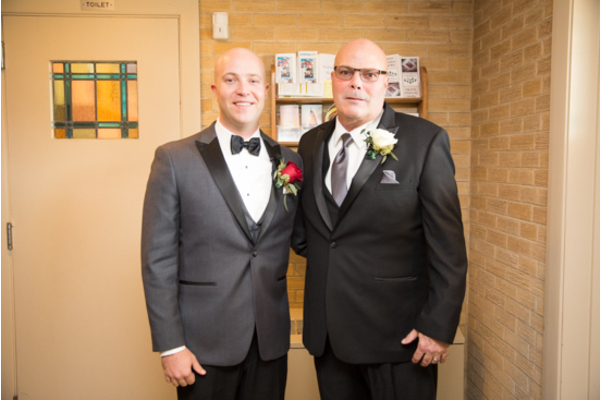 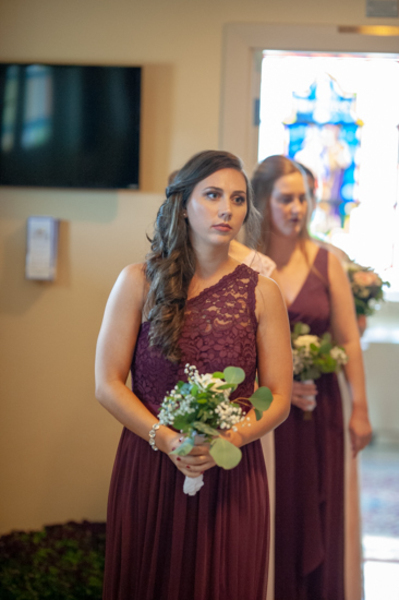 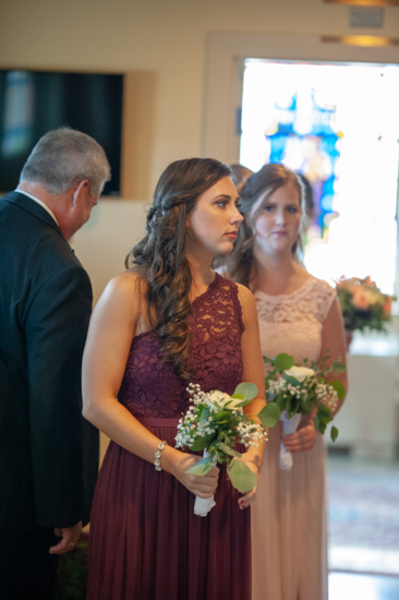 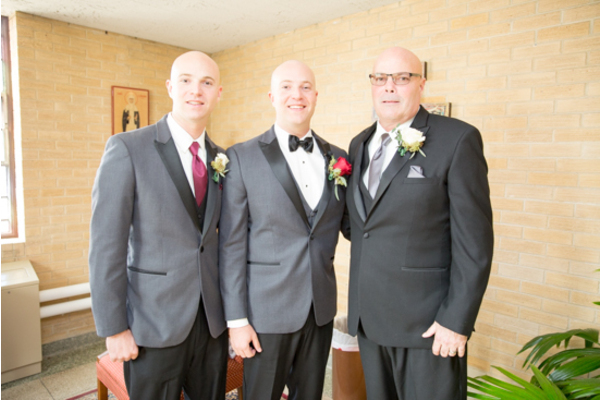 After taking a few portraits, Kelly was ready walk down the aisle! 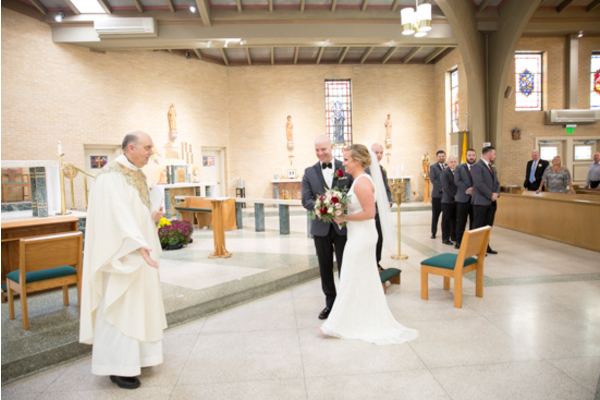 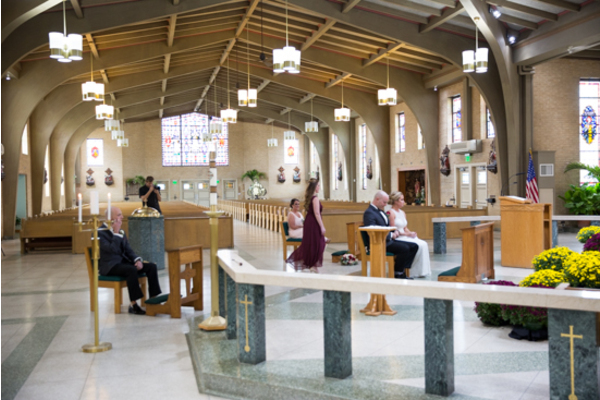 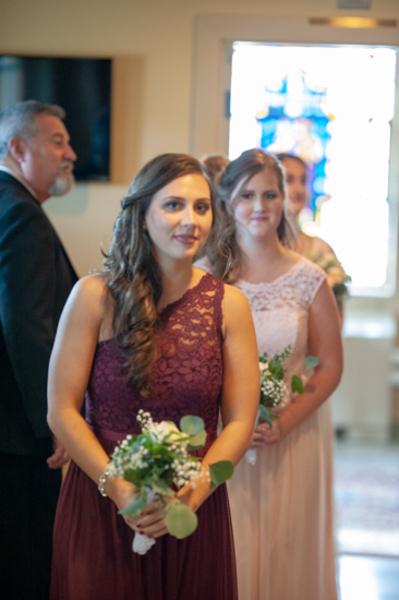 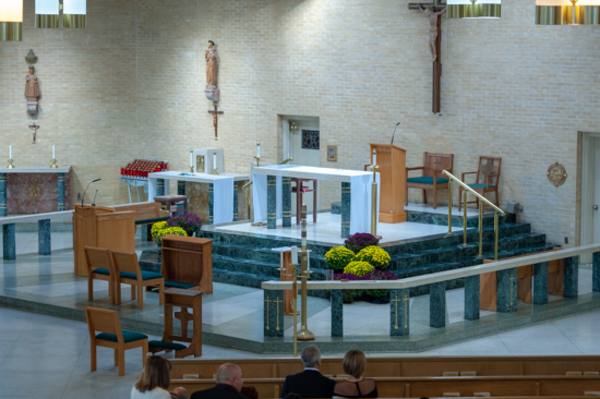 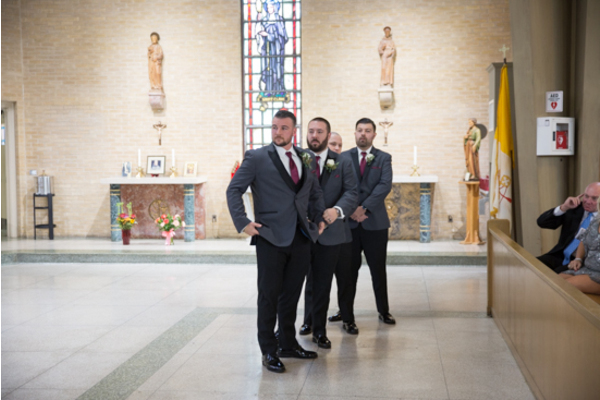 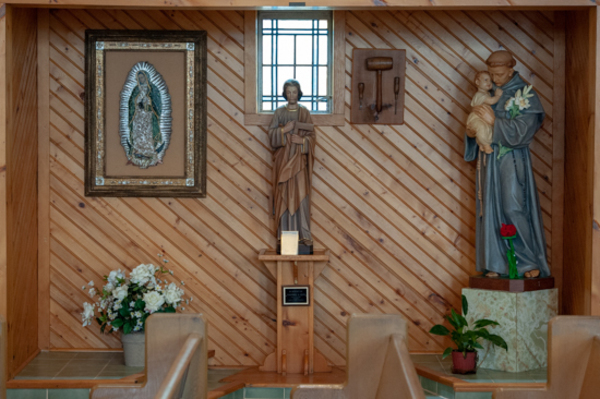 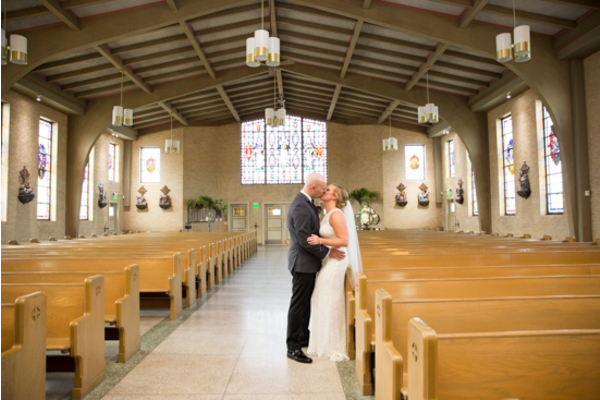 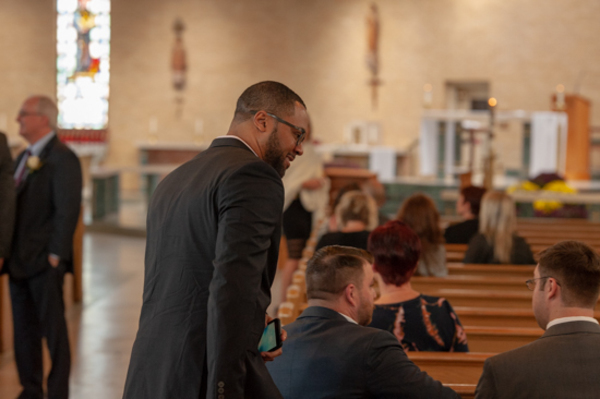 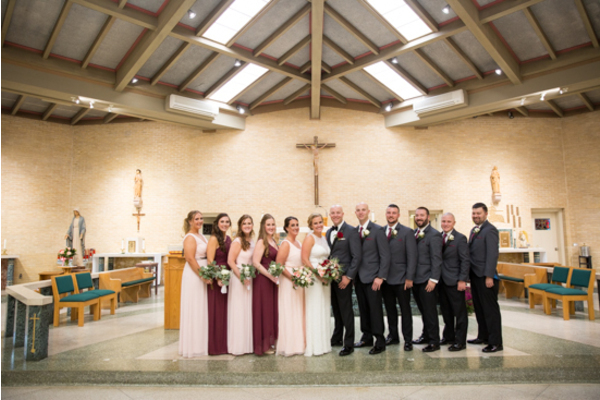 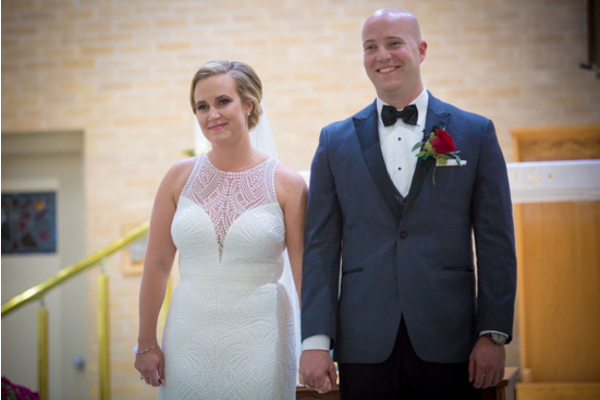 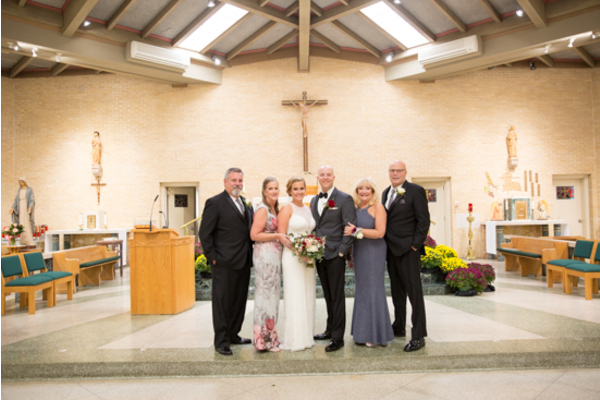 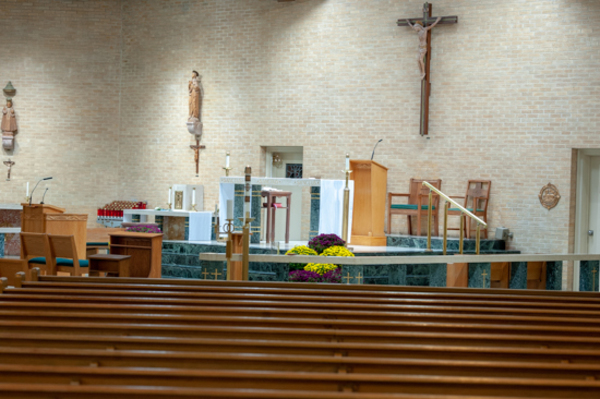 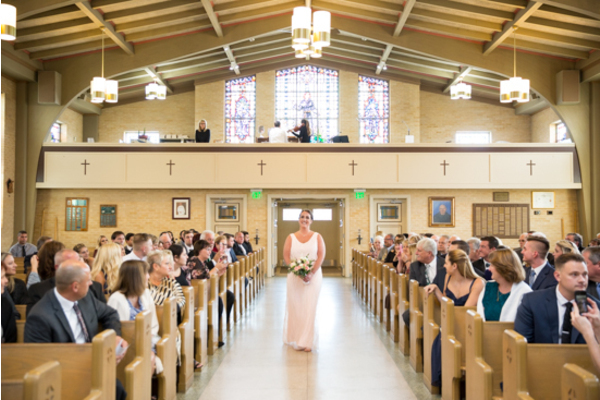 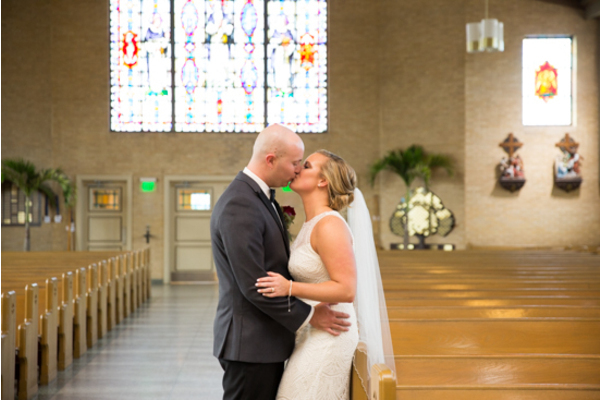 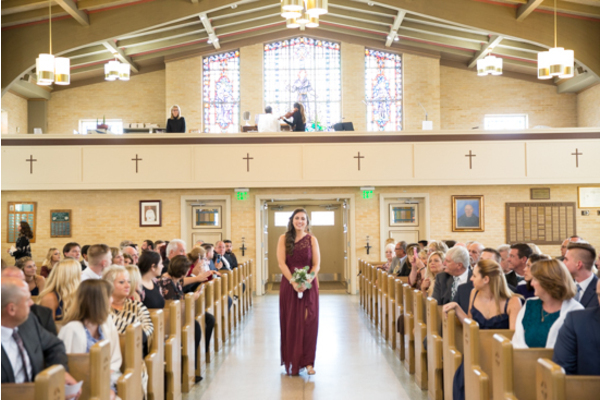 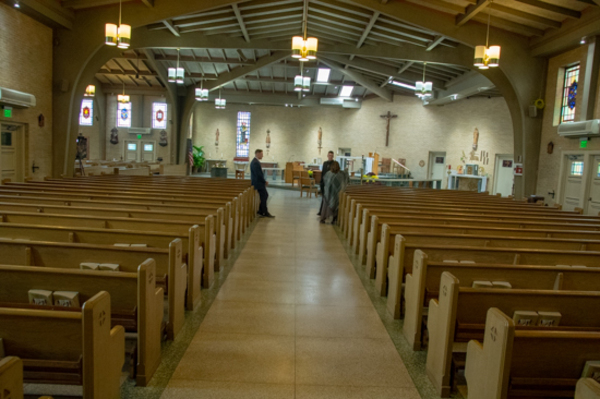 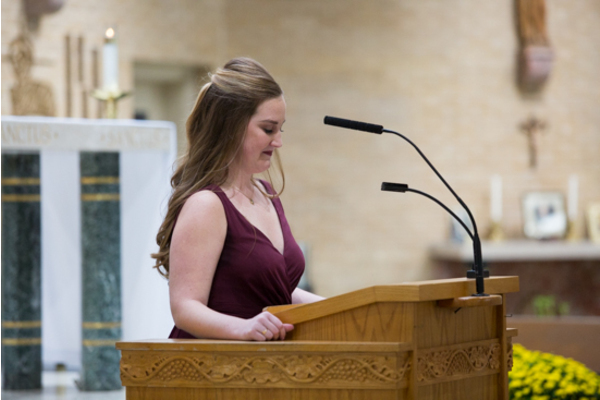 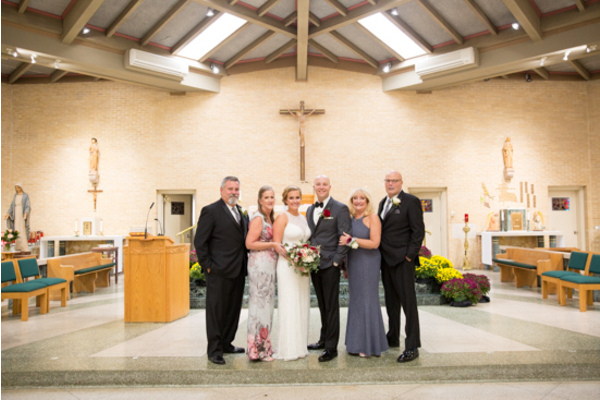 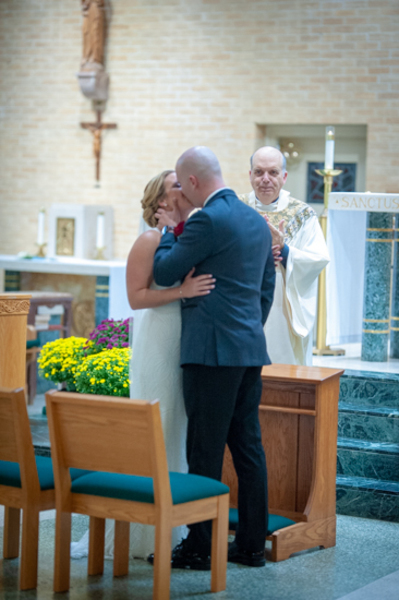 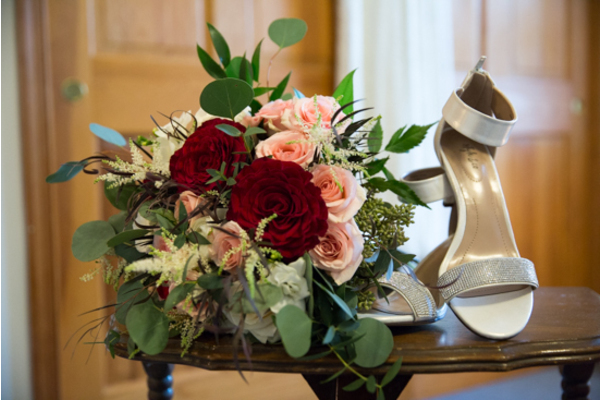 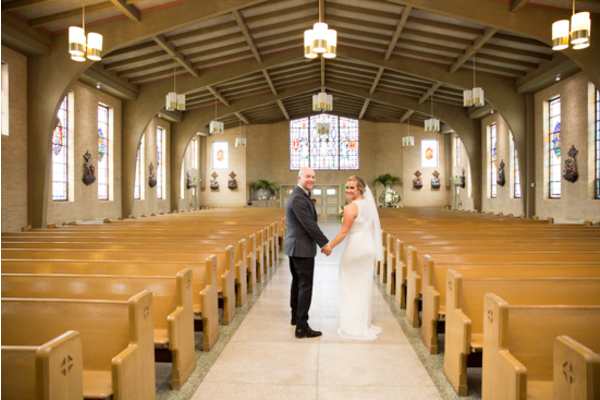 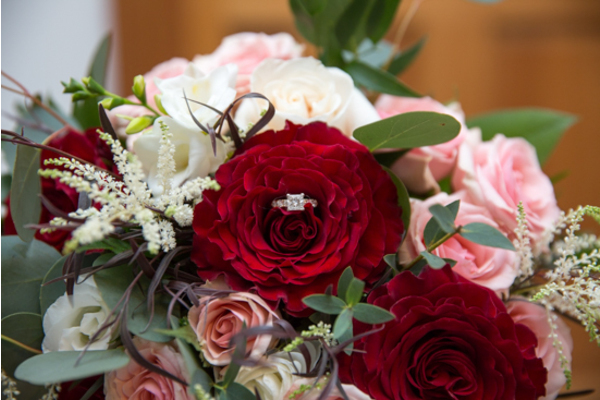 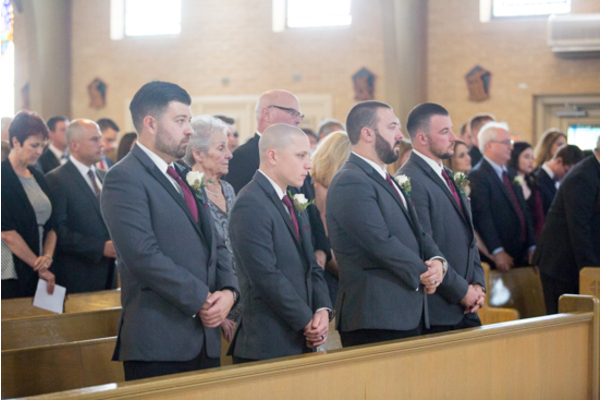 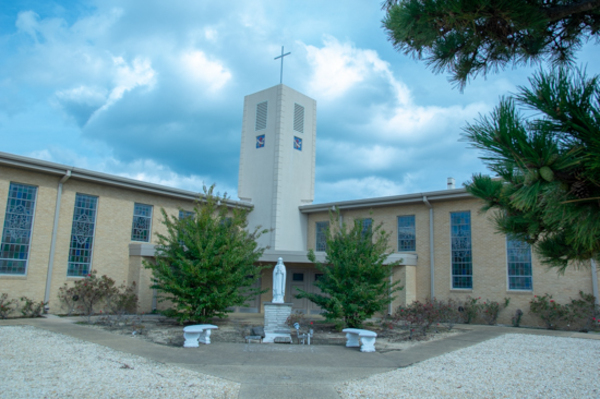 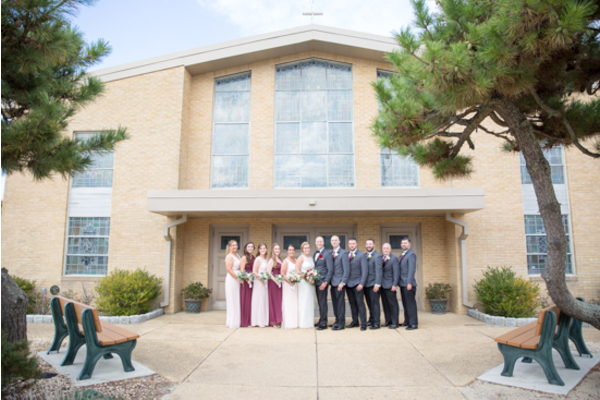 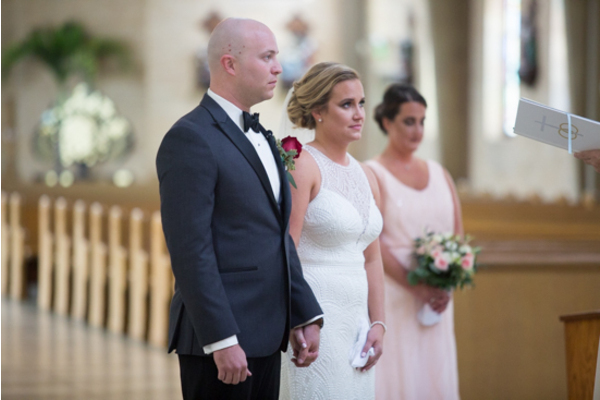 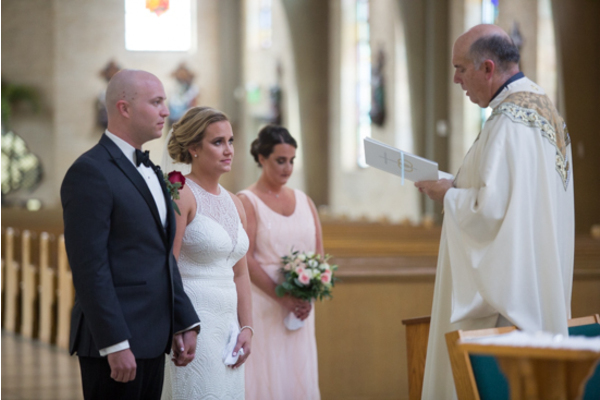 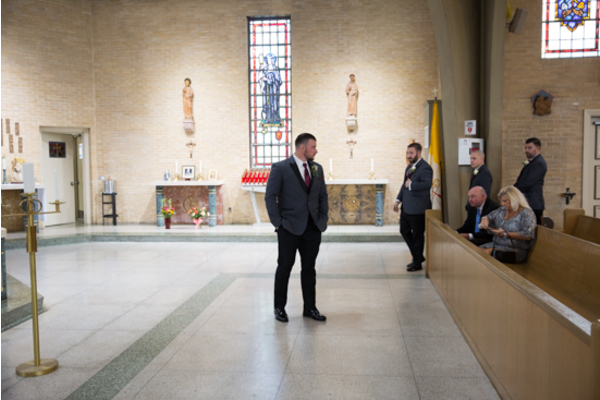 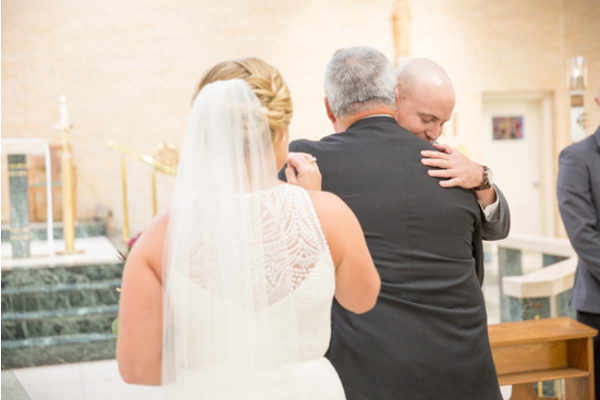 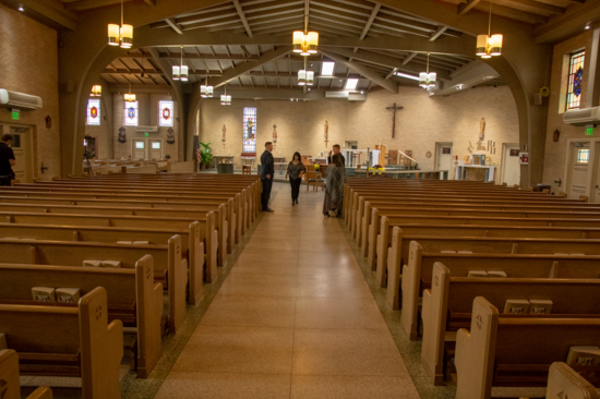 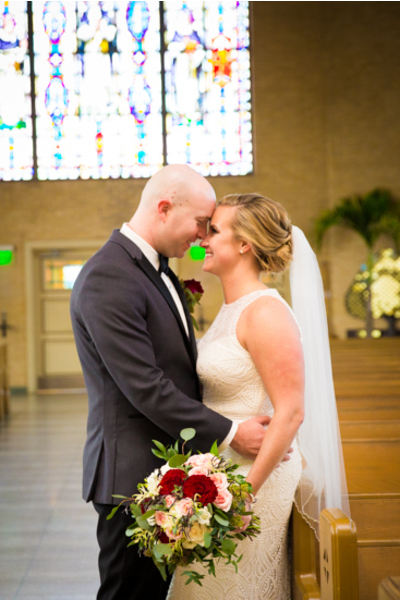 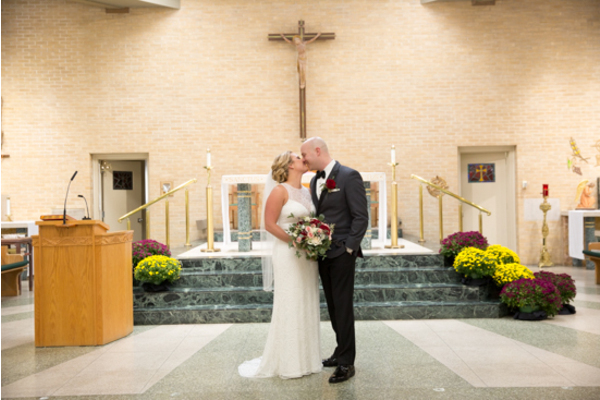 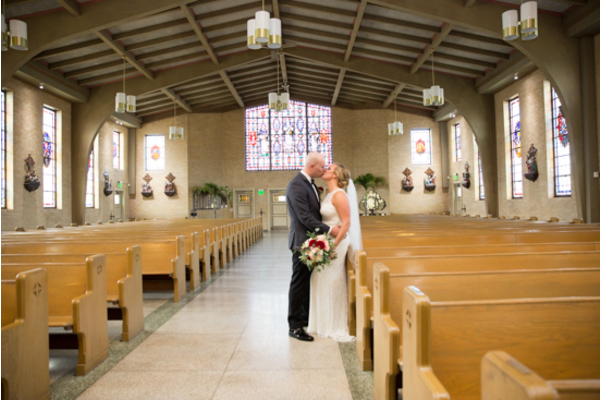 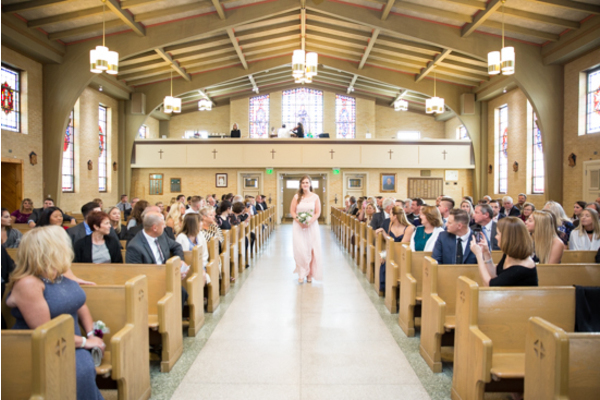 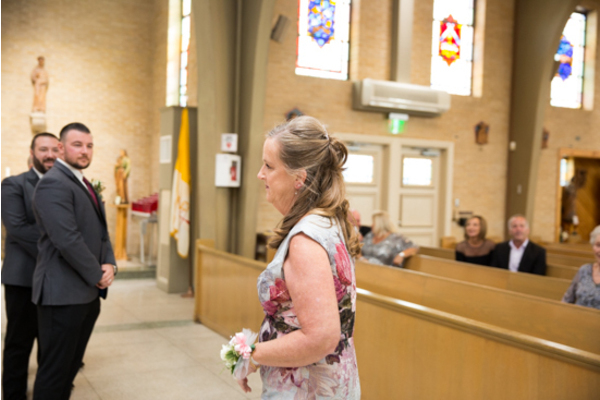 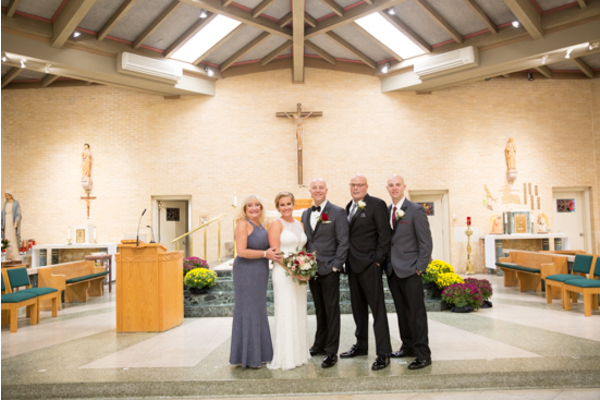 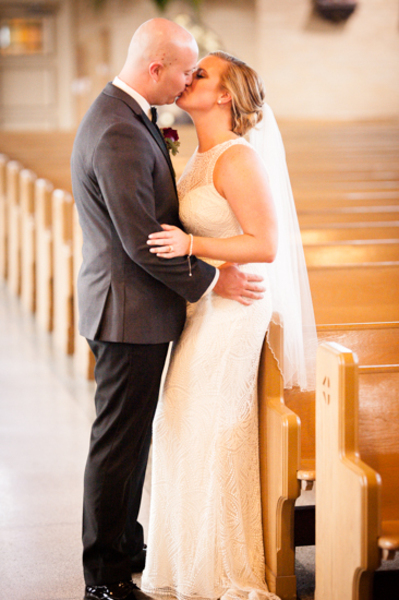 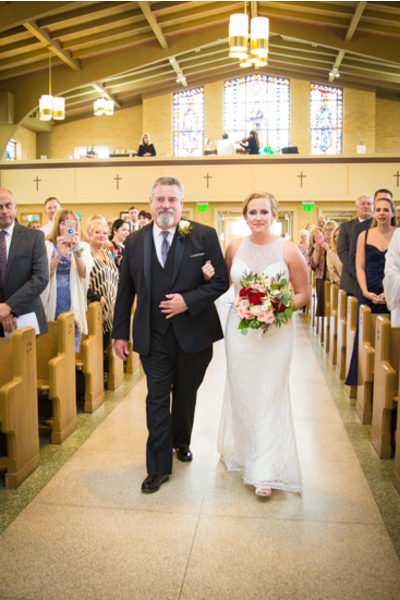 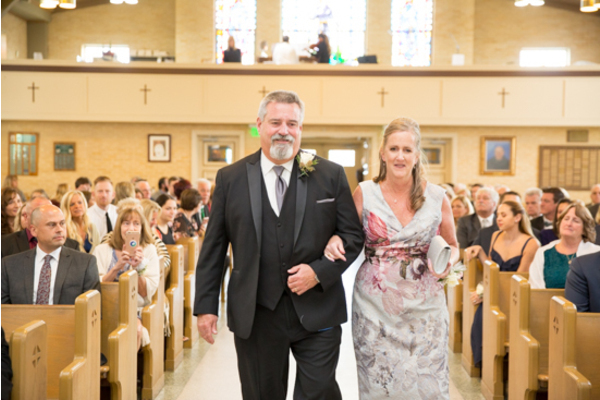 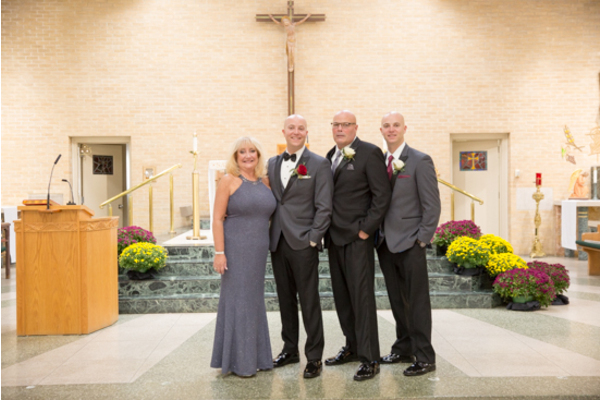 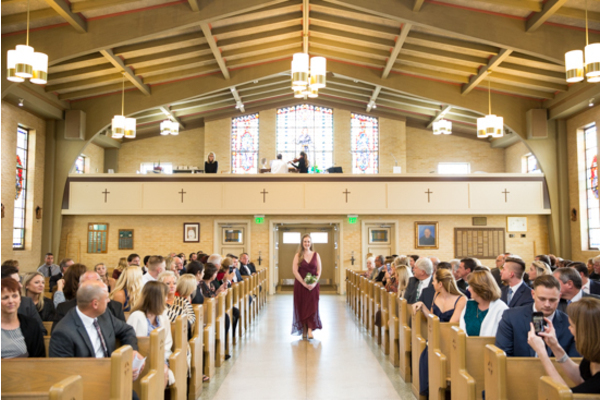 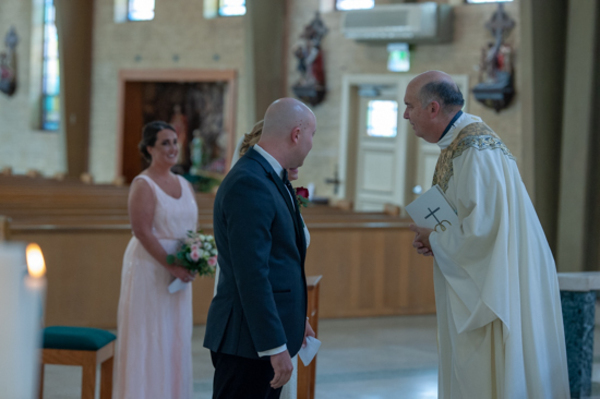 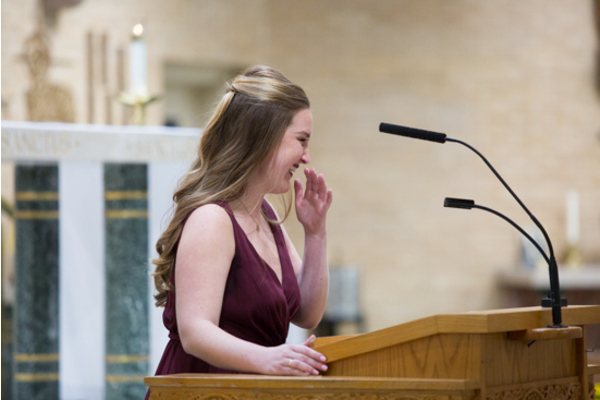 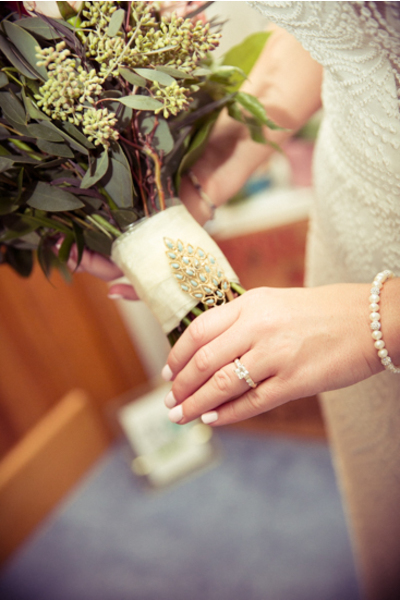 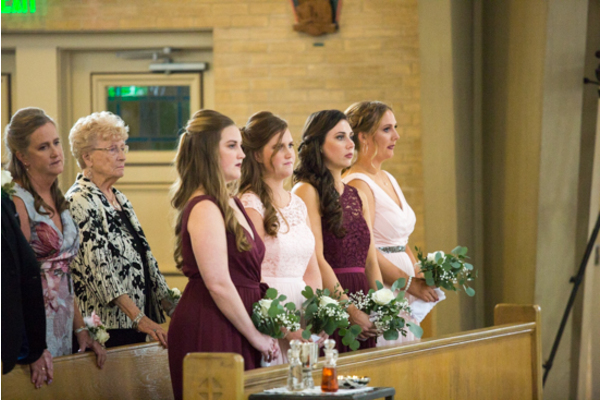 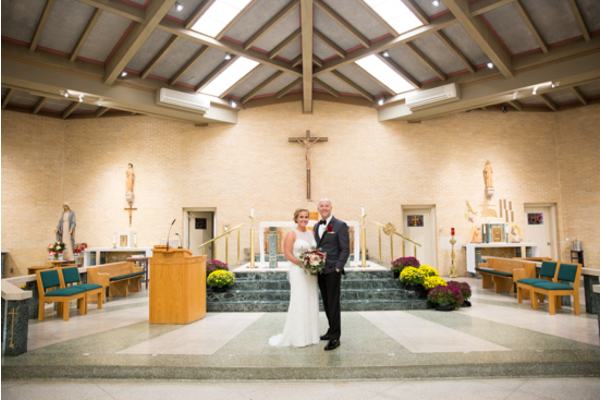 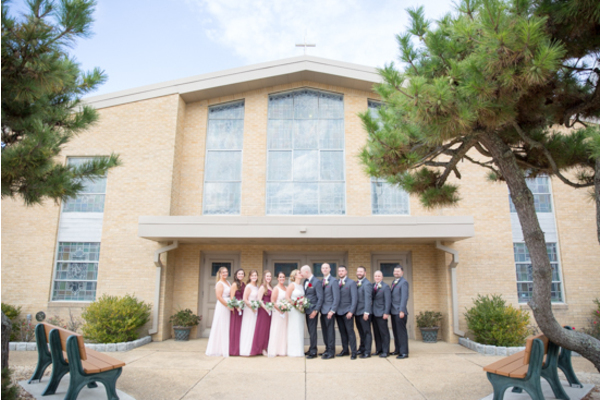 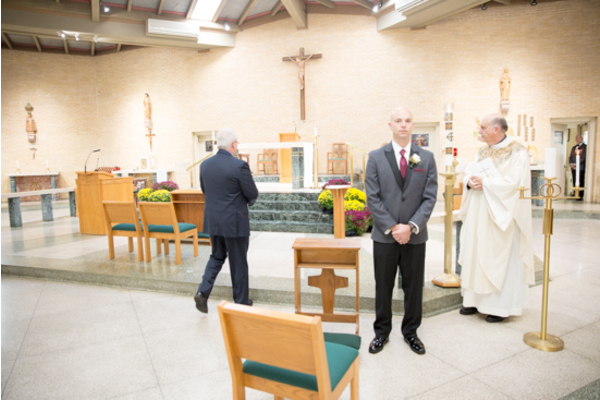 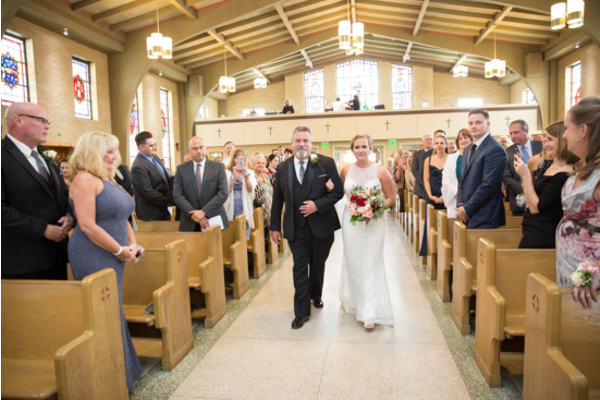 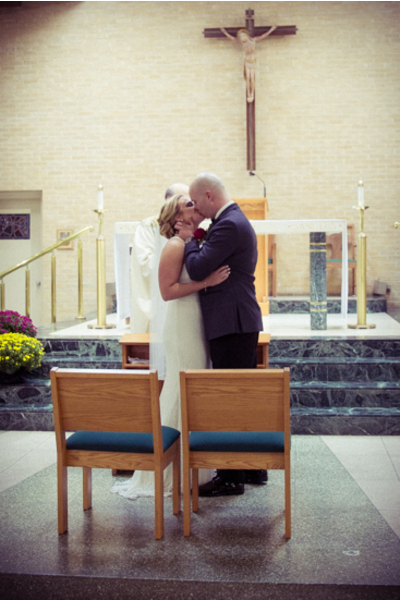 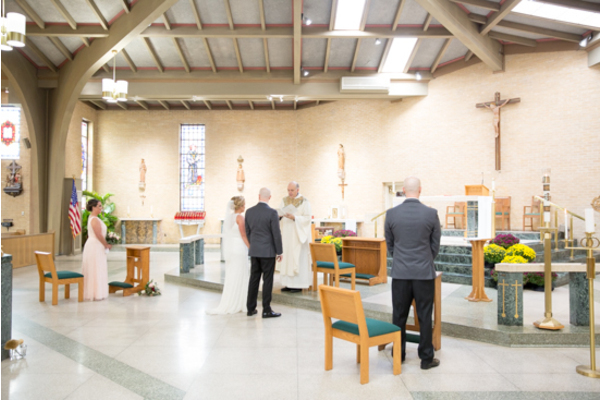 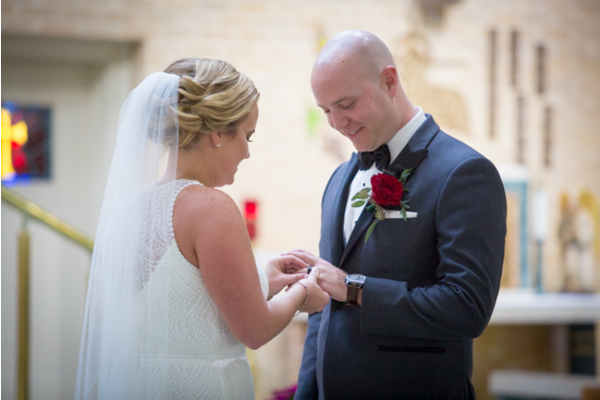 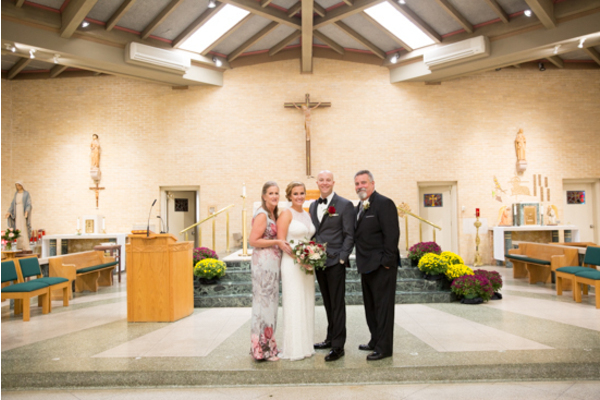 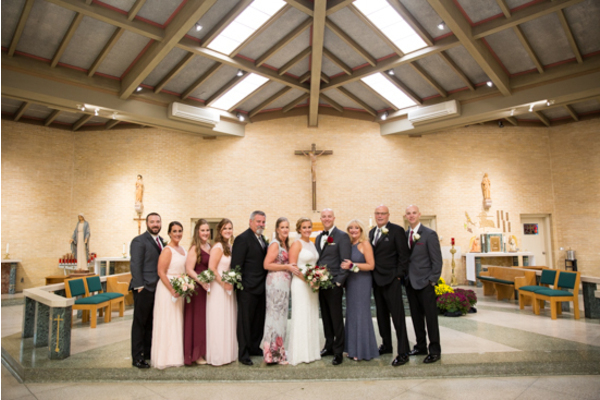 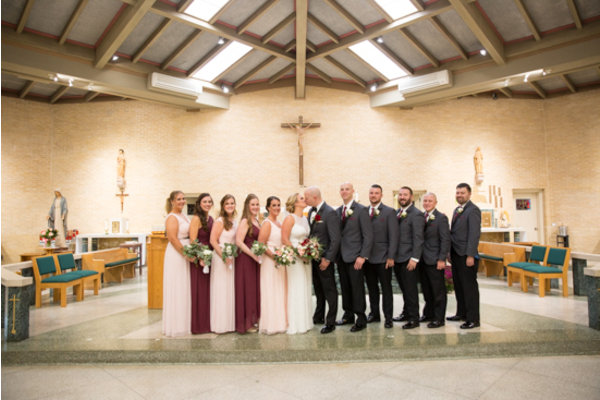 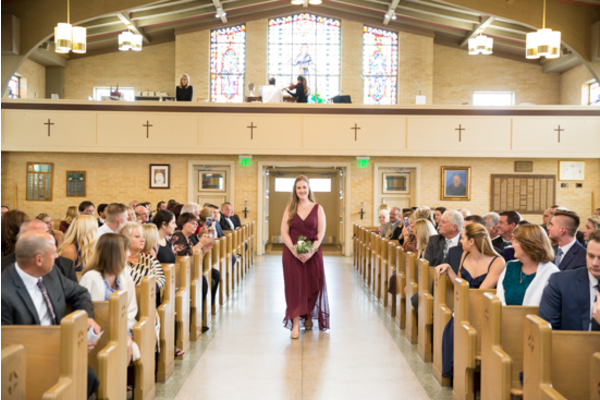 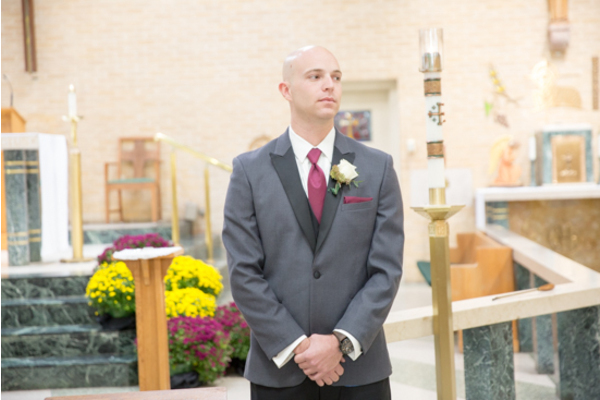 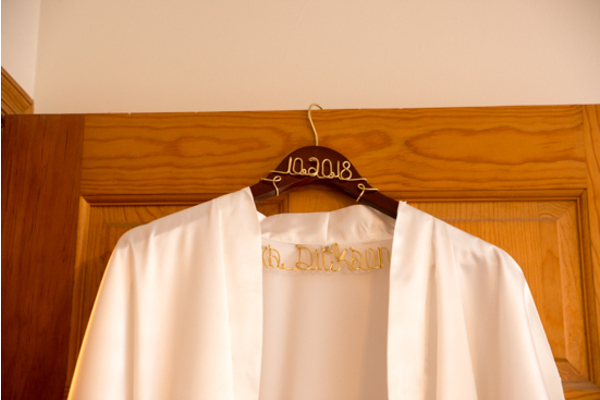 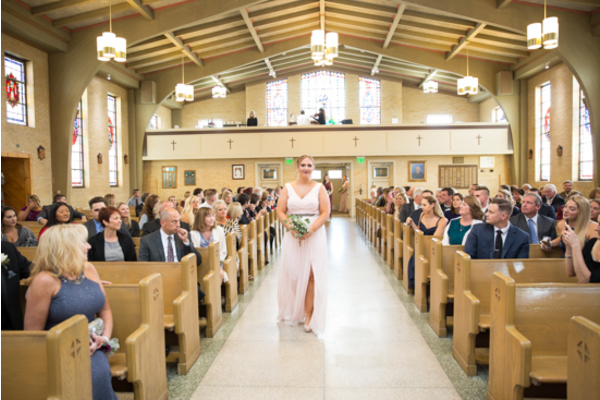 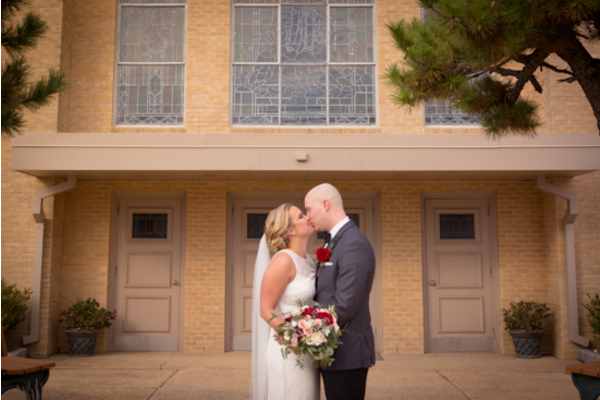 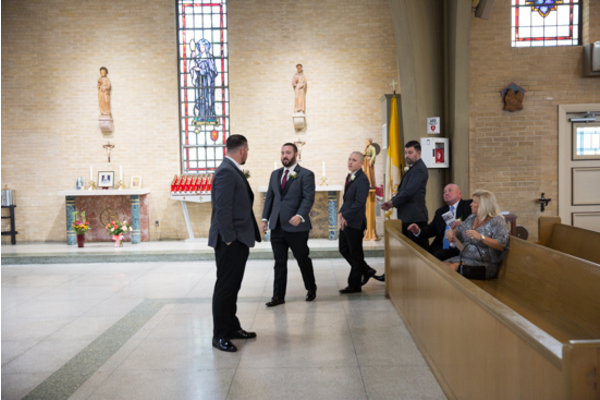 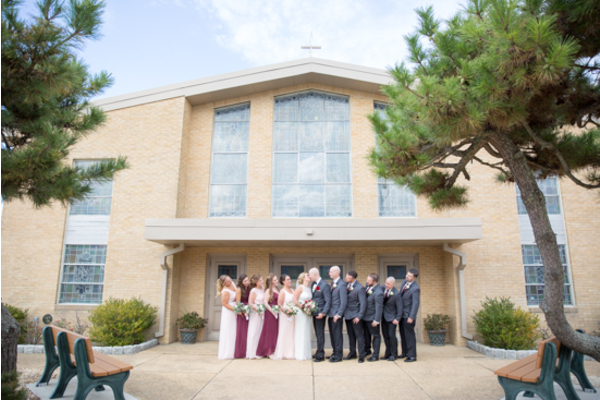 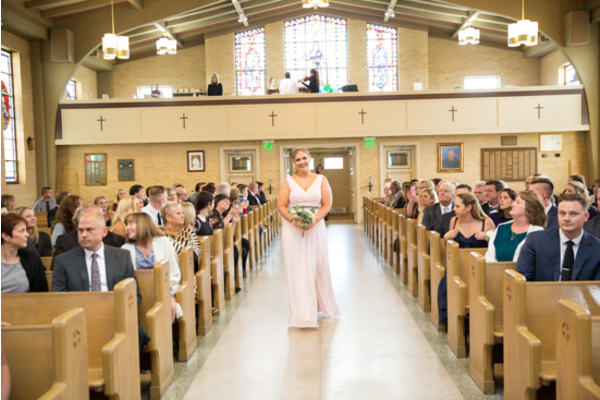 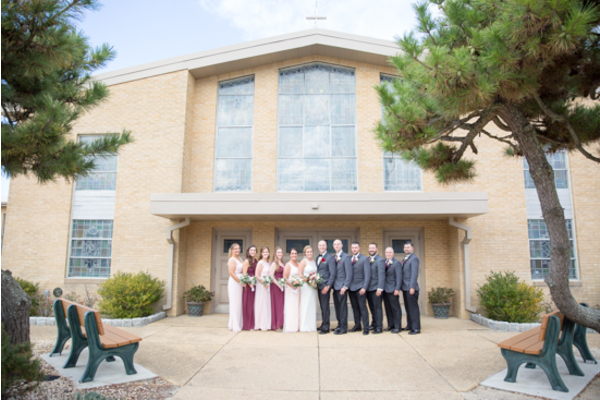 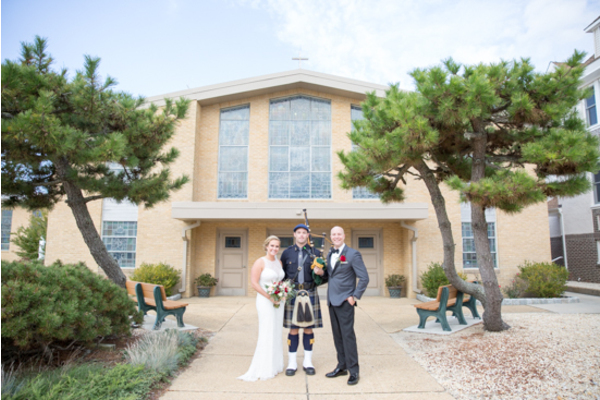 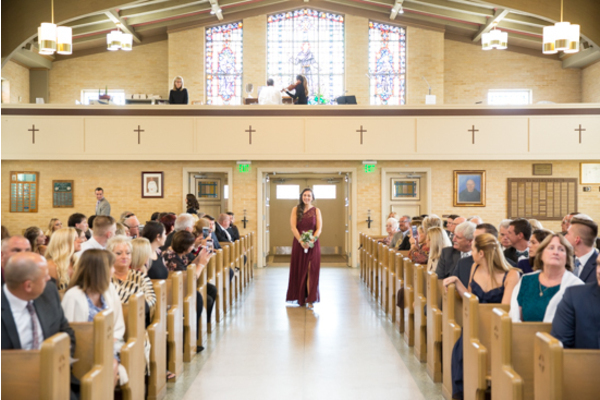 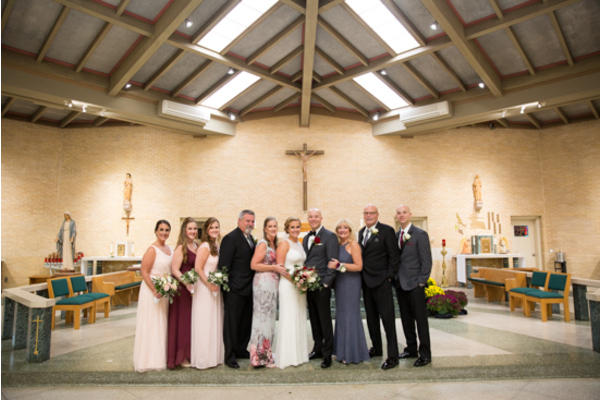 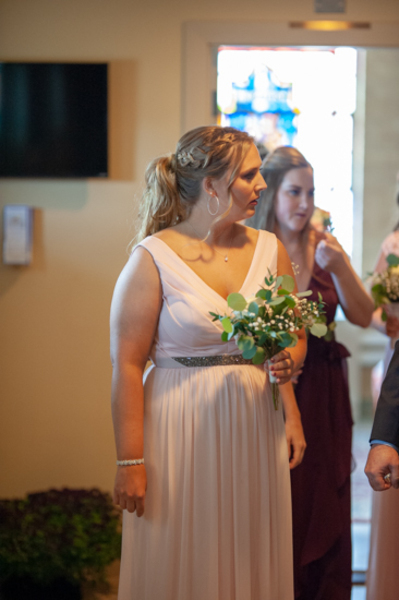 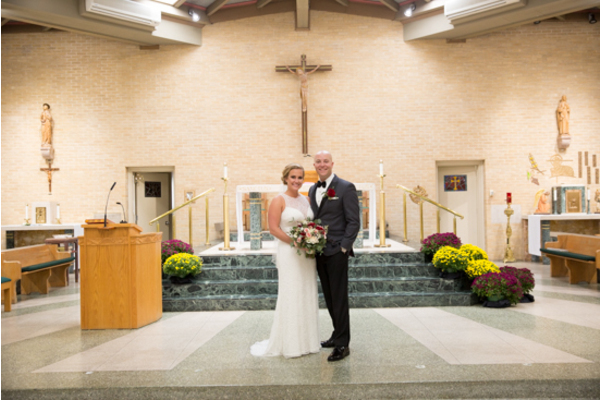 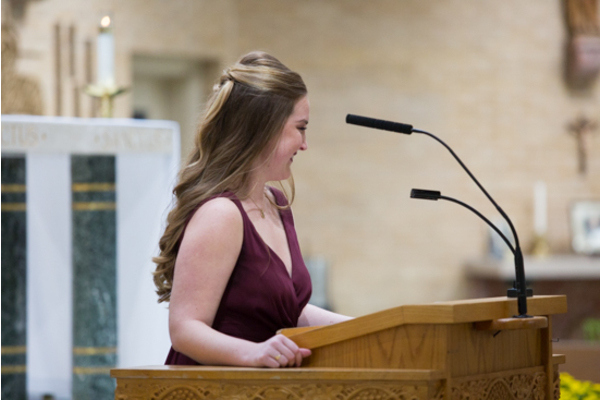 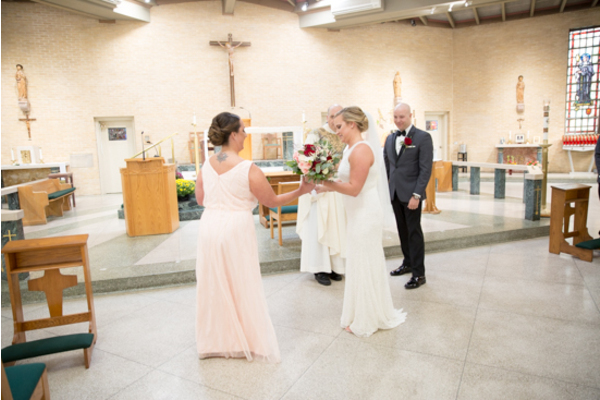 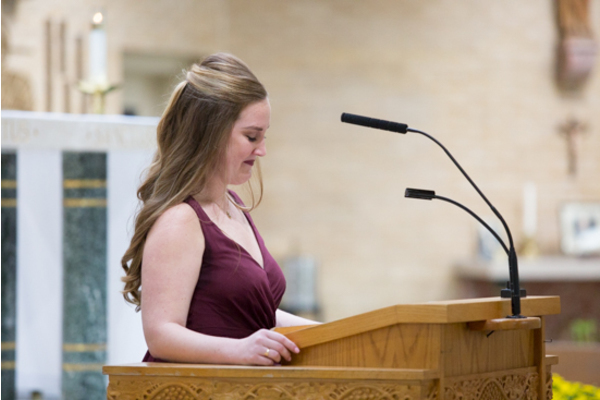 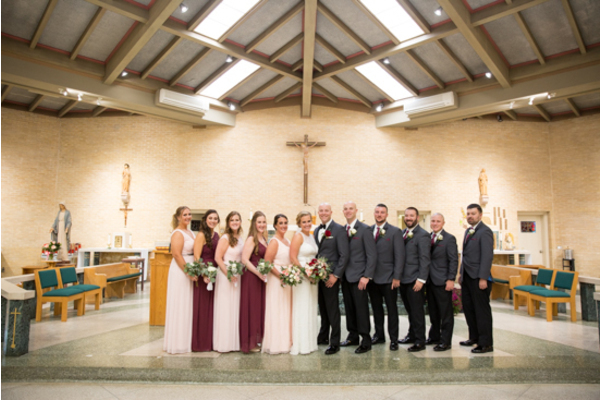 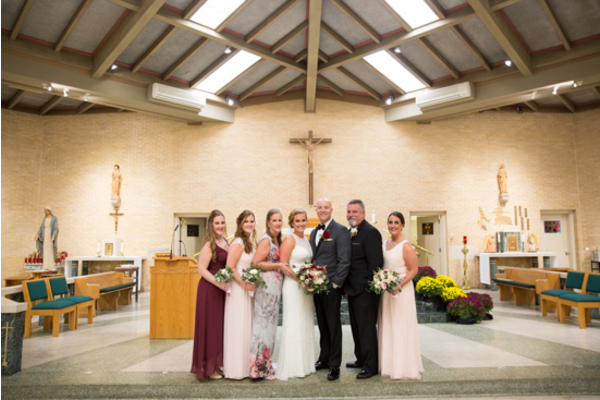 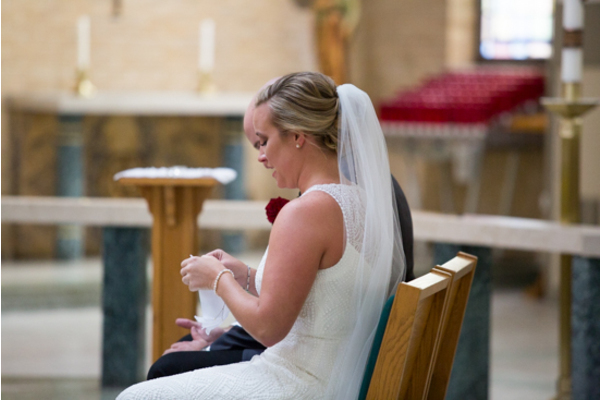 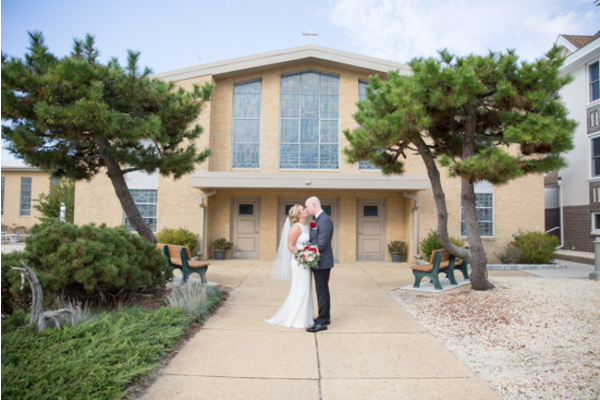 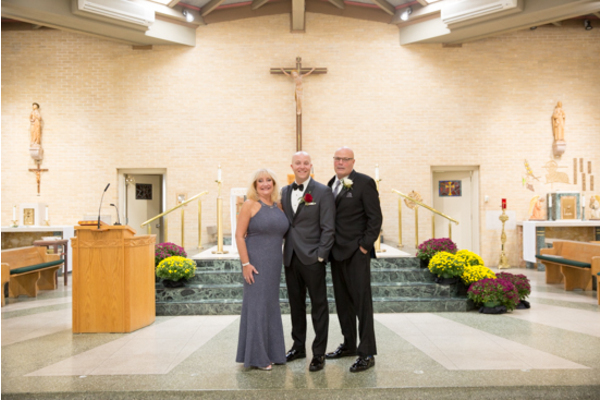 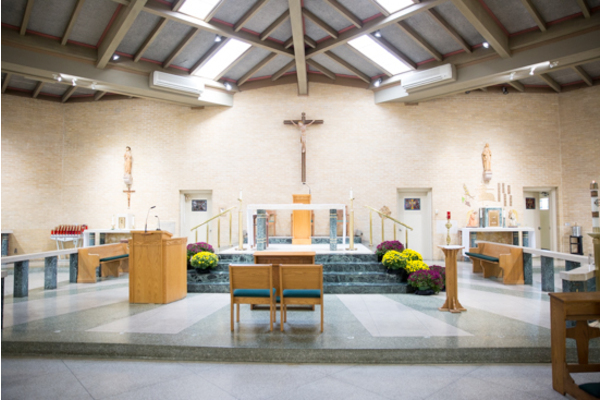 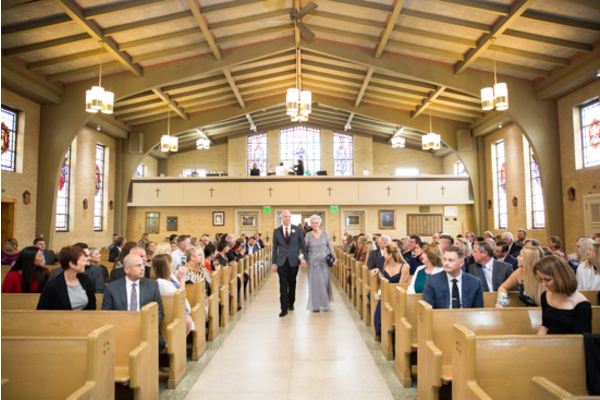 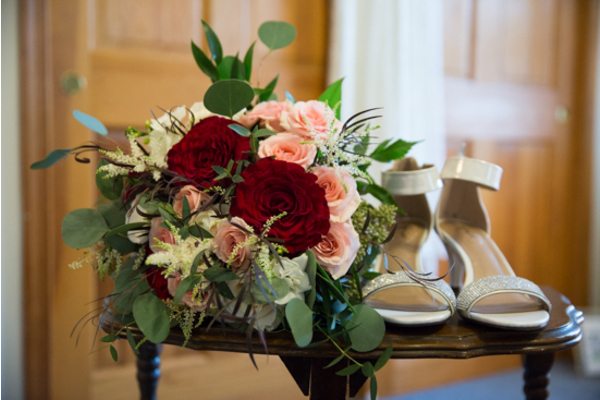 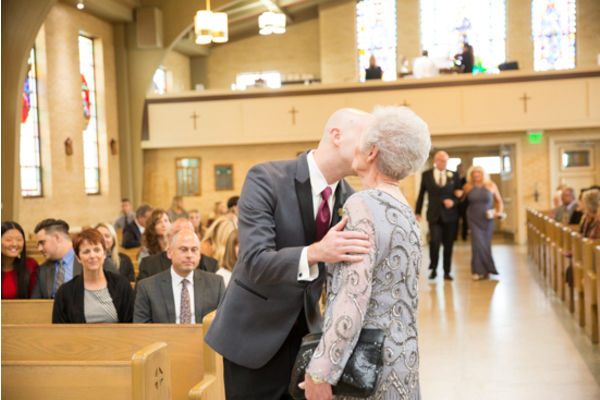 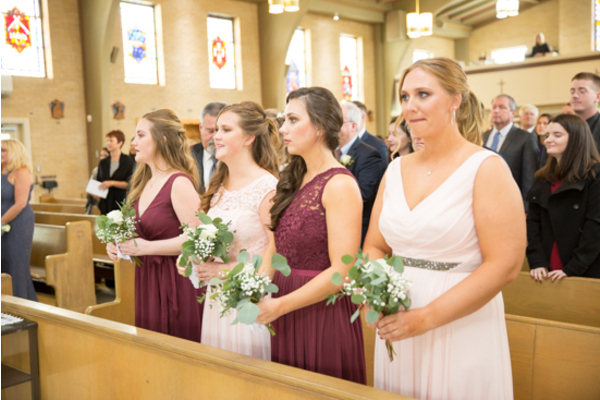 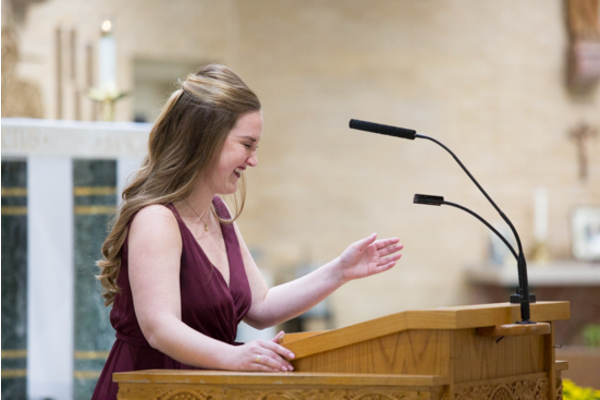 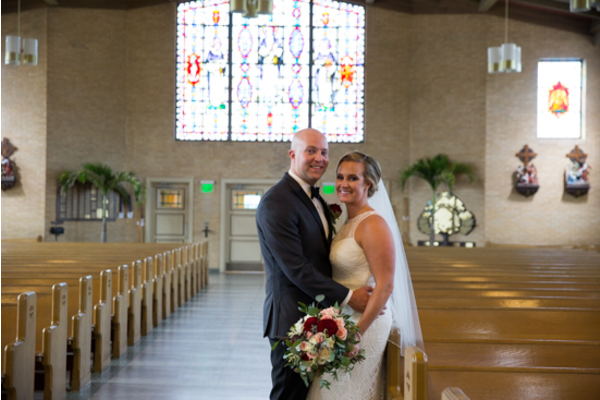 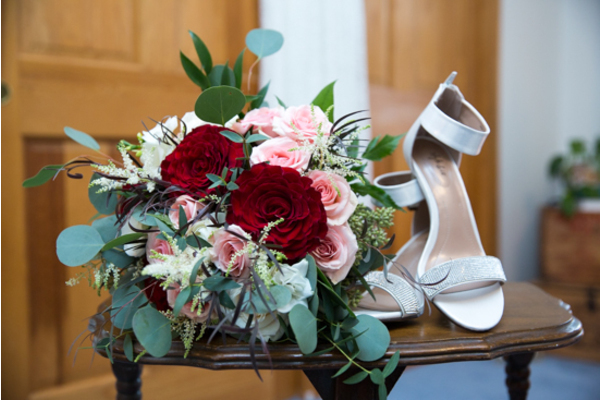 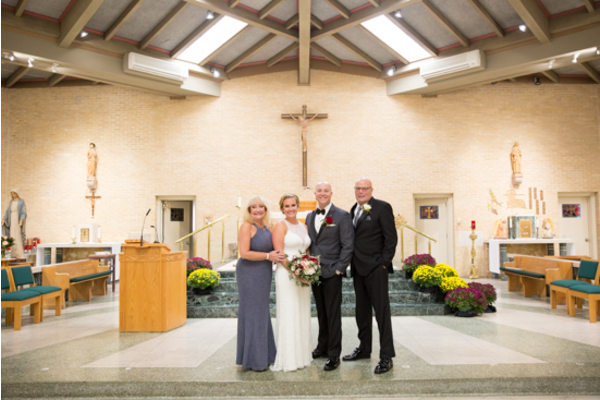 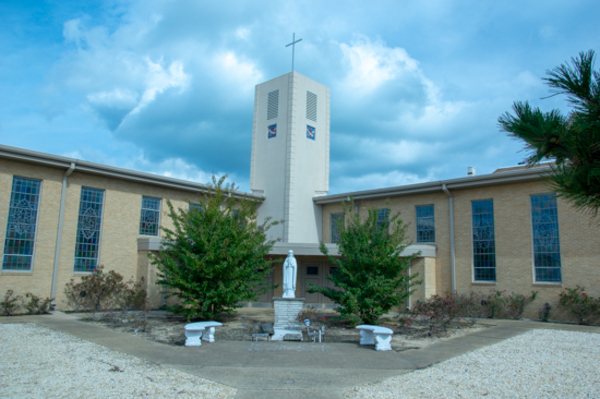 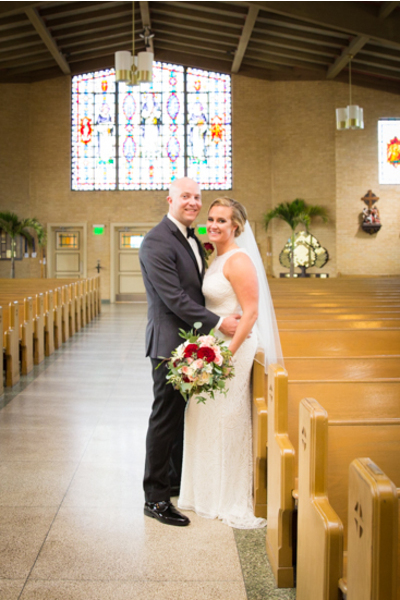 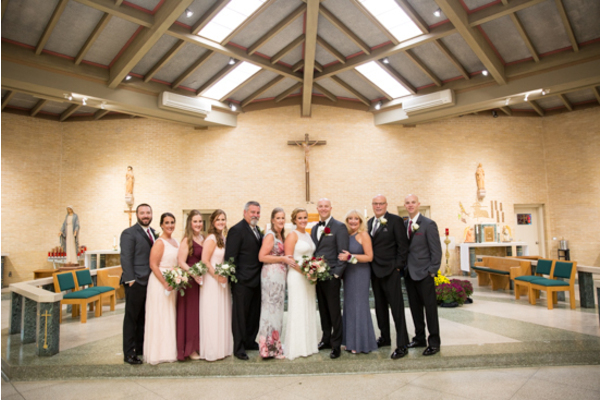 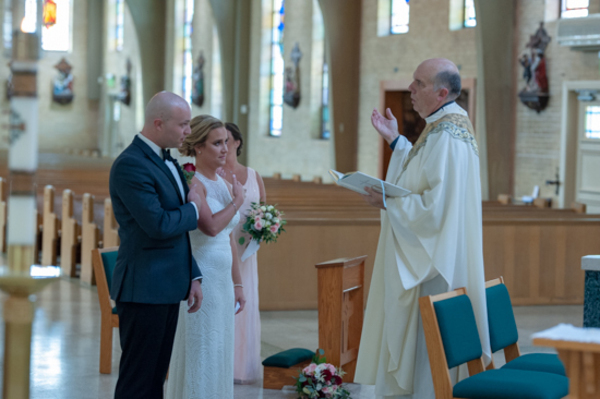 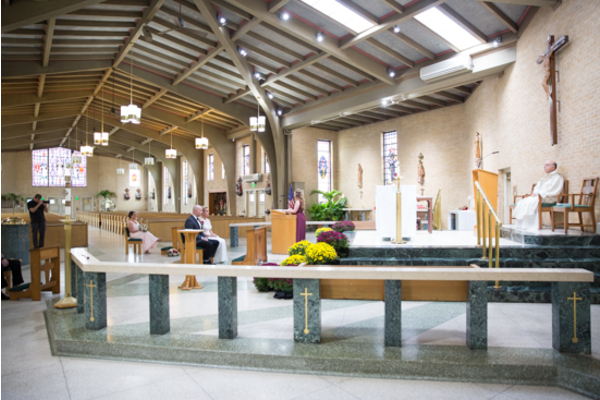 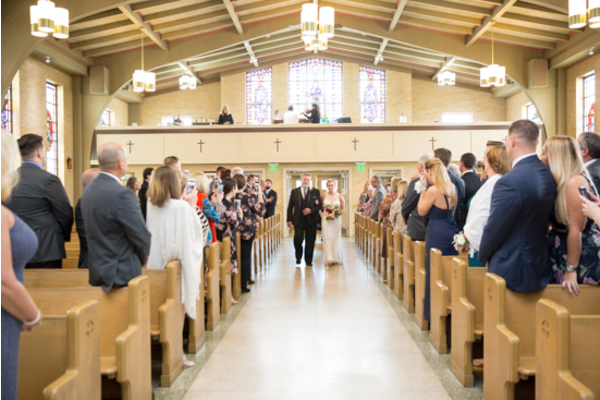 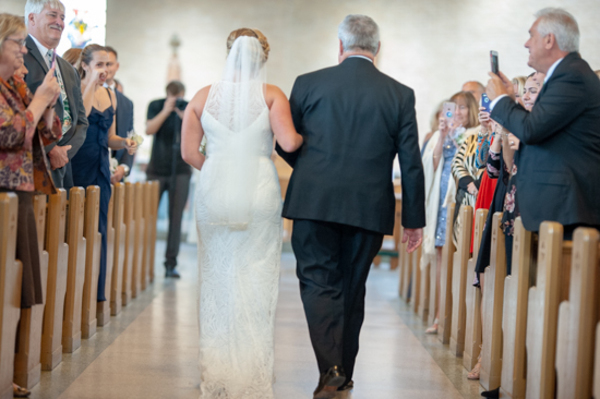 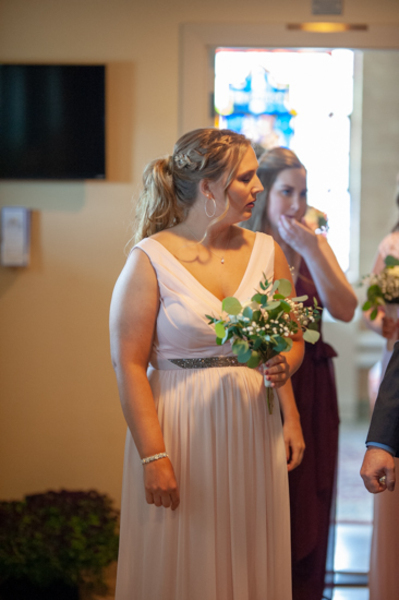 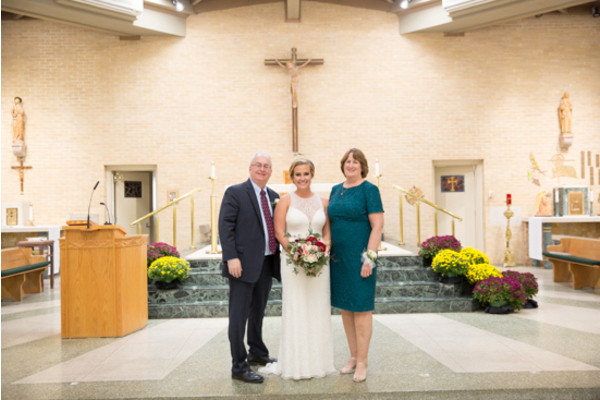 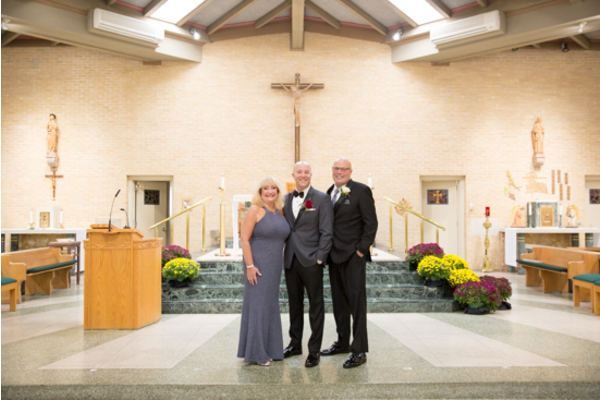 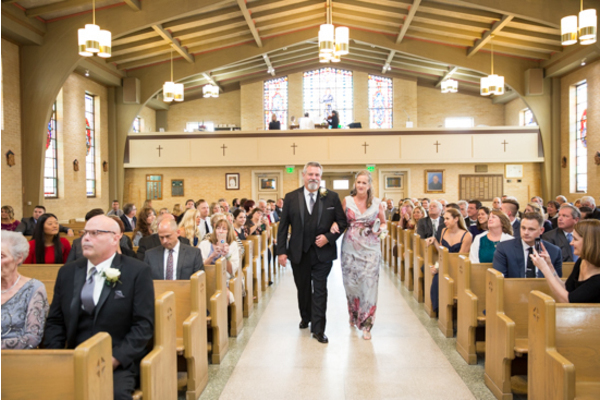 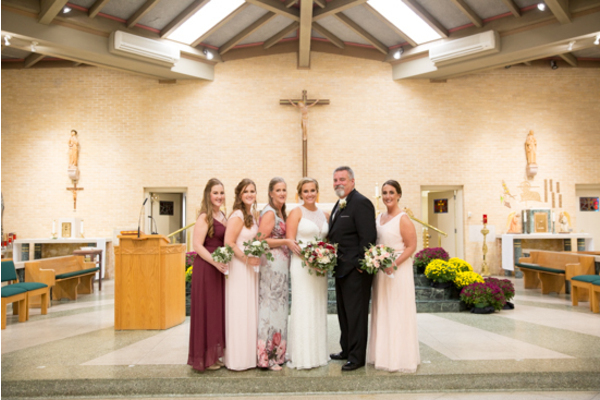 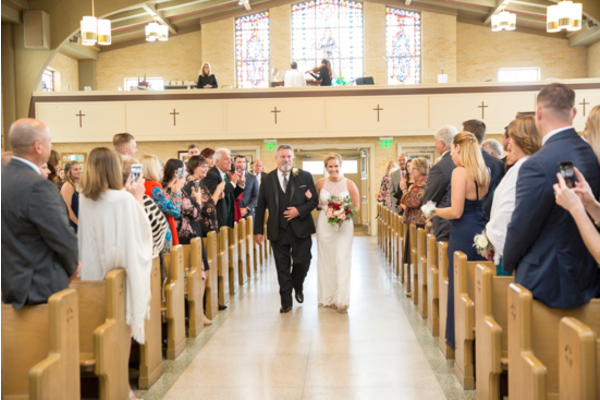 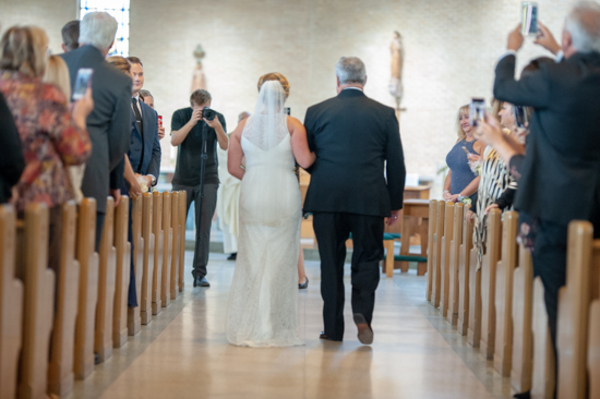 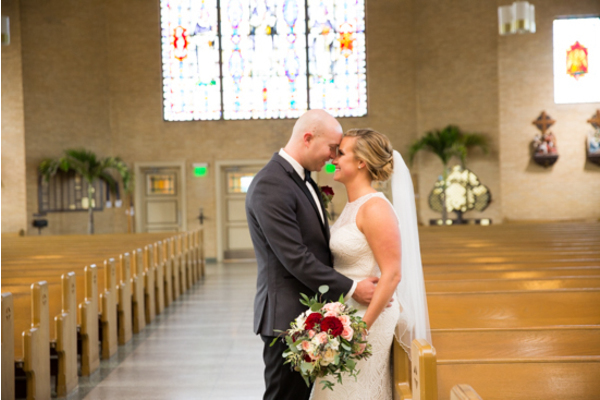 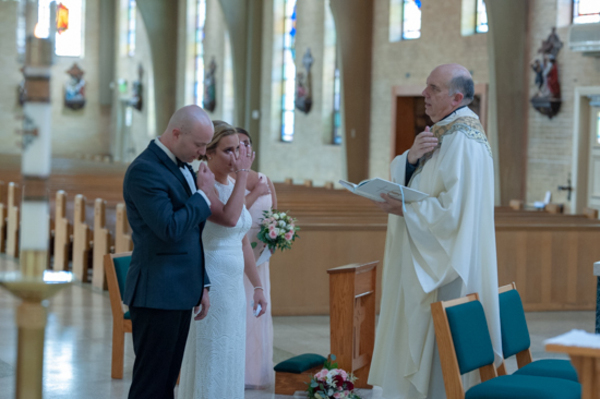 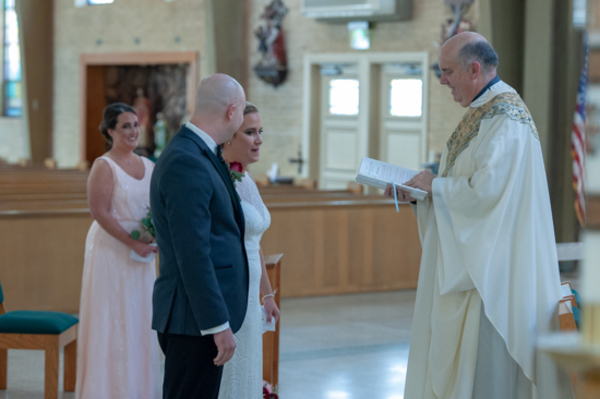 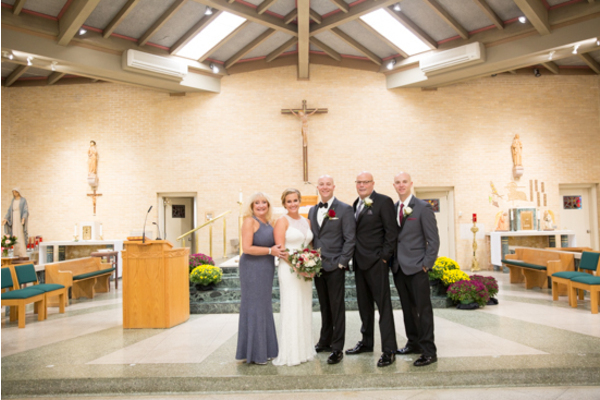 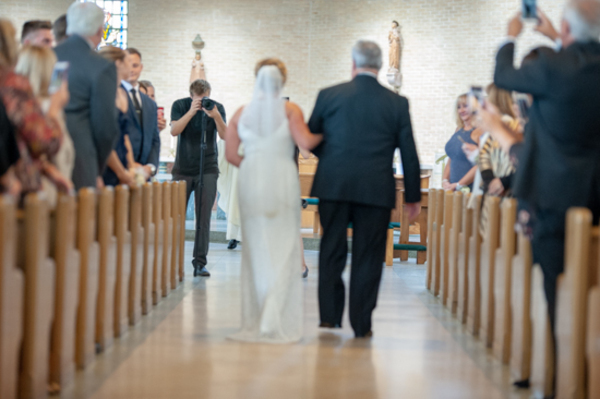 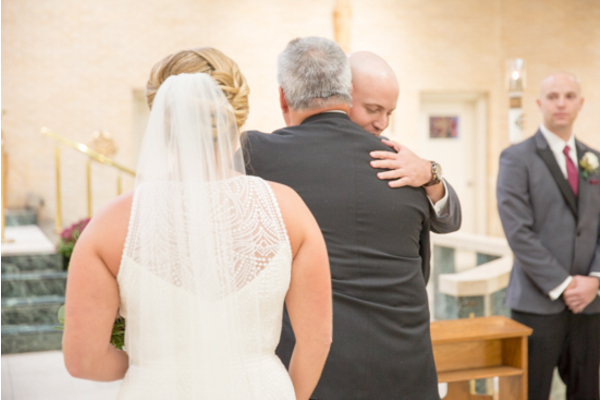 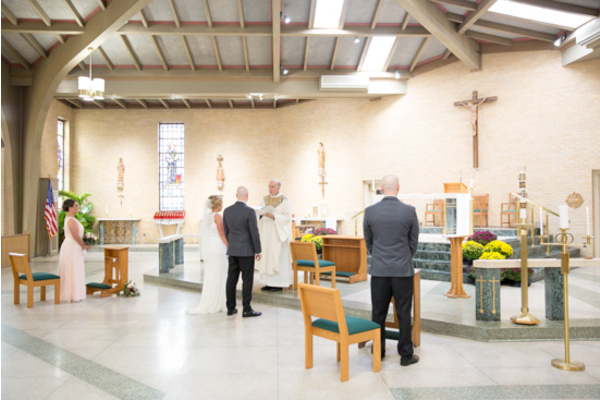 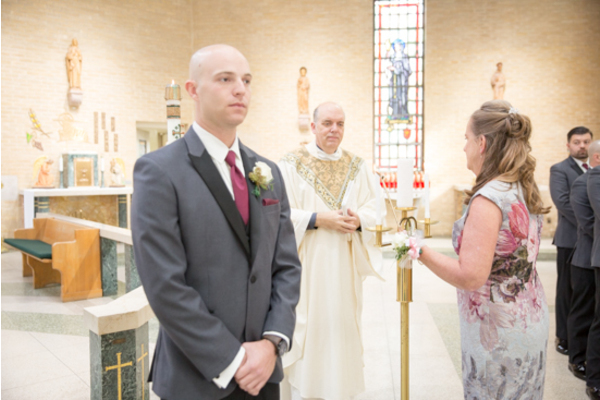 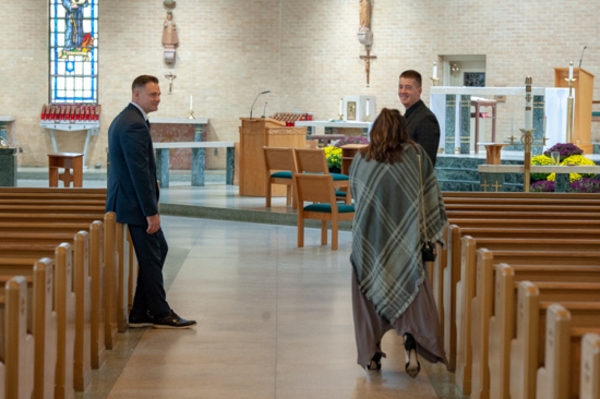 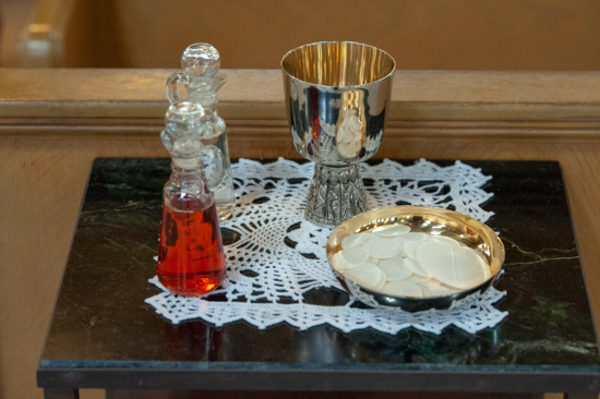 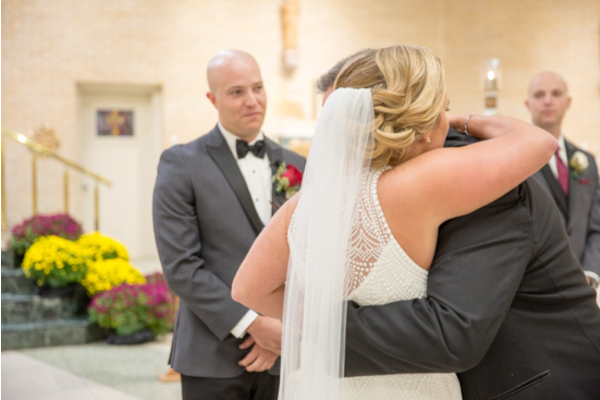 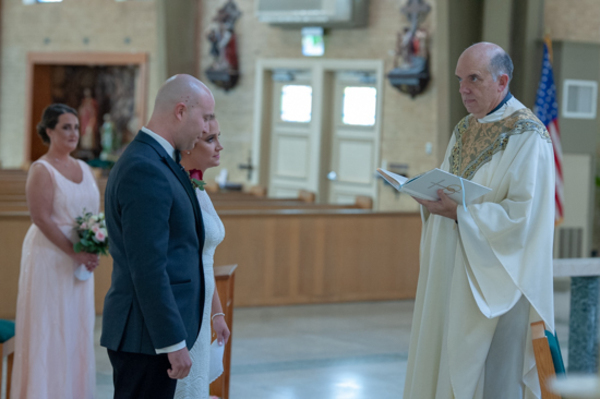 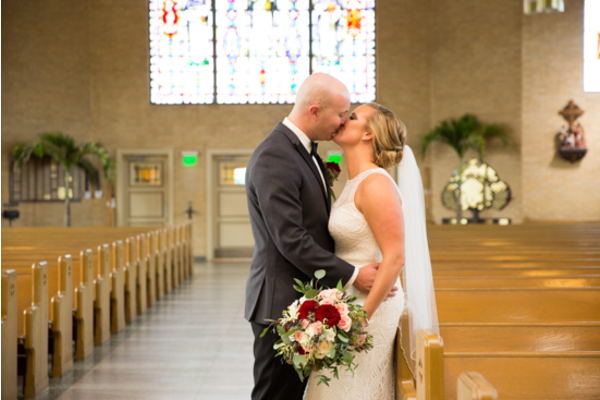 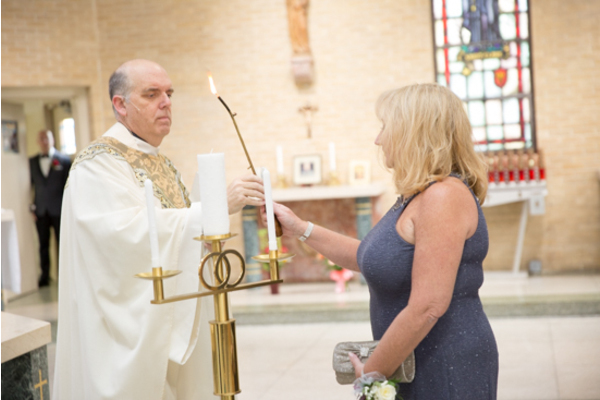 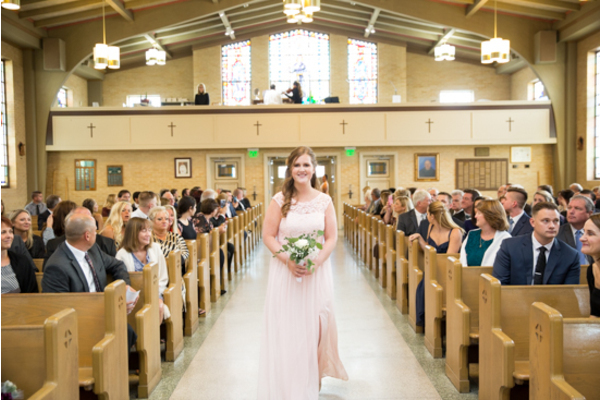 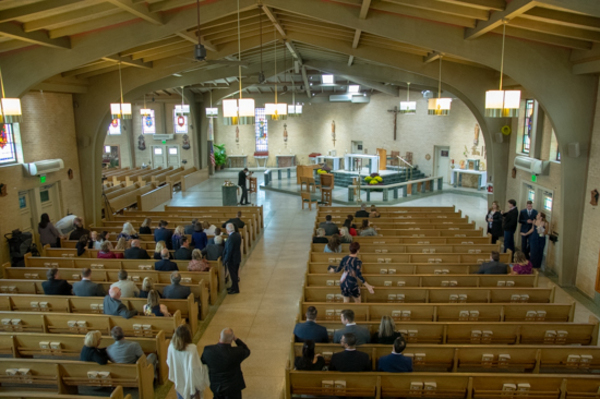 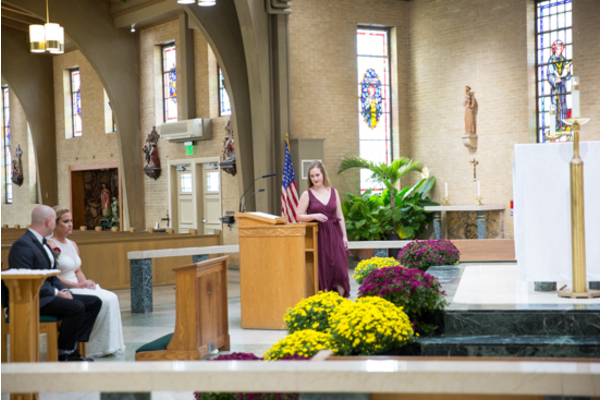 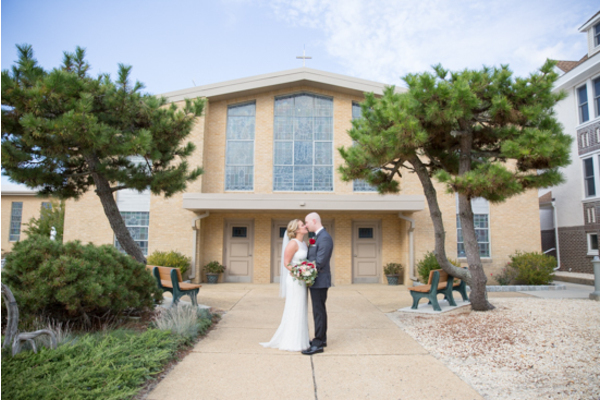 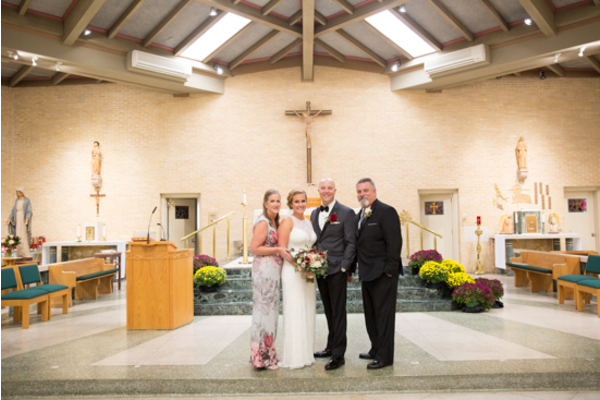 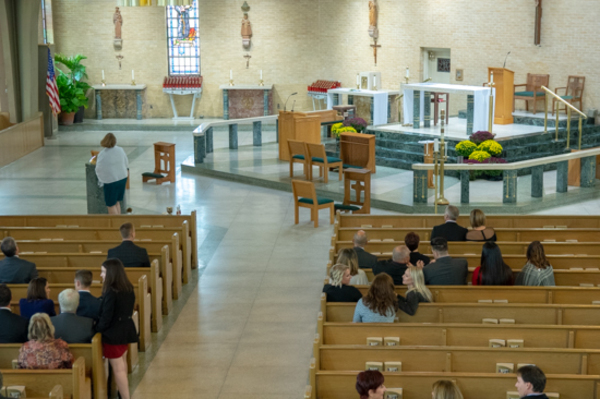 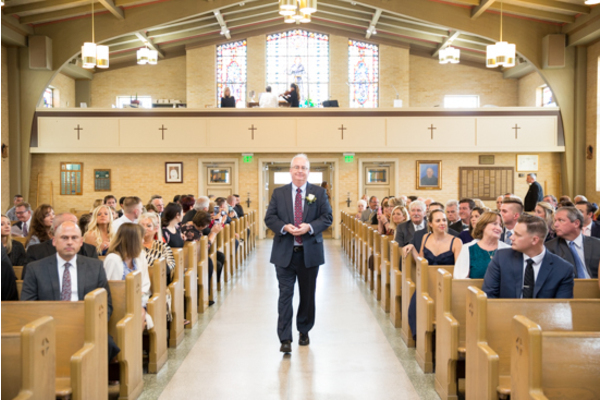 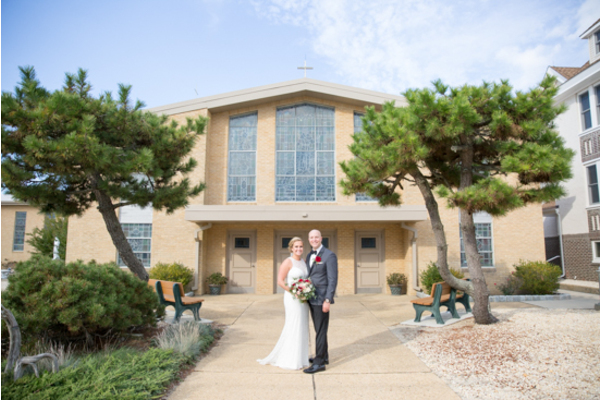 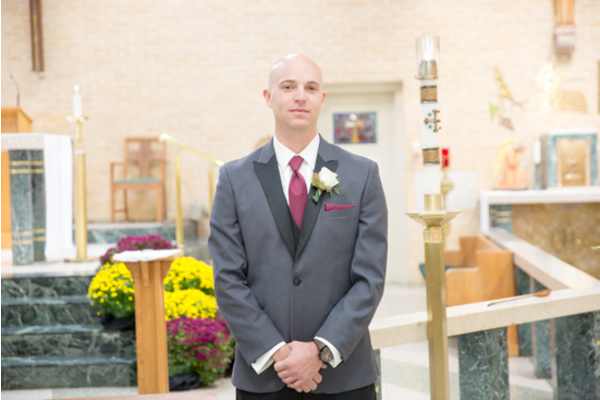 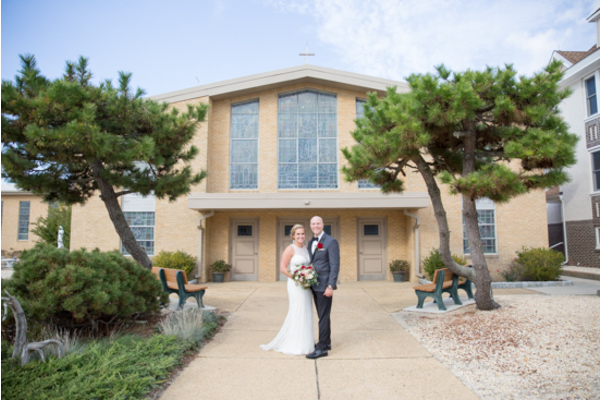 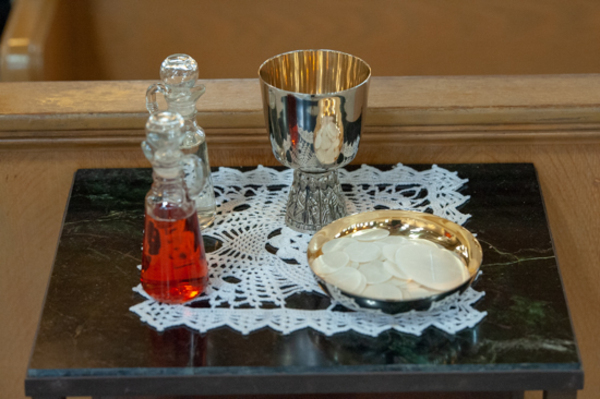 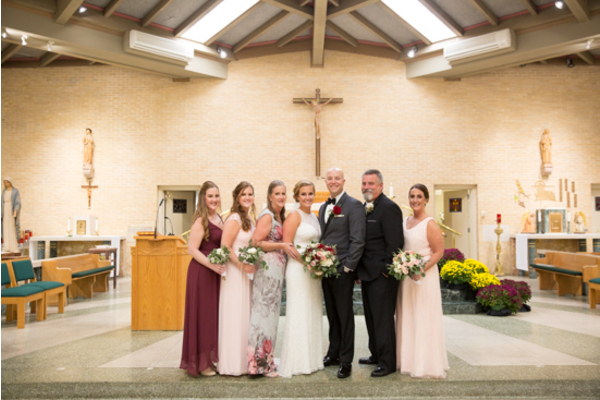 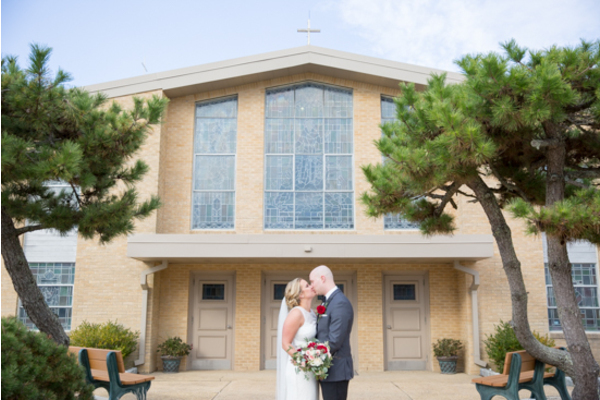 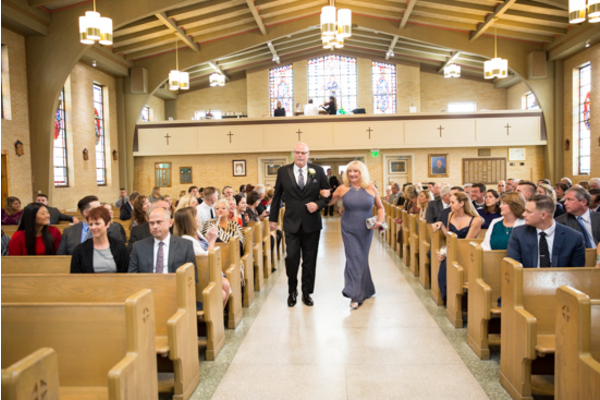 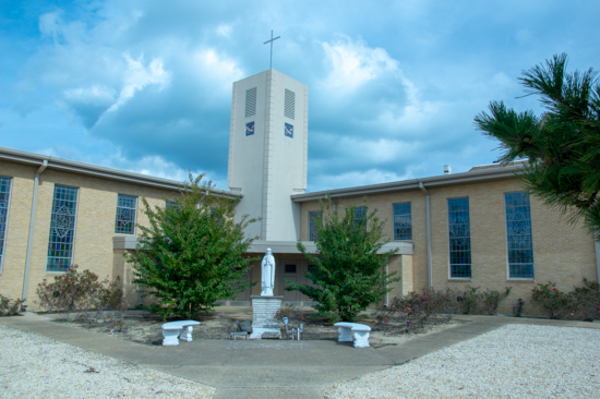 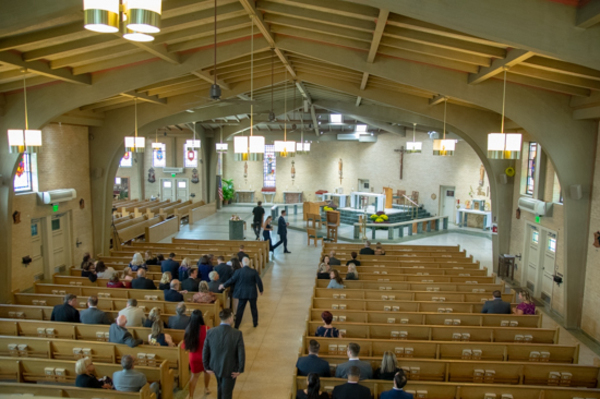 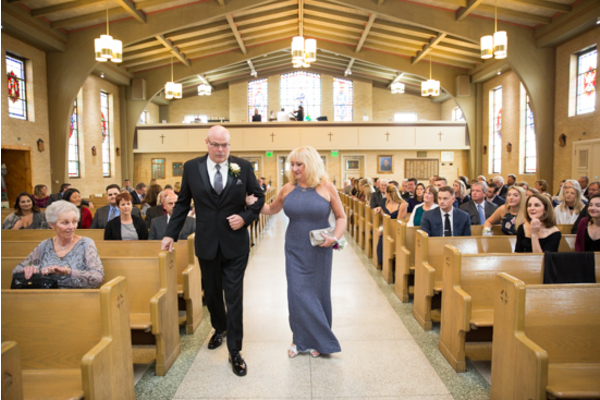 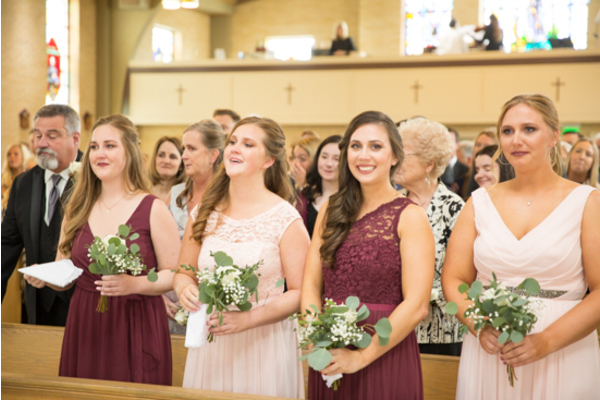 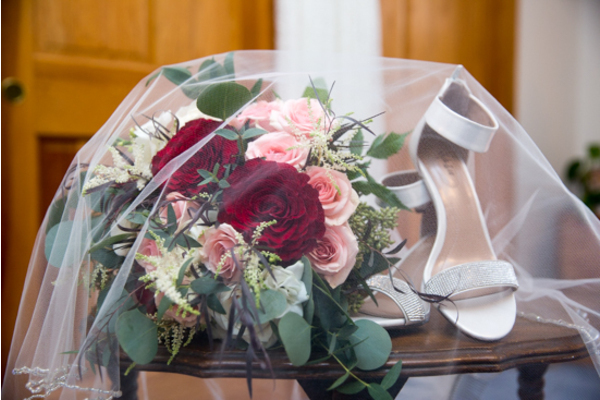 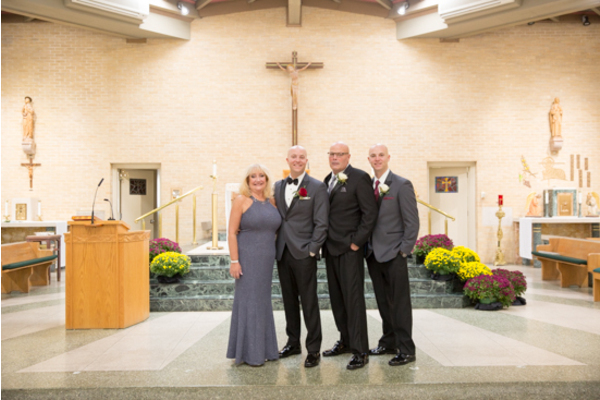 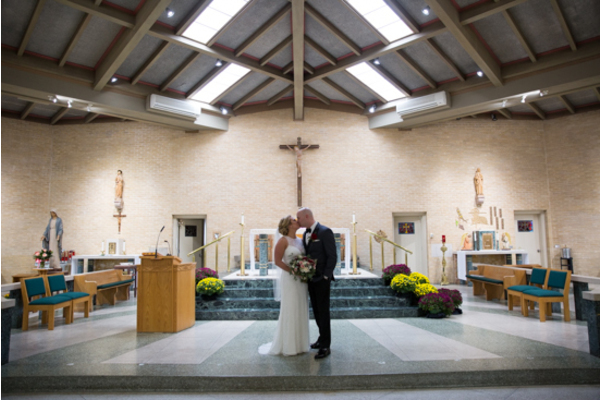 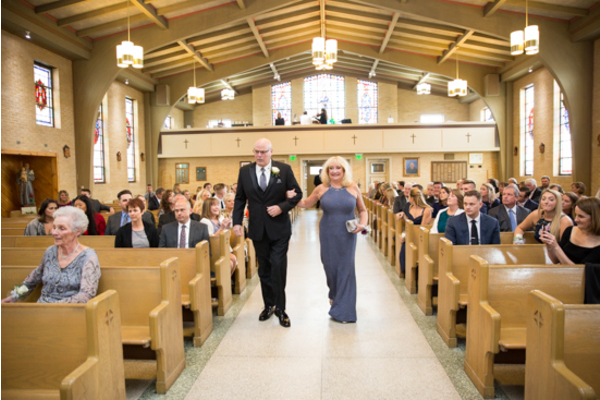 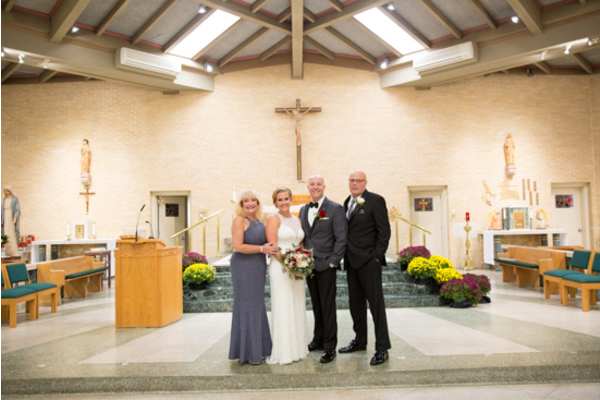 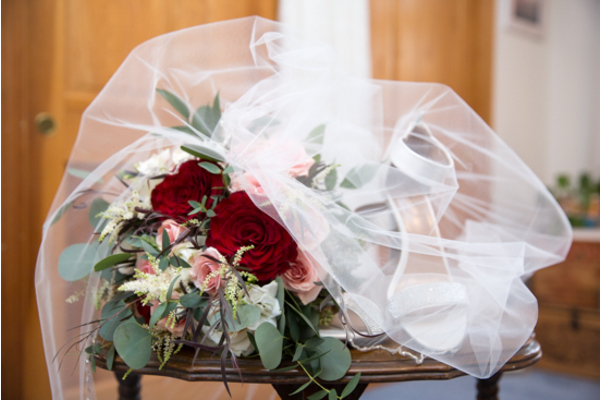 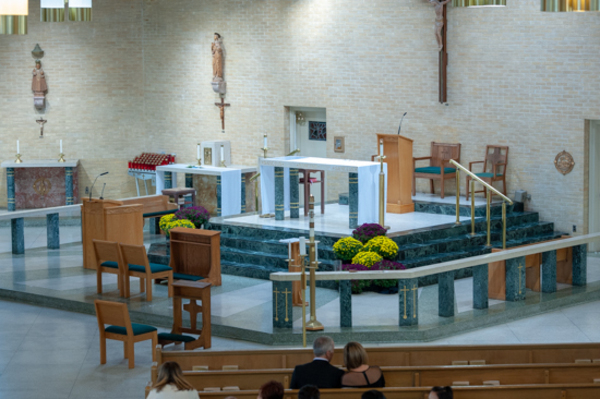 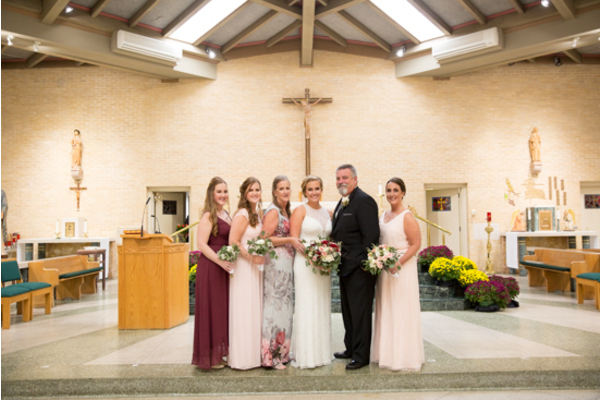 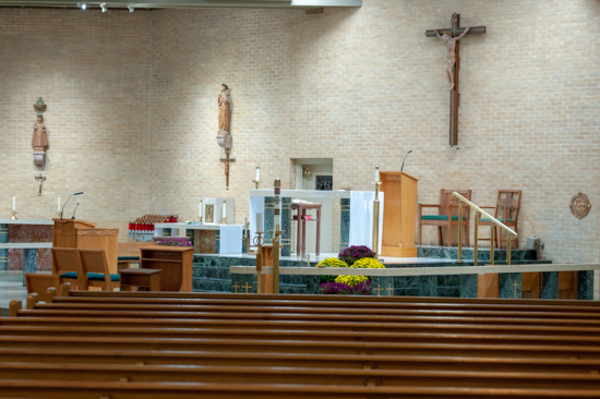 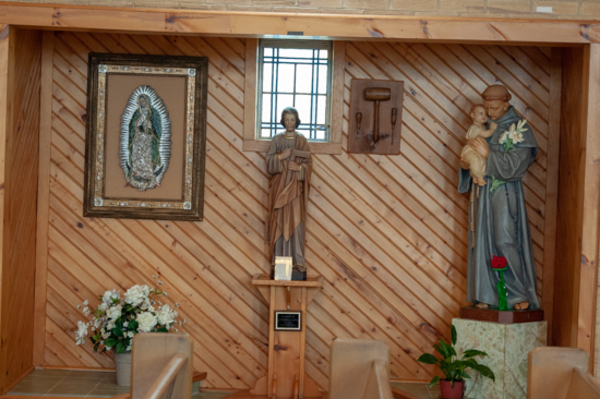 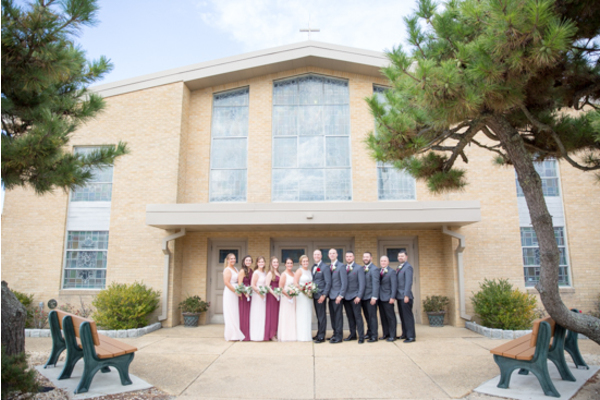 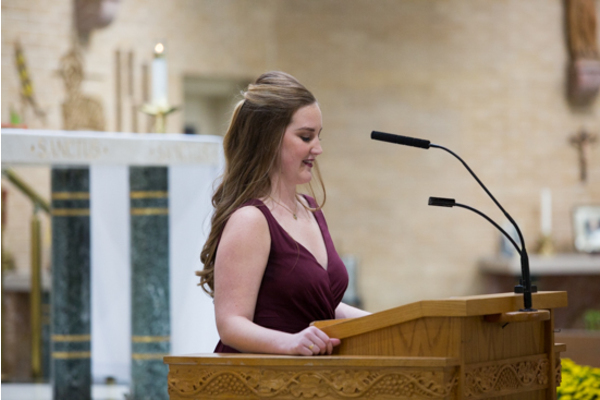 This beautiful spacious church was perfect for this couple’s ceremony. 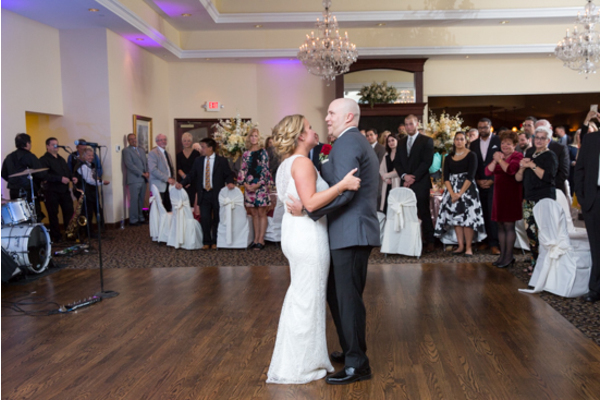 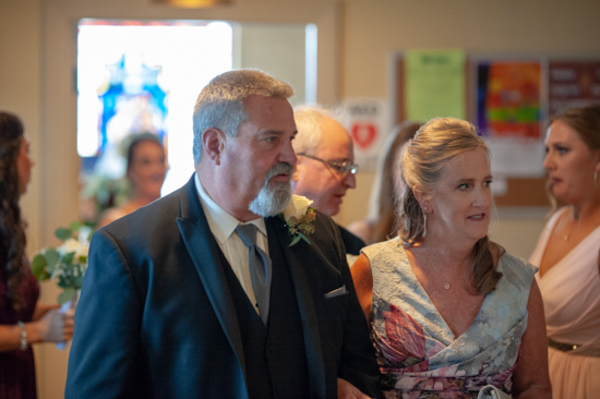 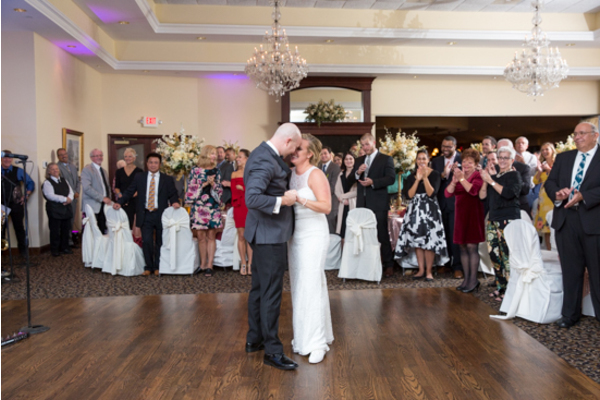 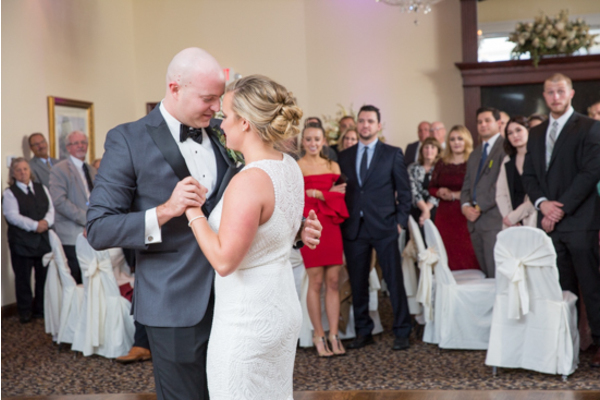 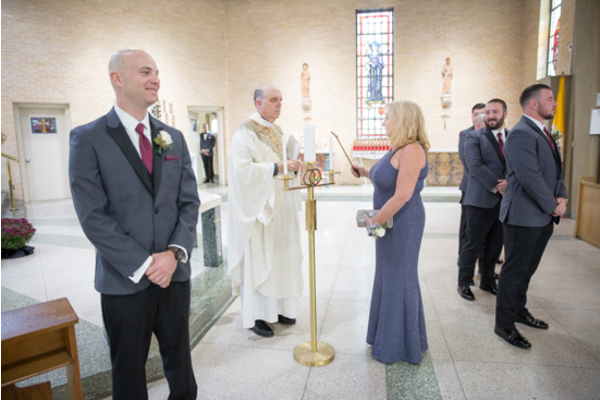 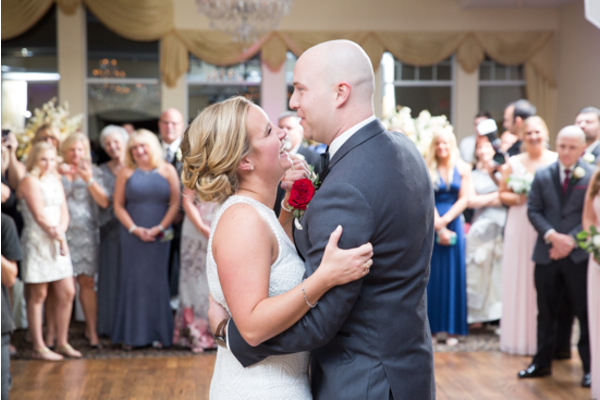 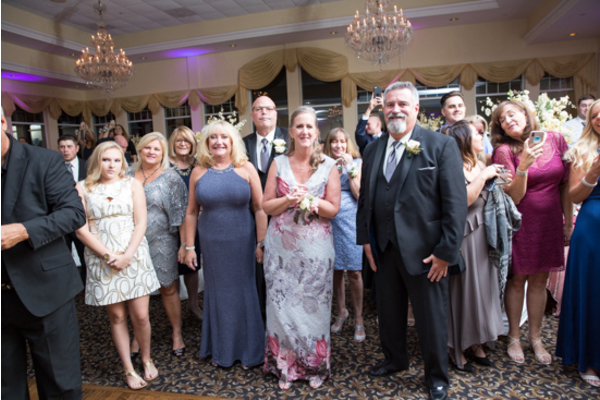 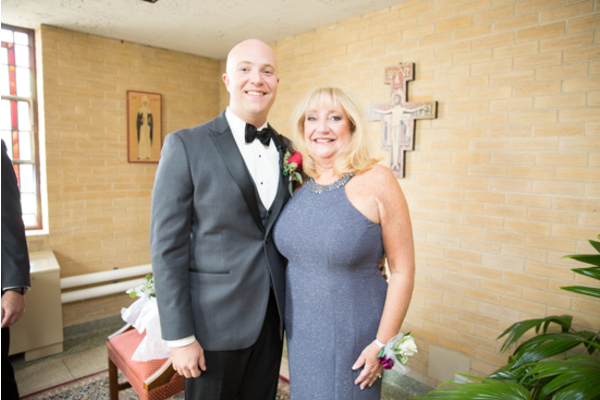 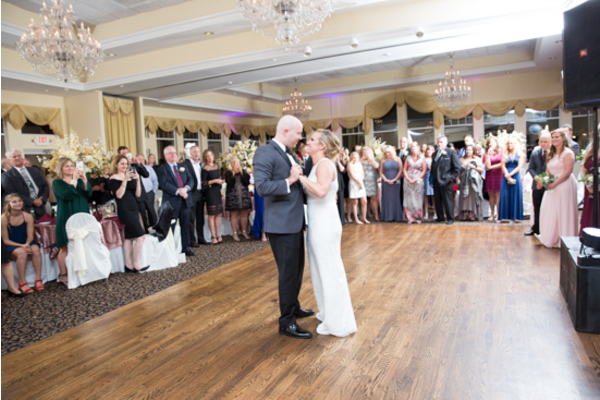 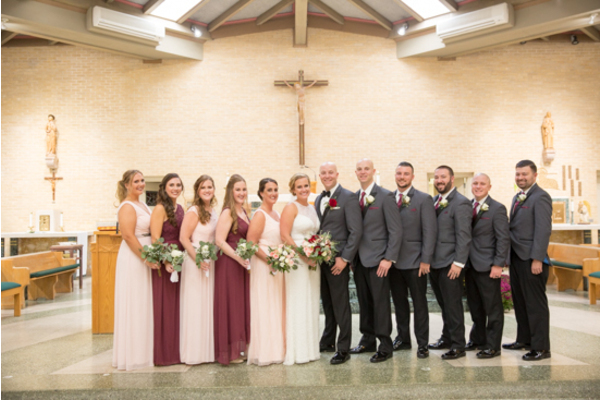 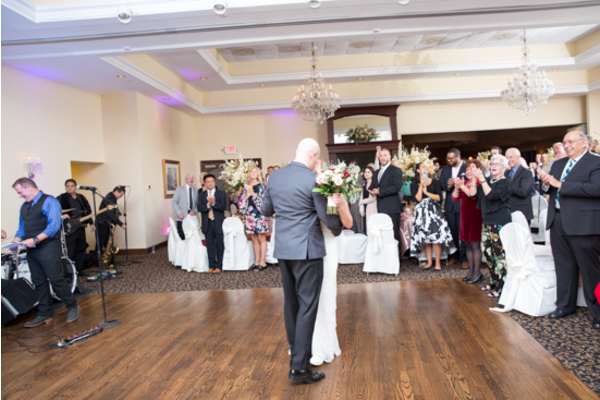 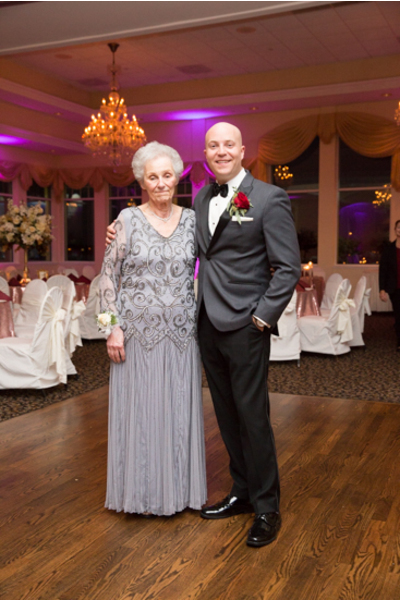 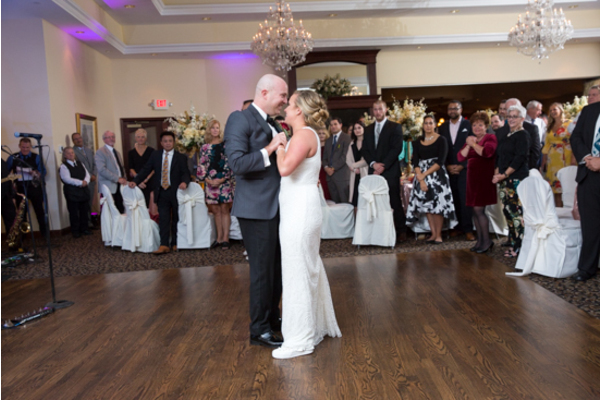 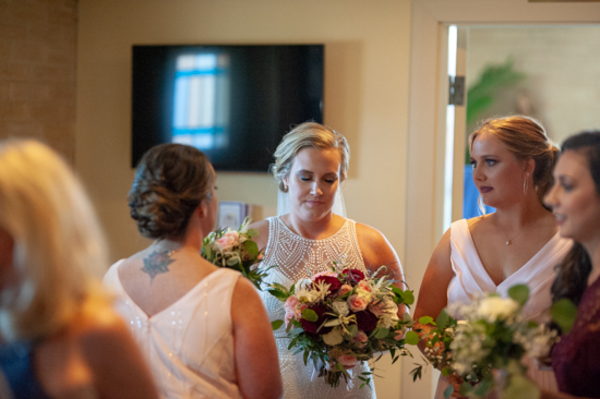 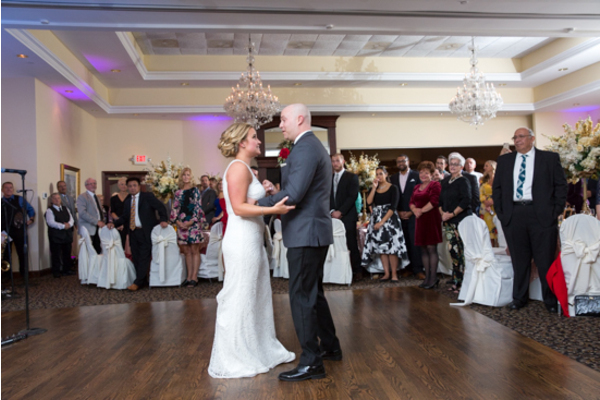 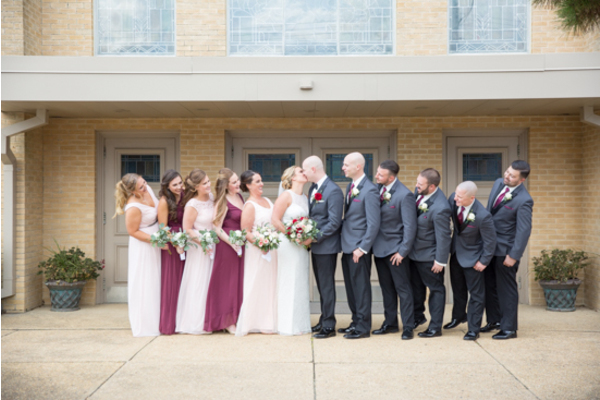 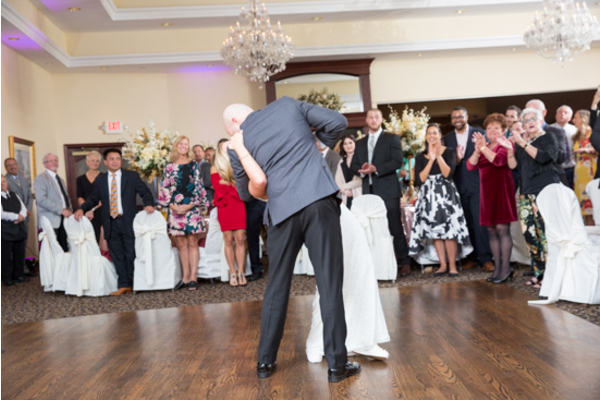 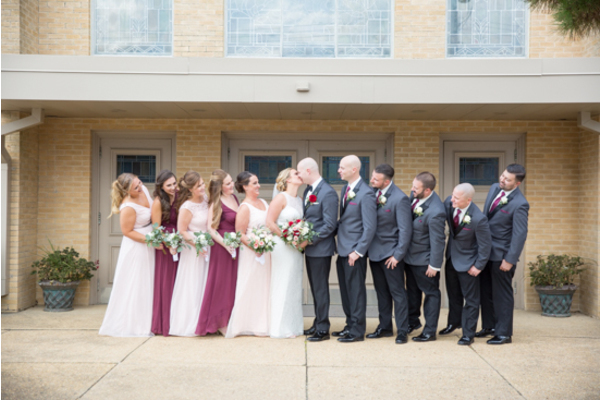 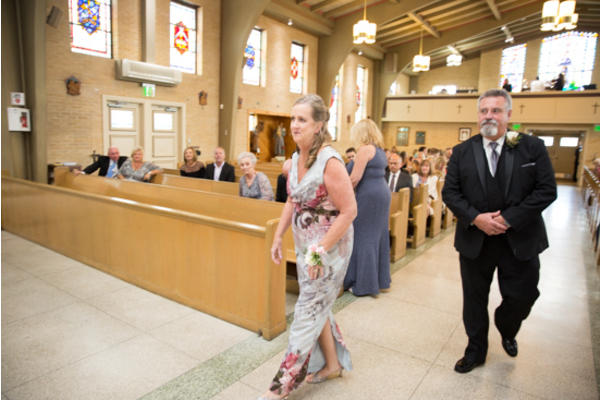 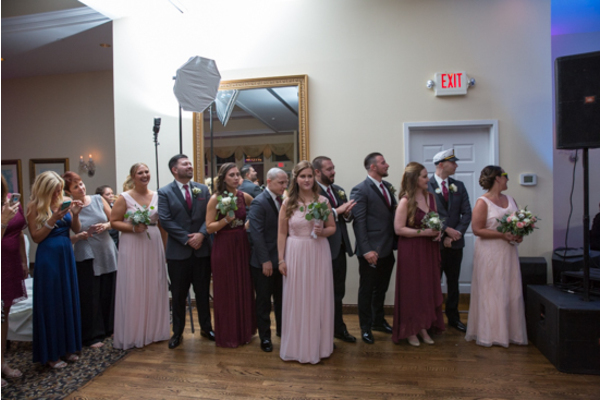 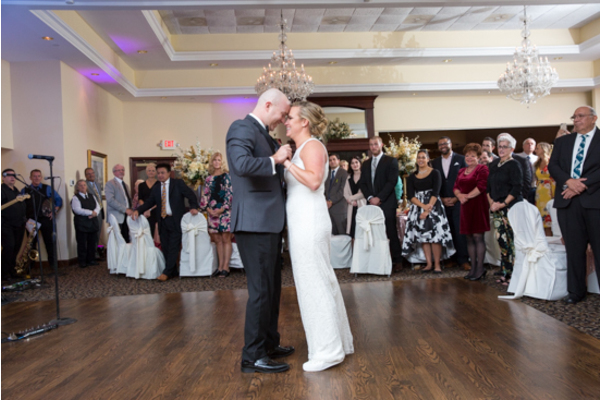 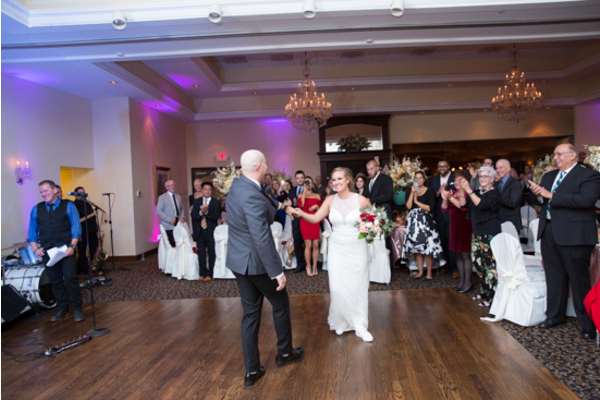 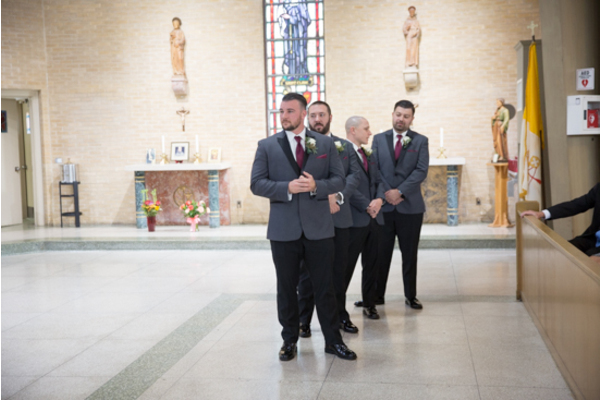 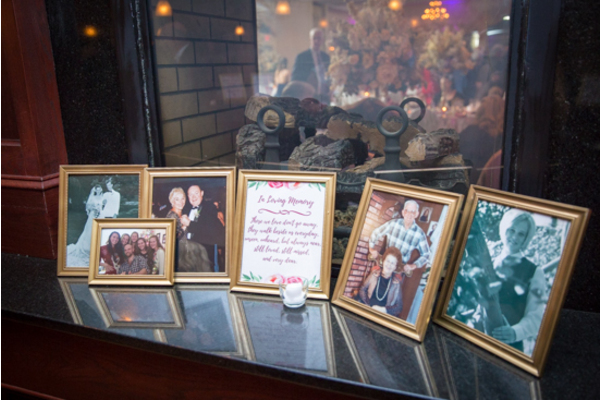 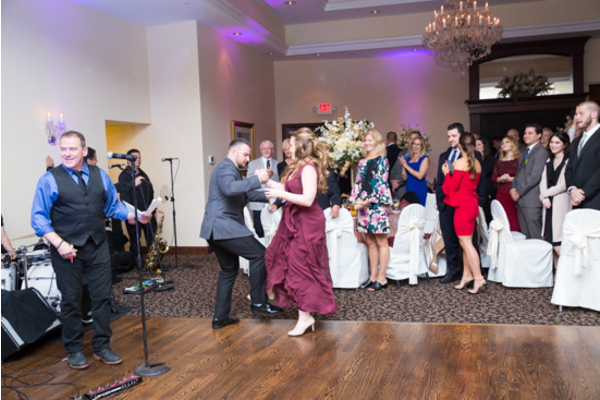 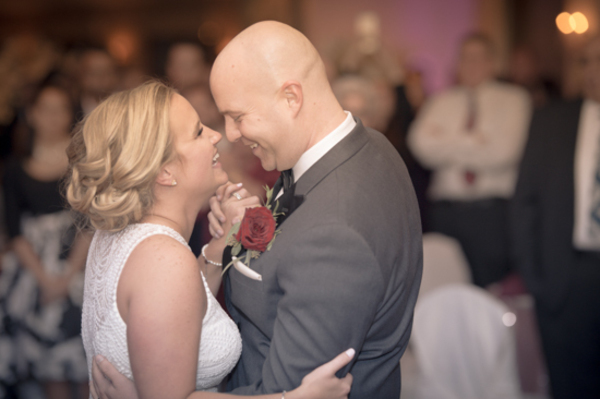 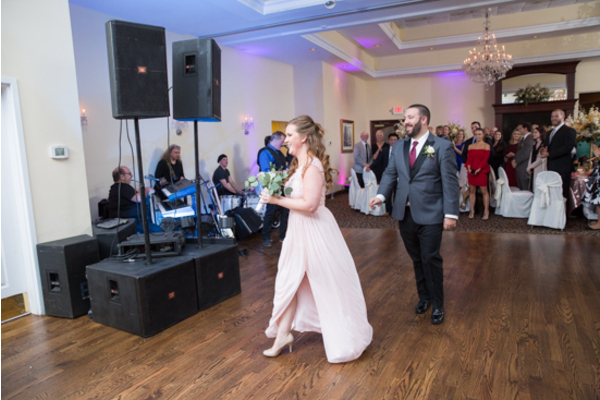 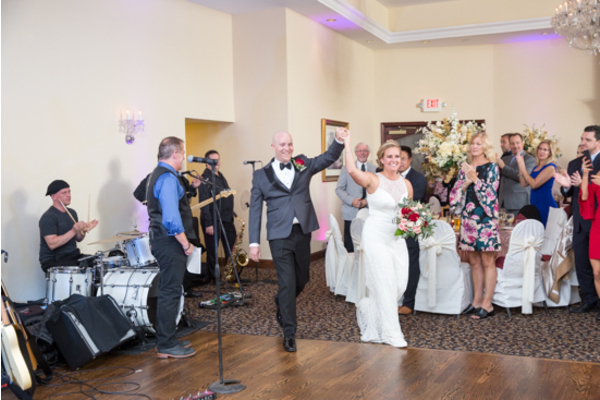 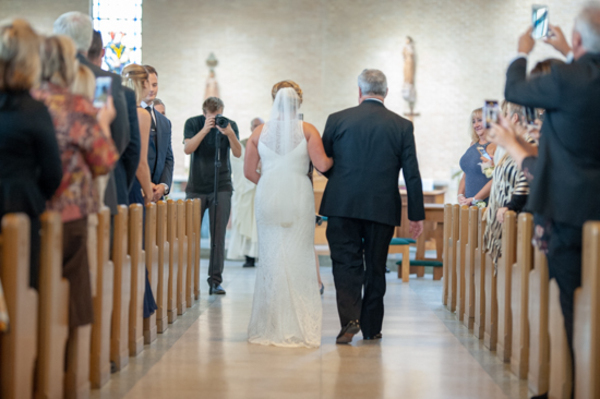 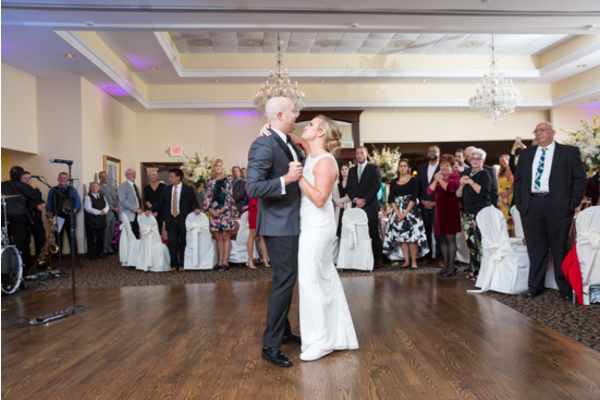 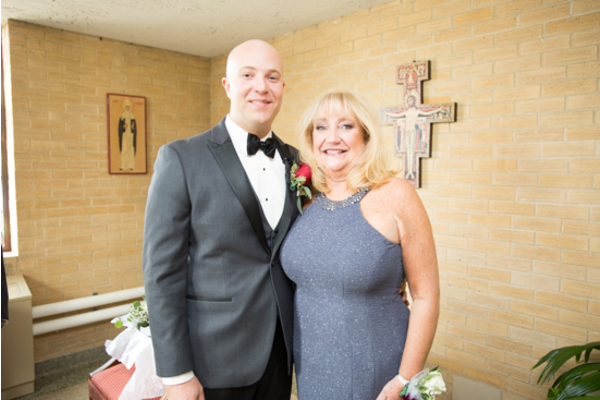 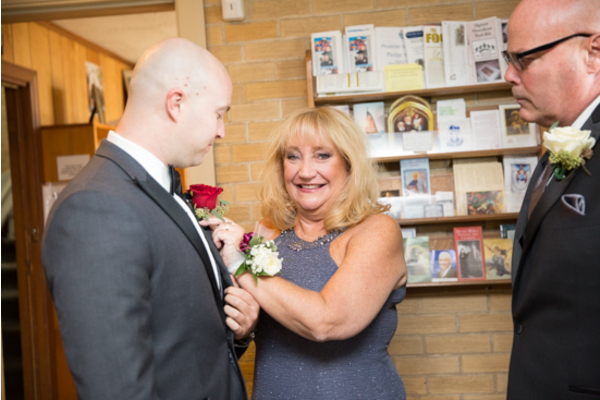 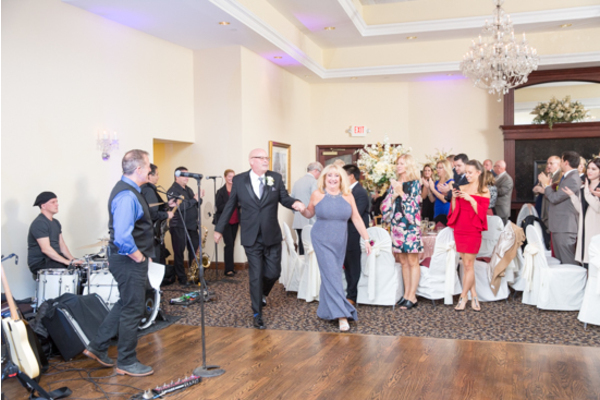 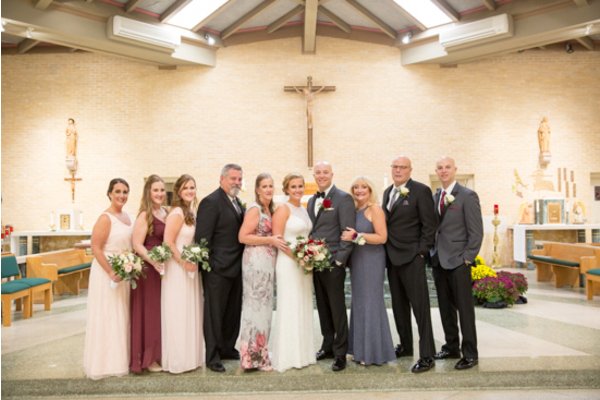 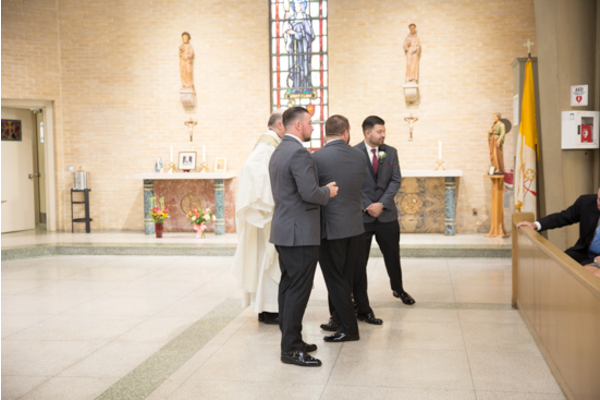 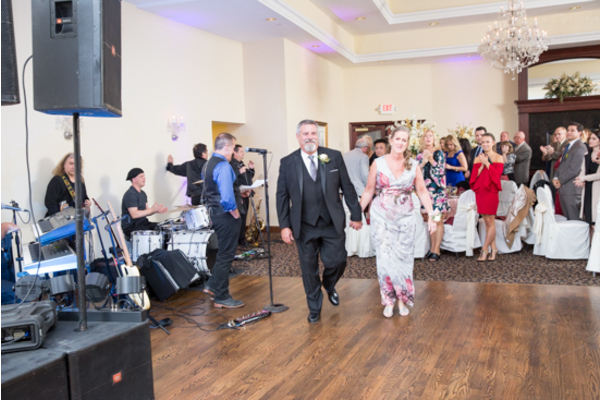 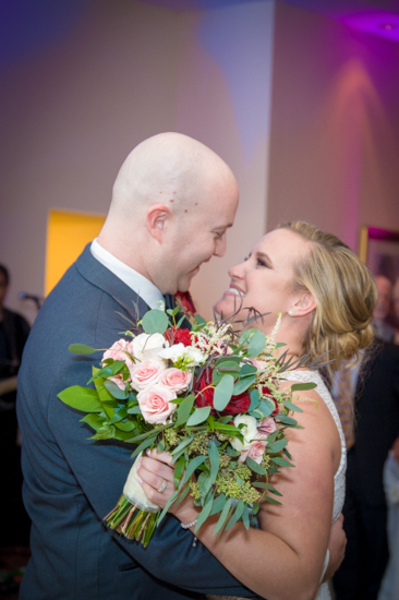 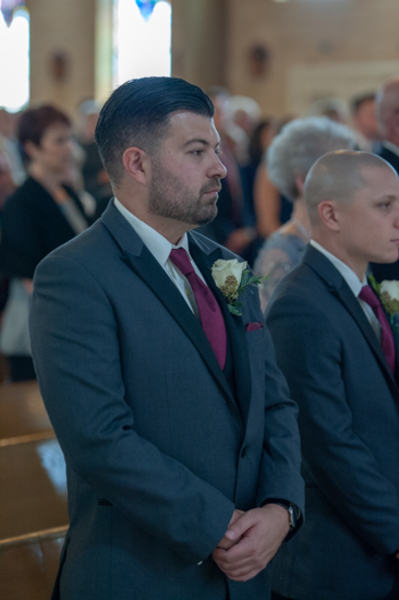 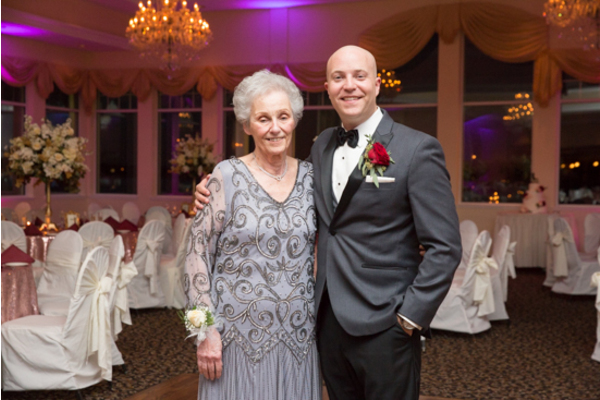 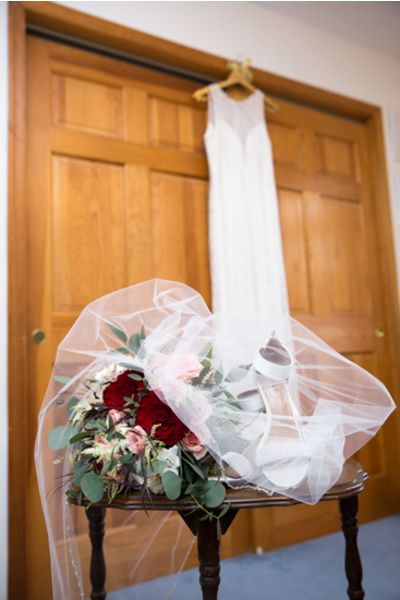 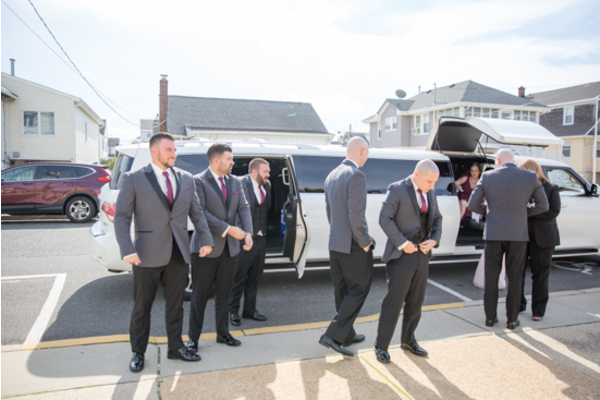 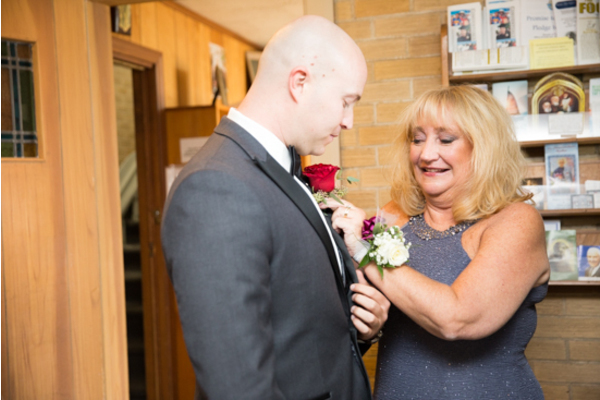 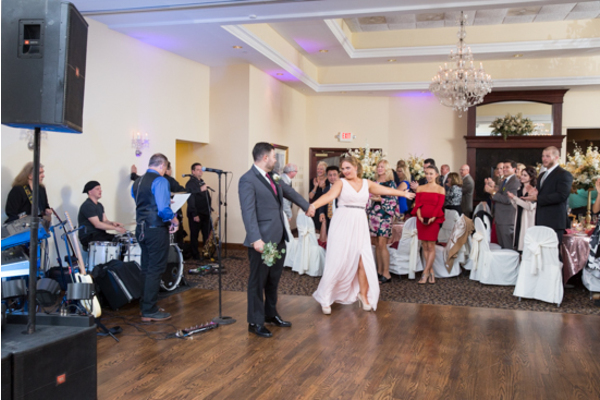 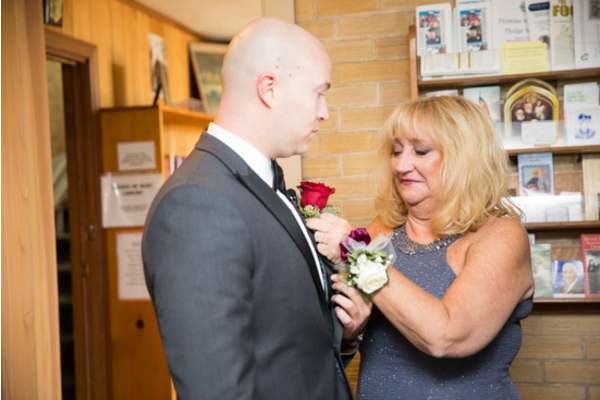 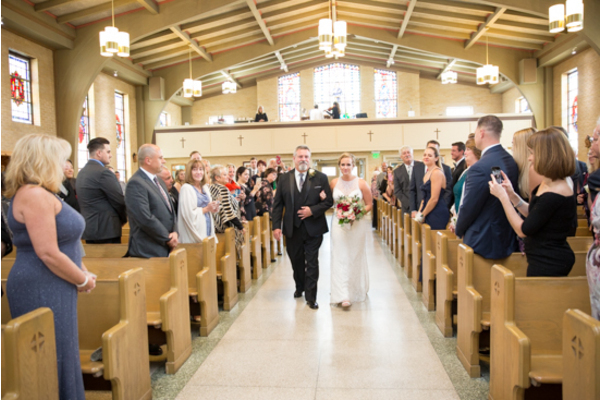 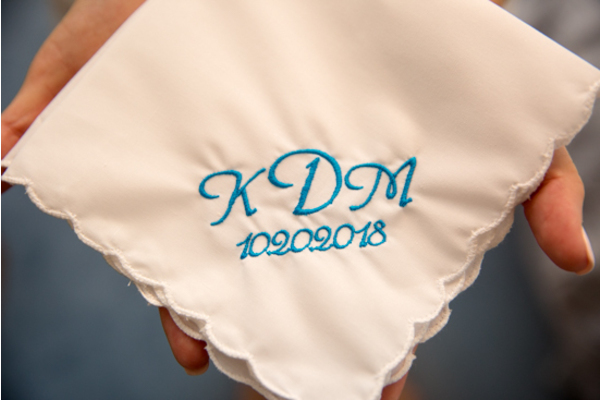 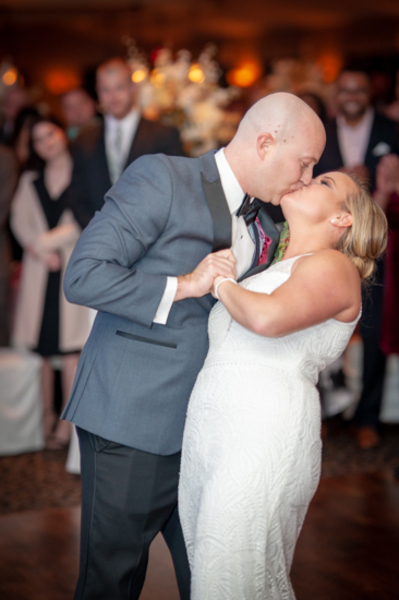 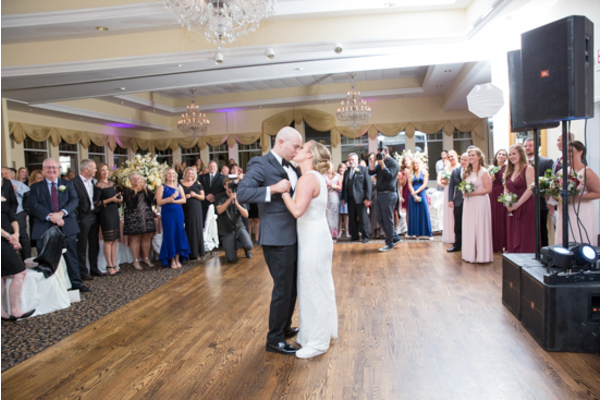 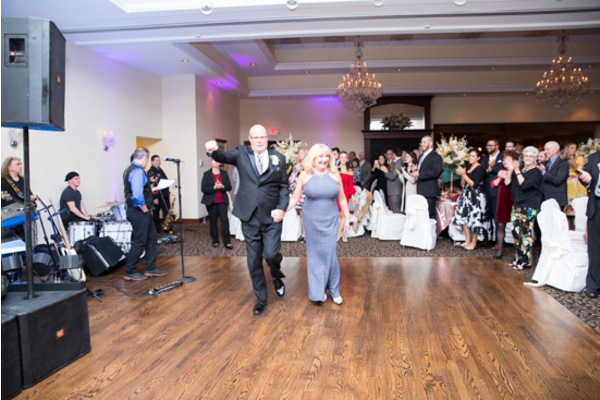 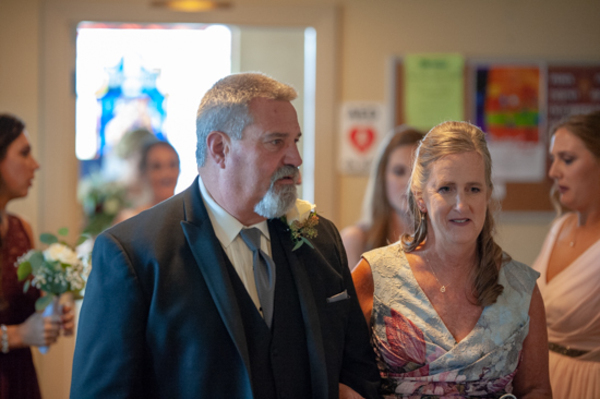 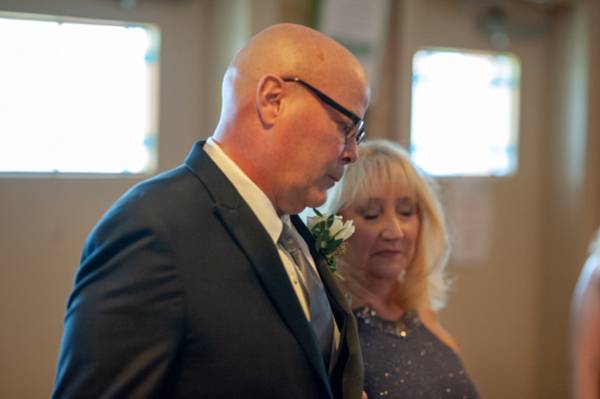 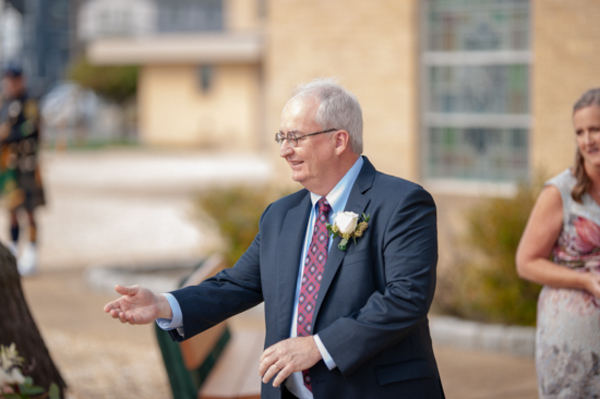 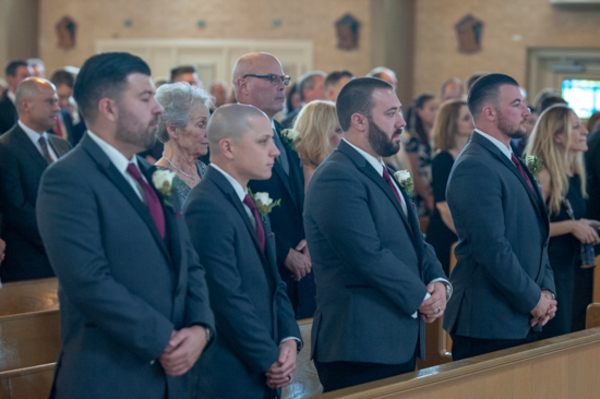 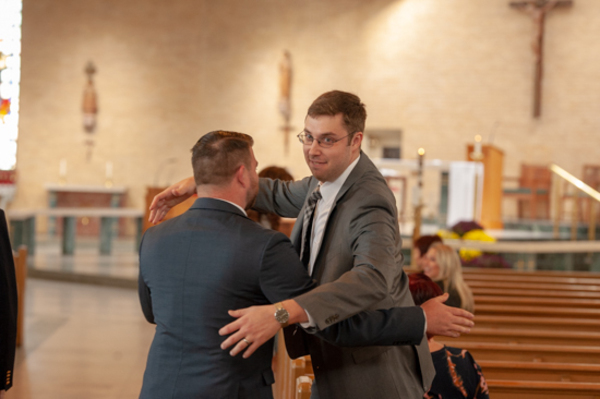 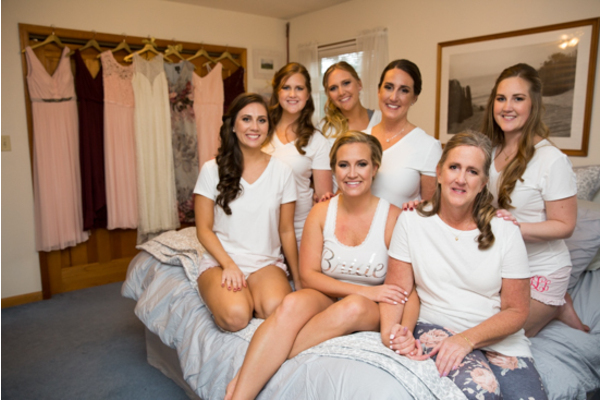 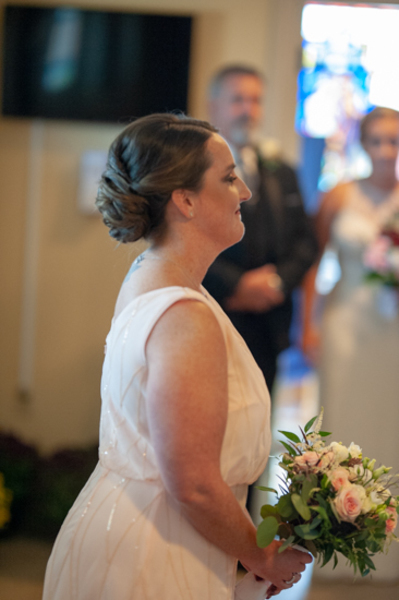 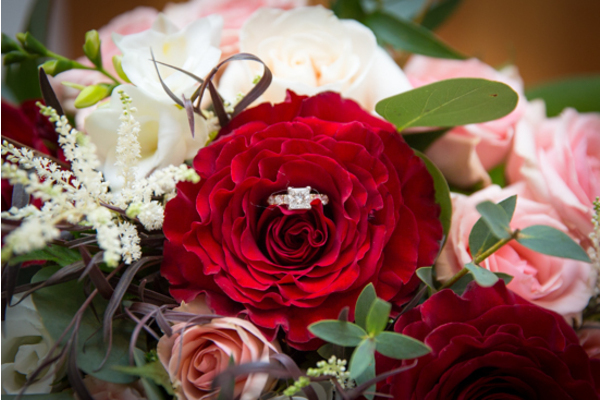 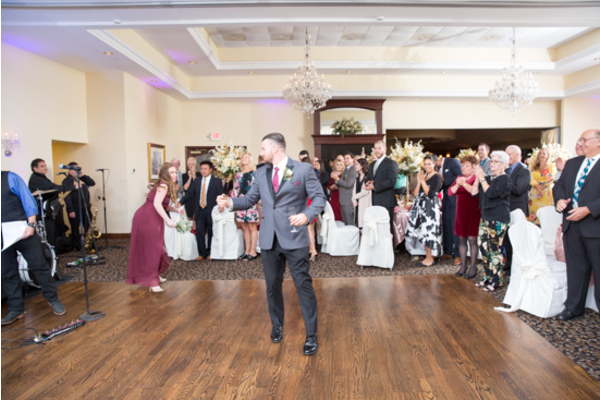 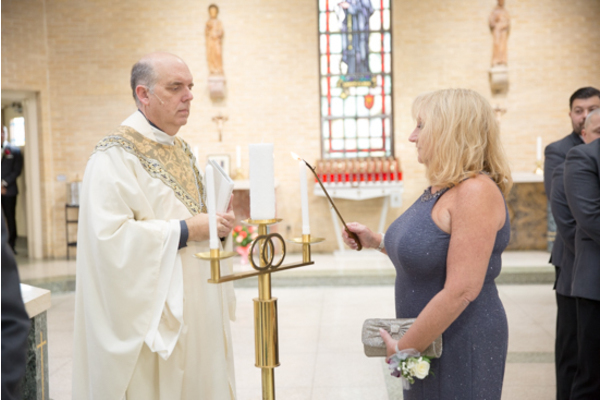 Our NJ Wedding Photographer photographed all the emotions that filled the crowd as the couple finally held hands and said their lifelong vows to each other. 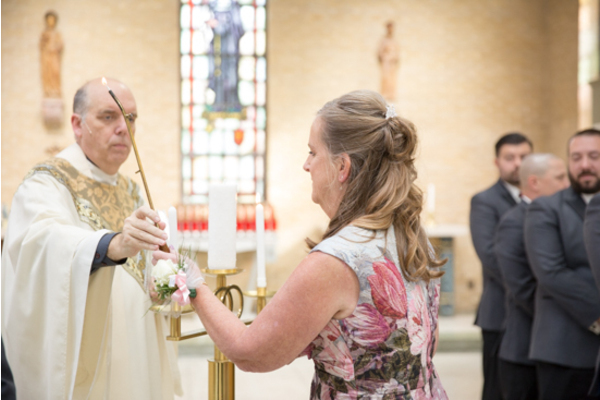 At last, they were officially wed! 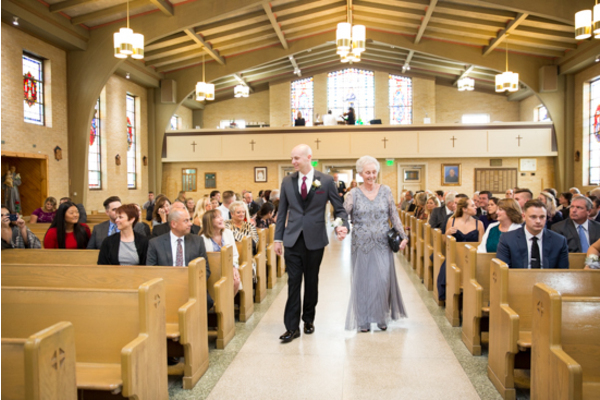 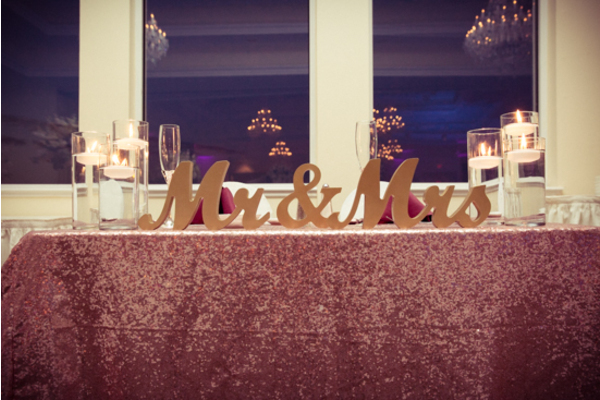 You could truly see their love was unmatched as they made their way back down the aisle. 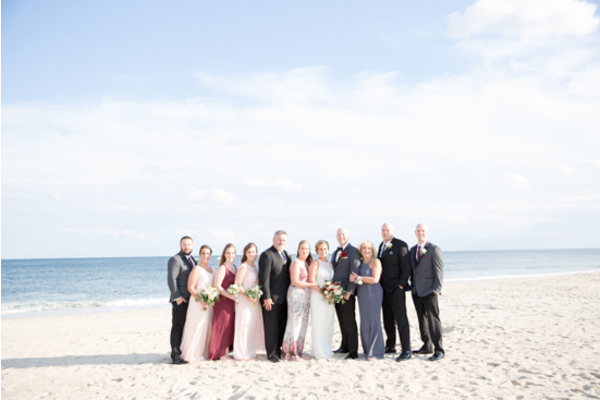 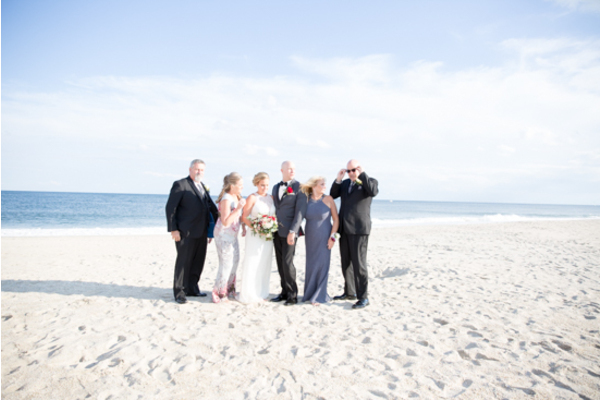 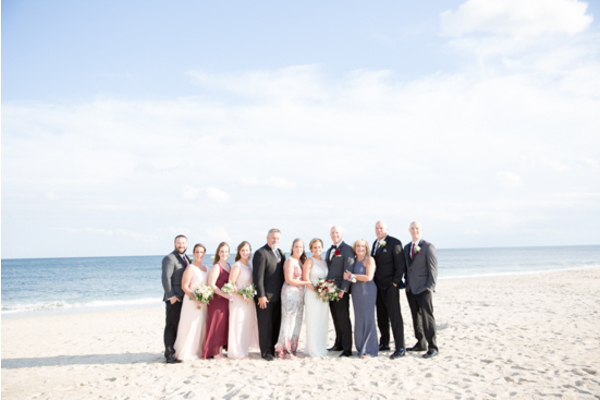 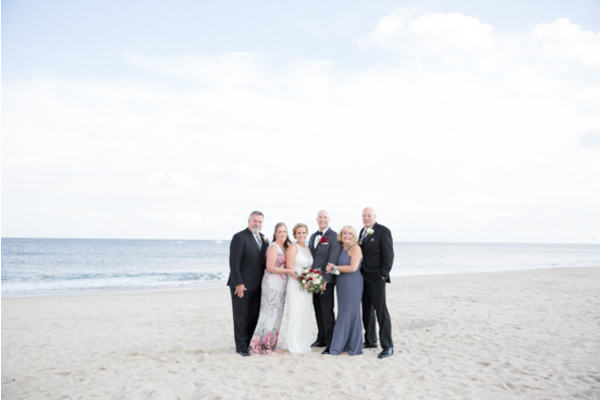 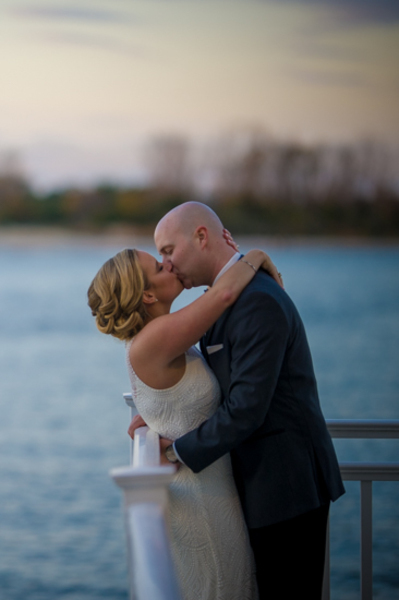 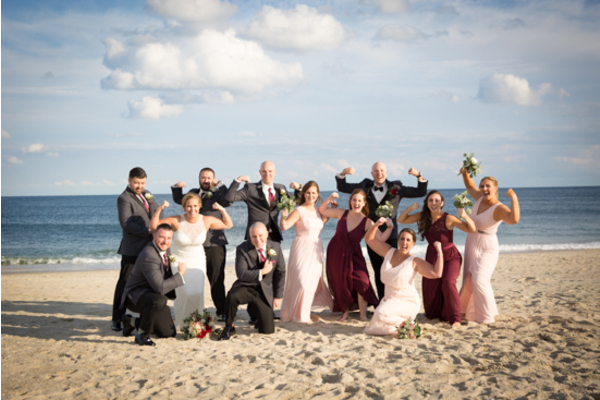 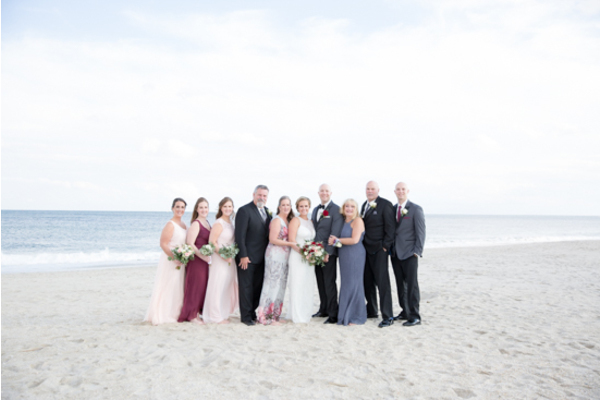 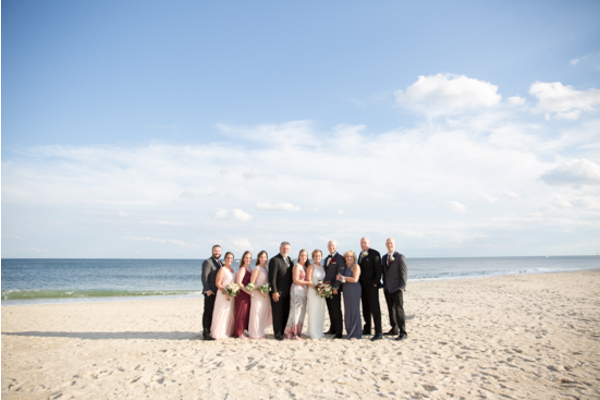 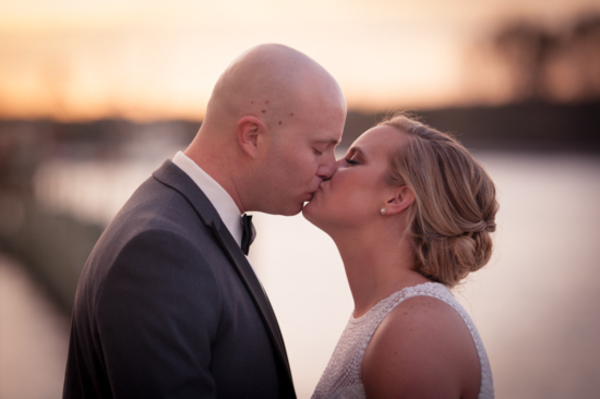 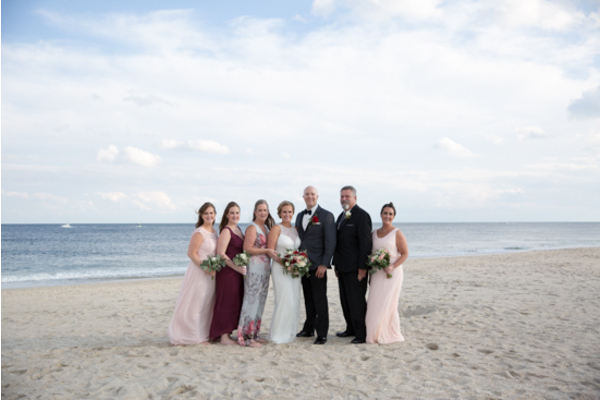 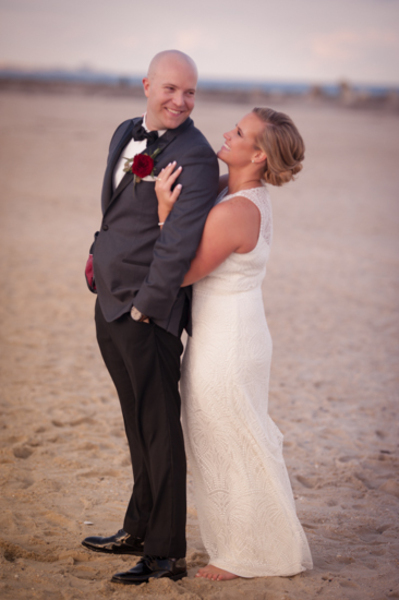 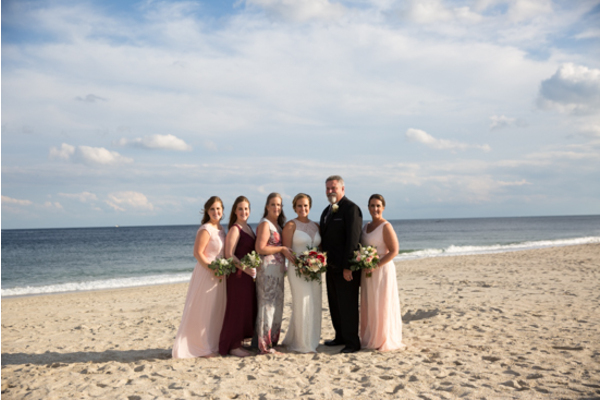 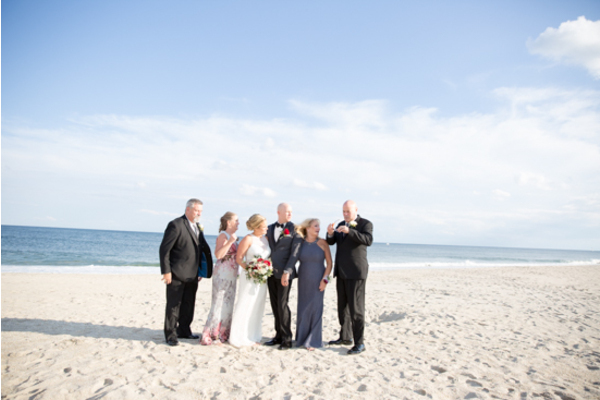 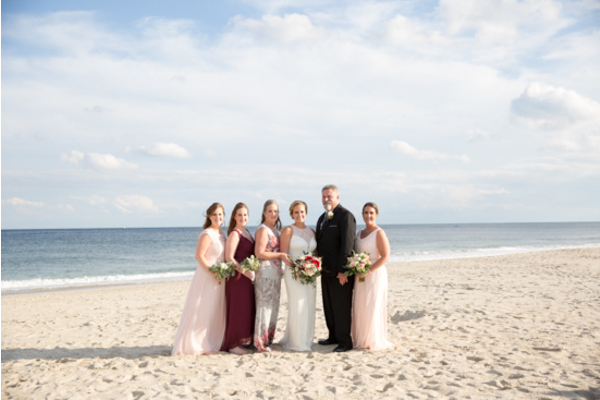 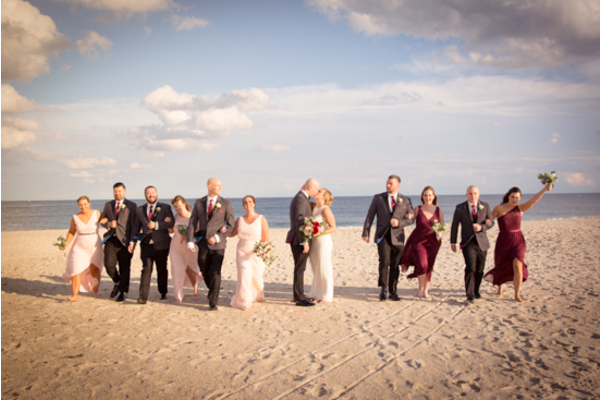 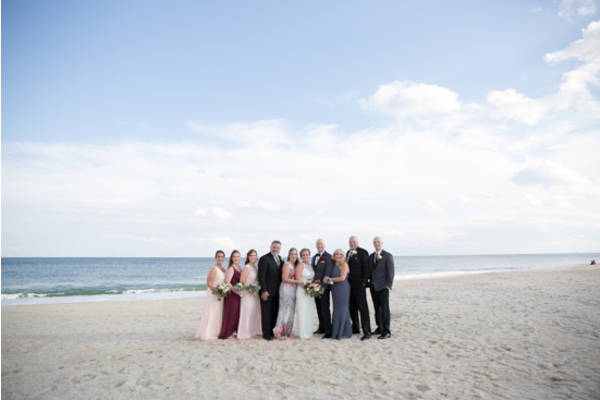 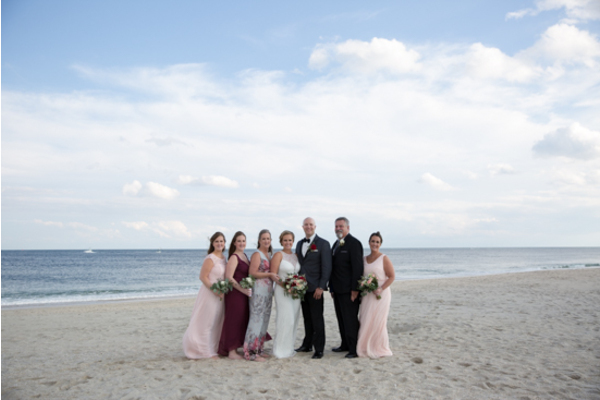 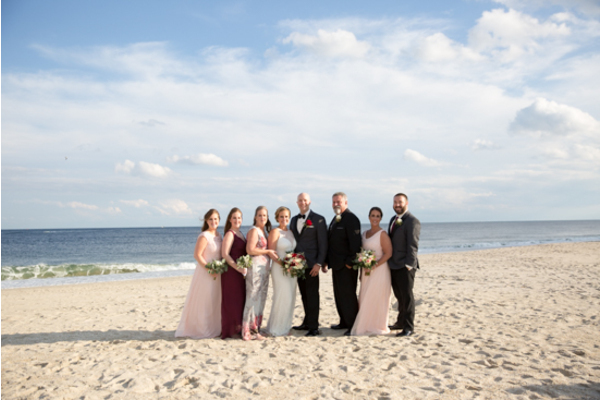 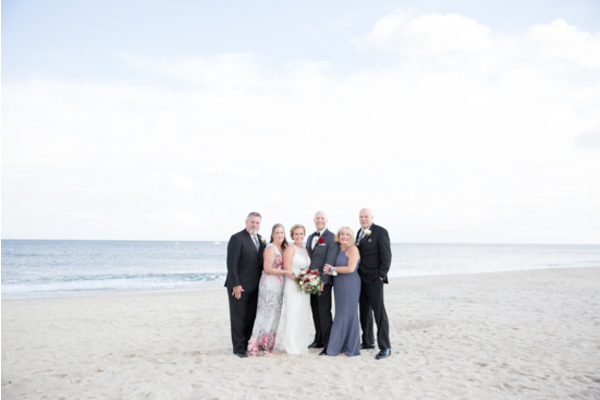 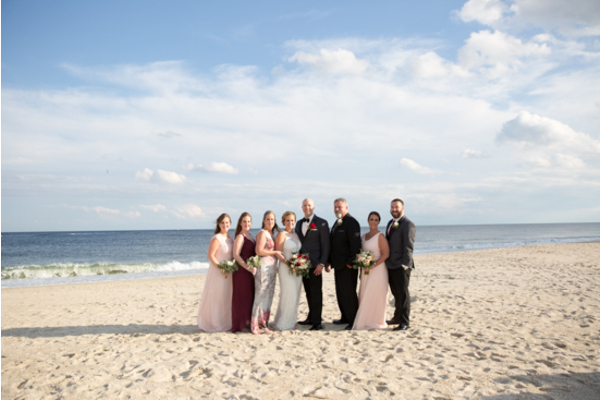 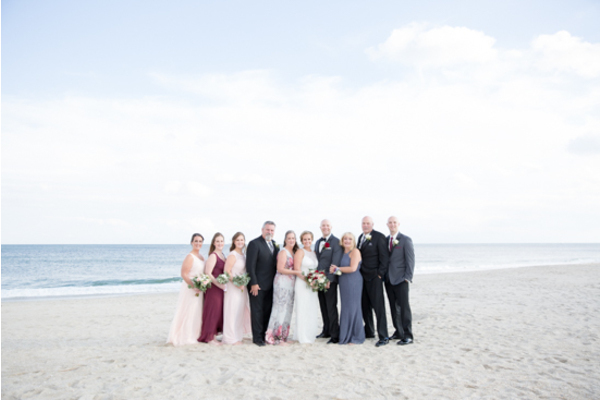 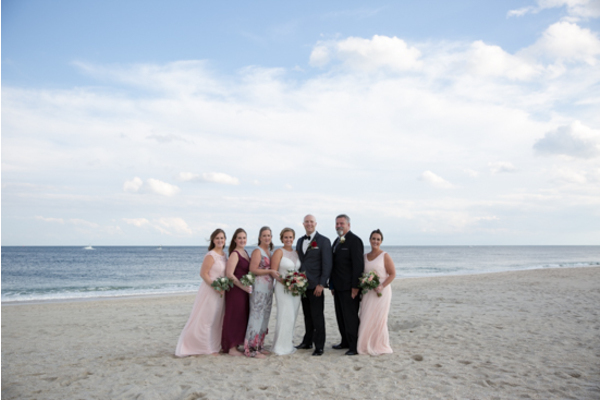 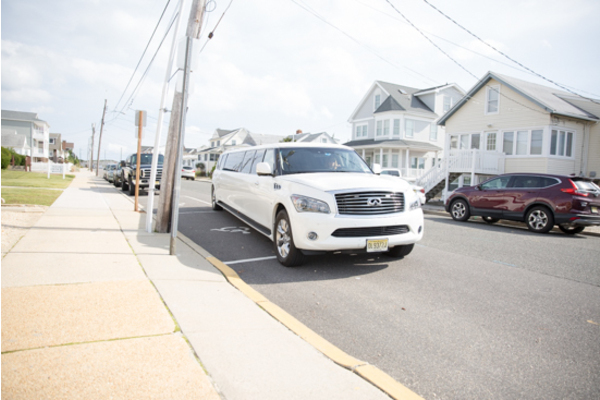 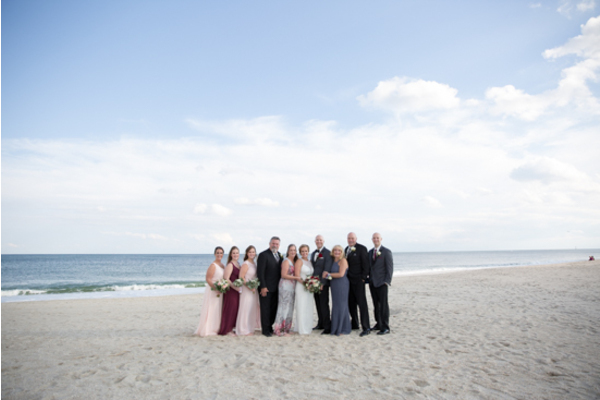 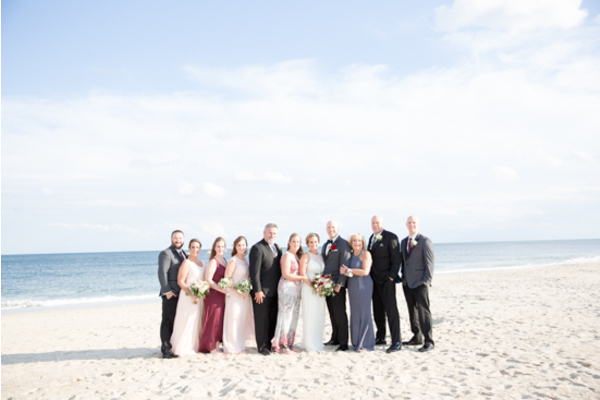 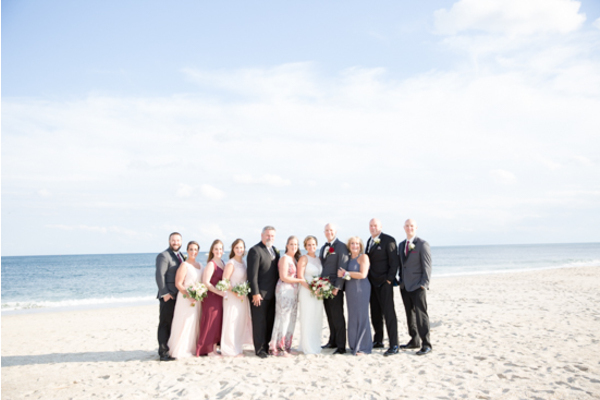 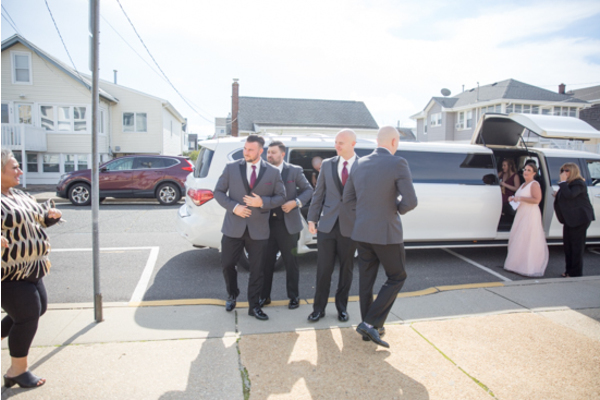 Before making their way to the reception, they took a quick detour to the beach. 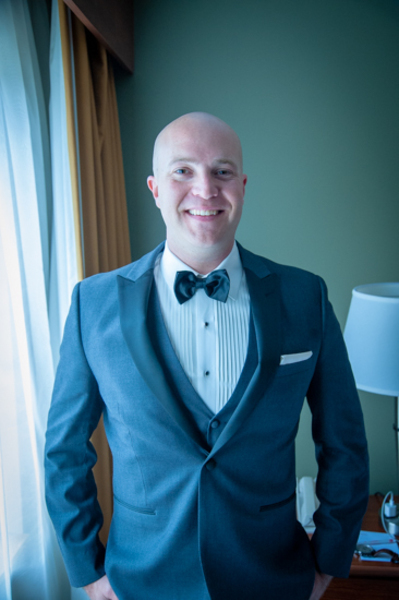 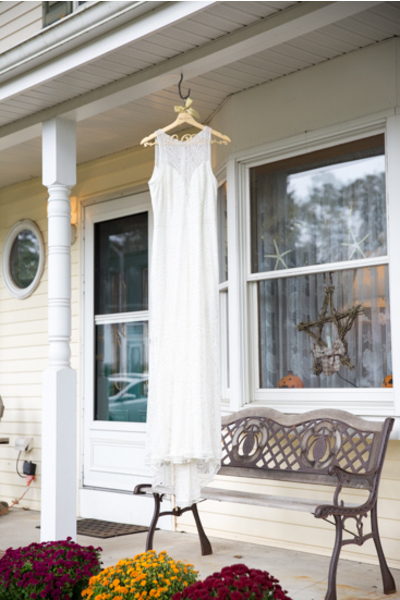 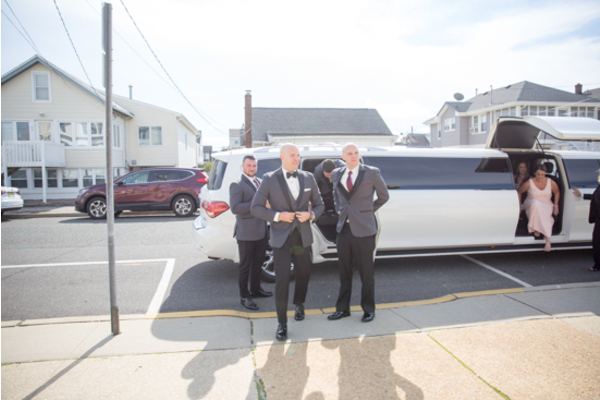 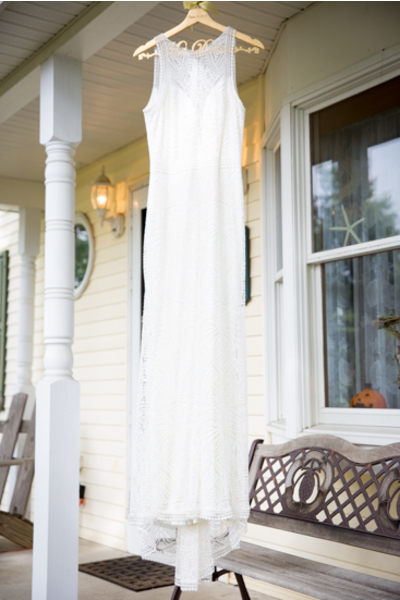 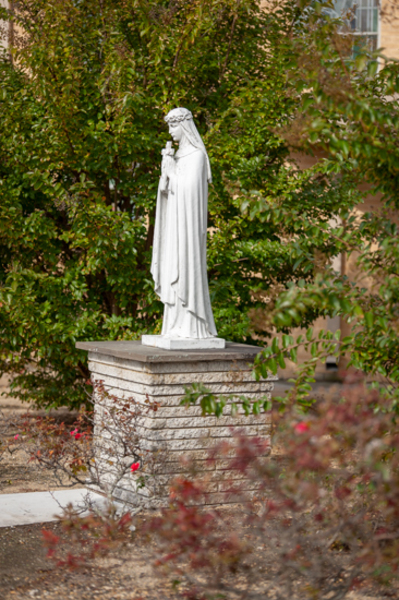 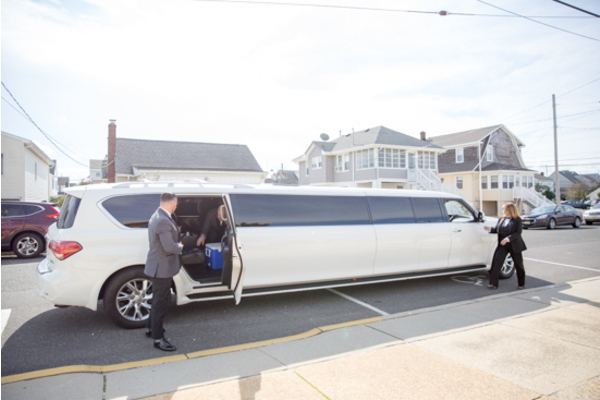 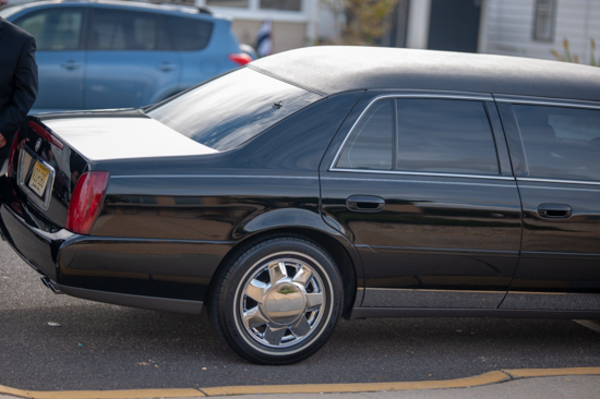 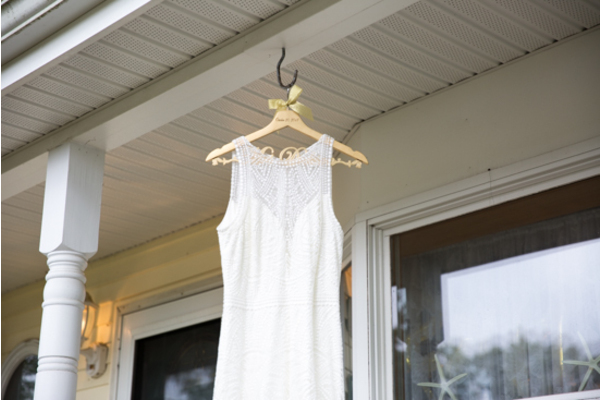 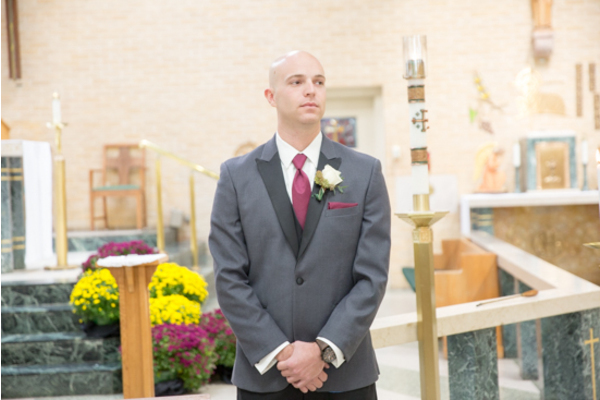 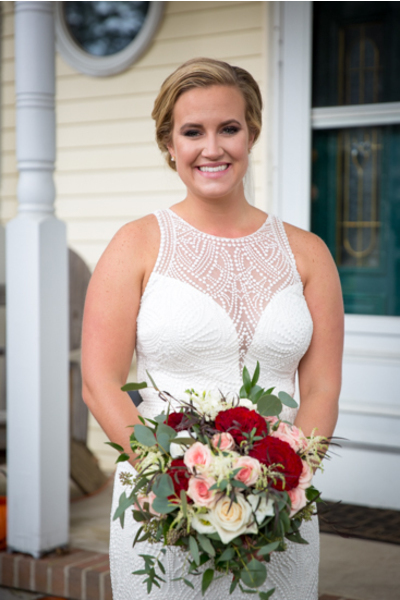 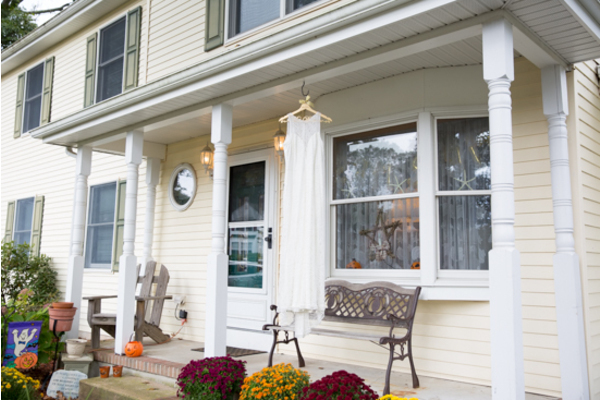 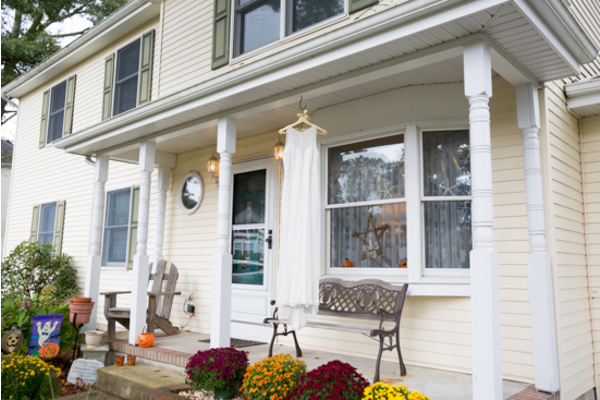 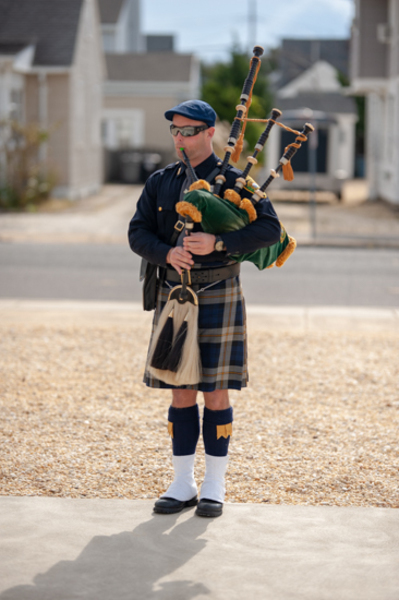 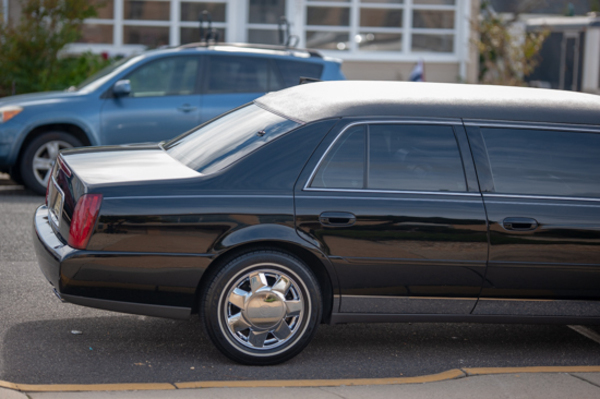 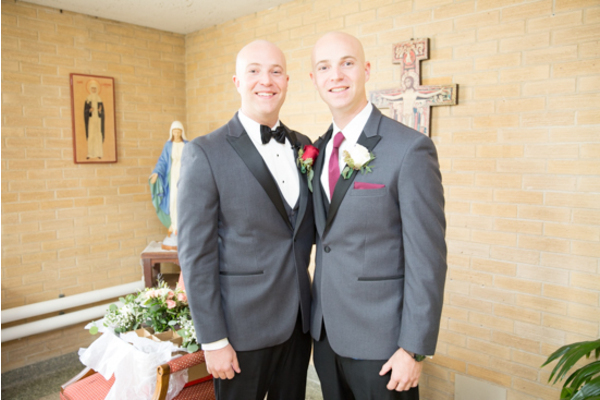 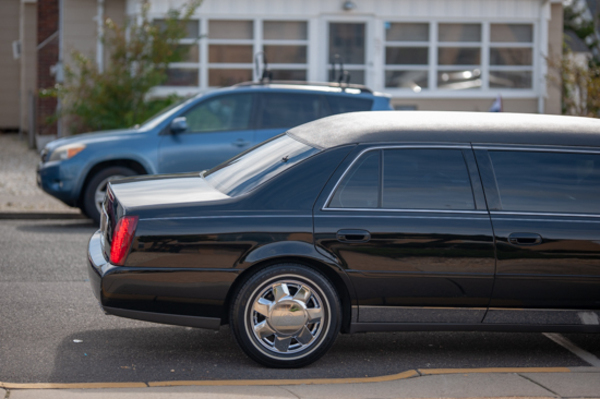 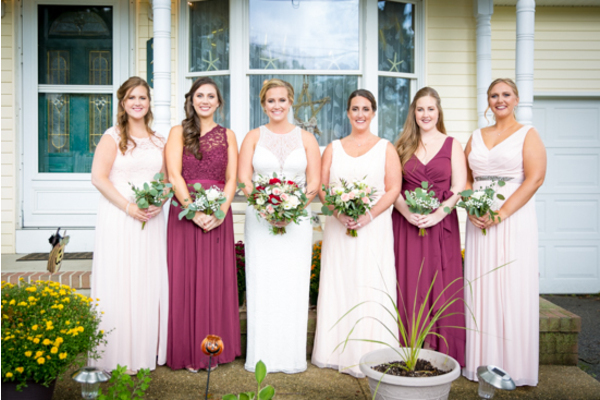 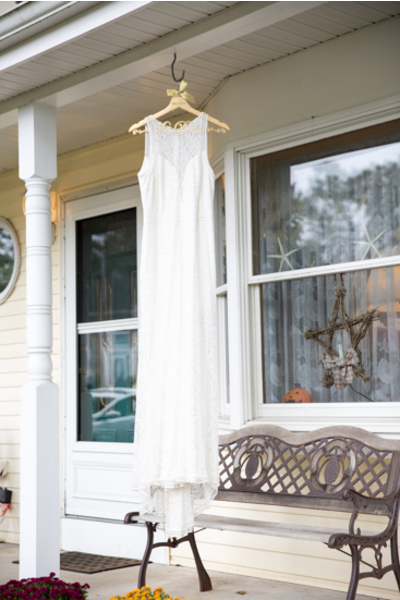 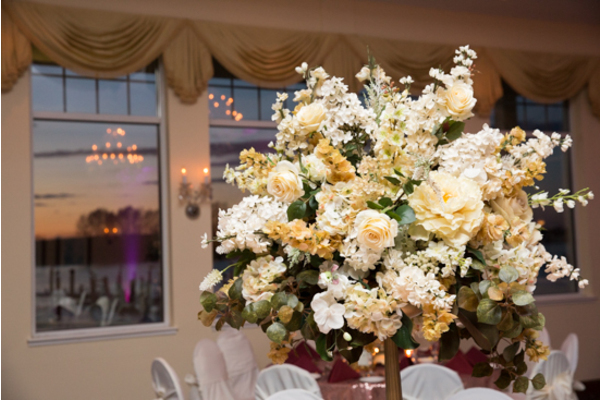 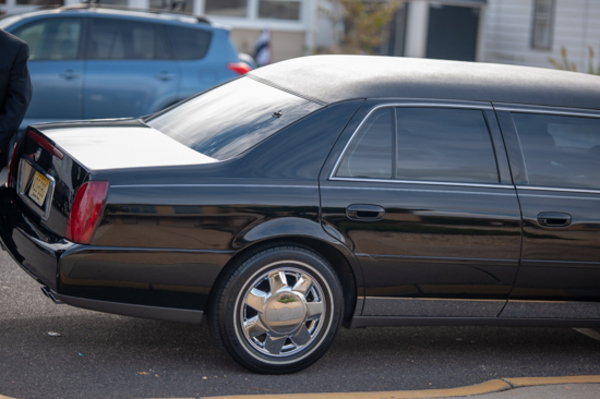 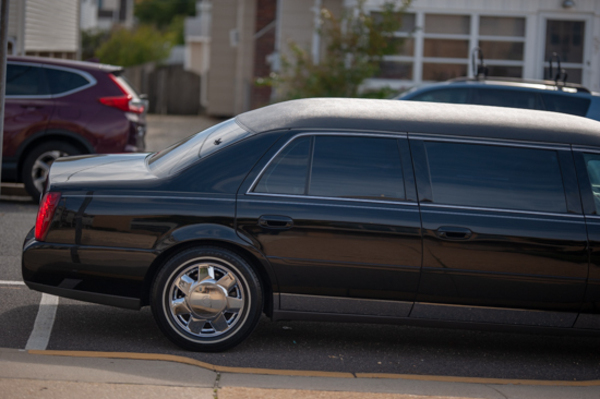 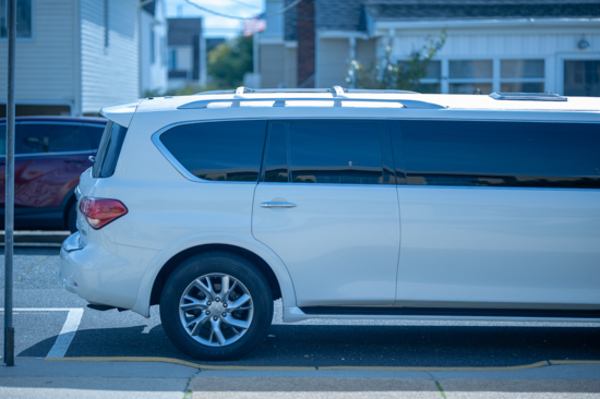 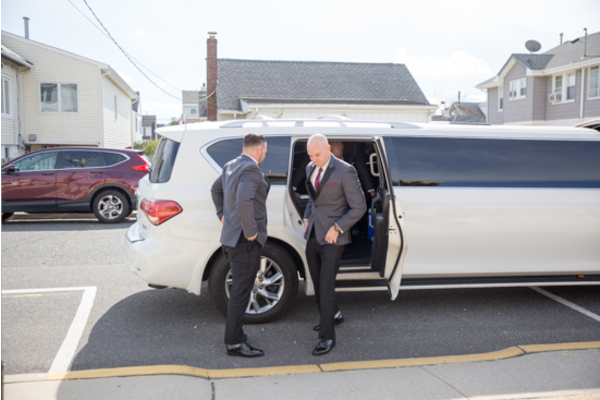 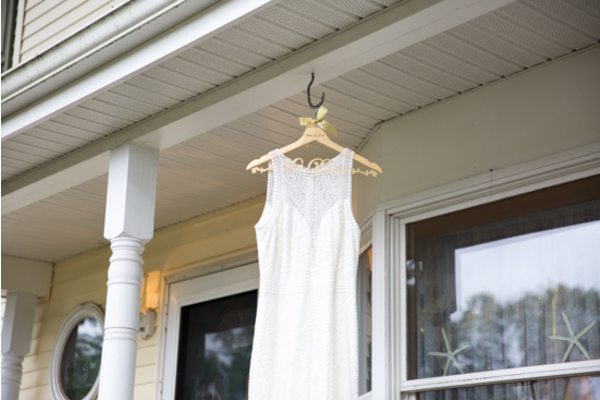 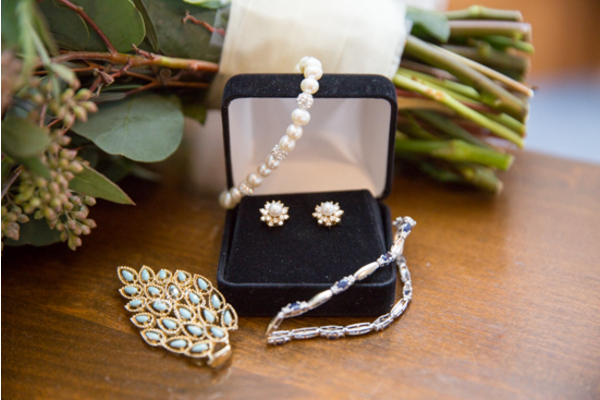 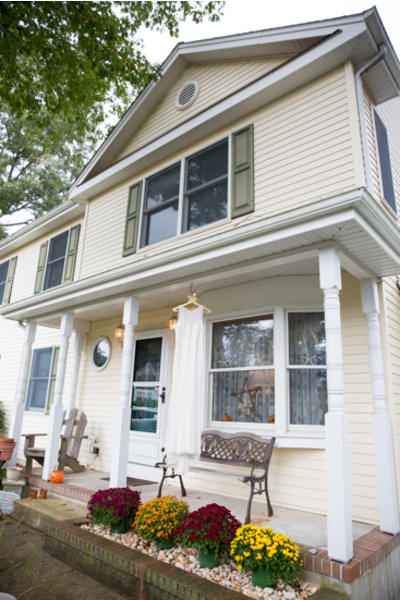 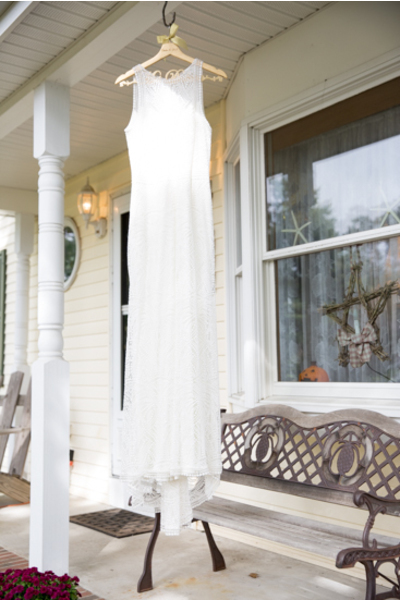 The beautiful October weather gave our NJ Wedding Photographer the perfect opportunity to take some immaculate photos. 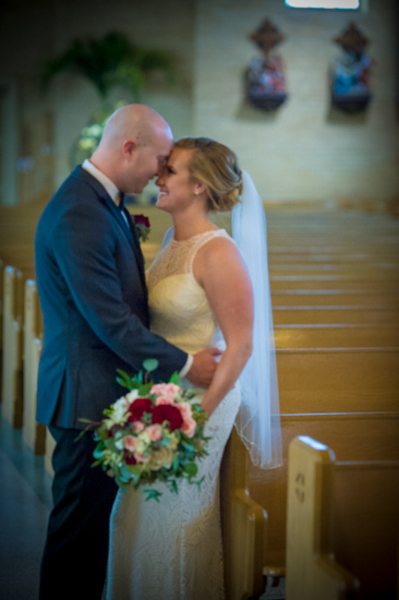 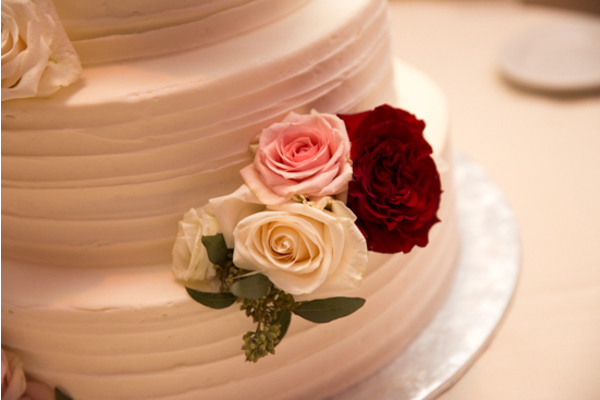 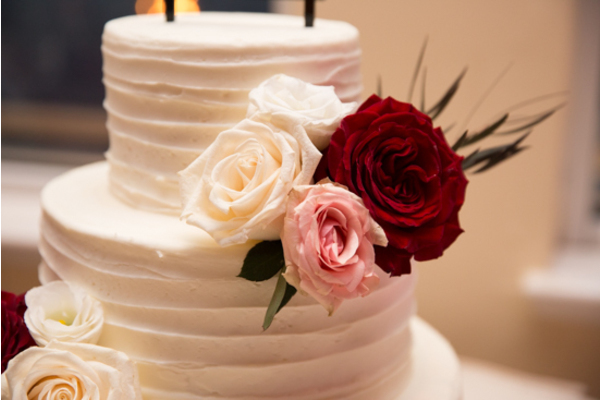 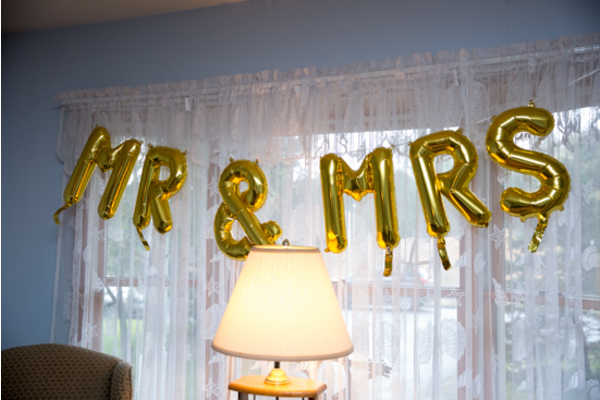 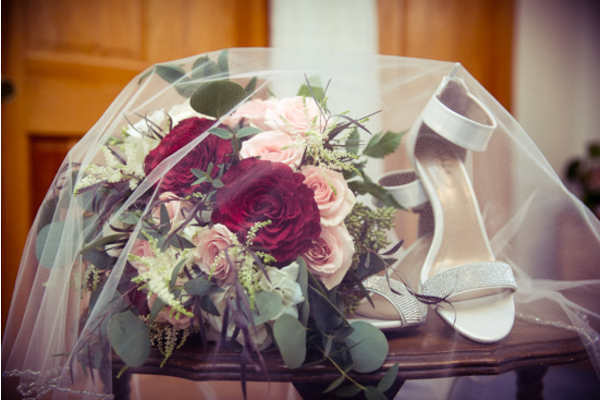 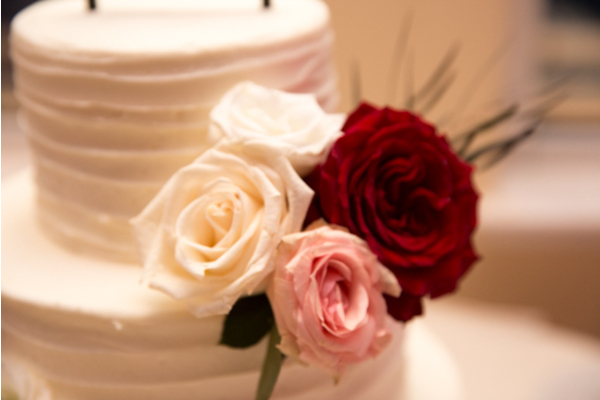 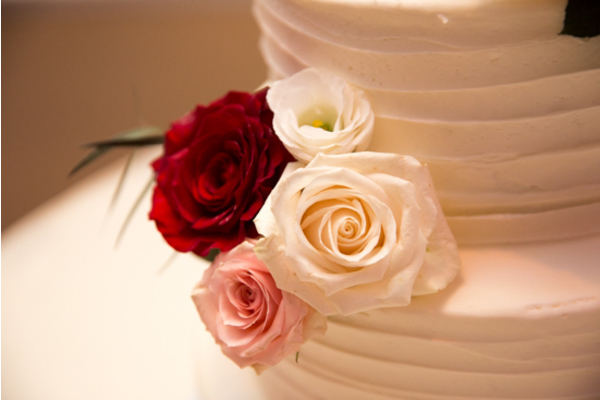 Full of love and happiness, they were now ready to celebrate! 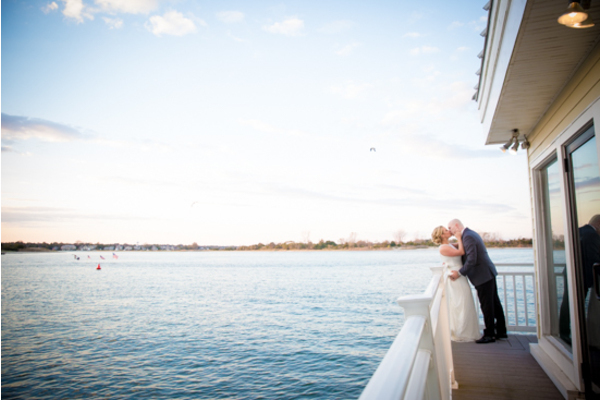 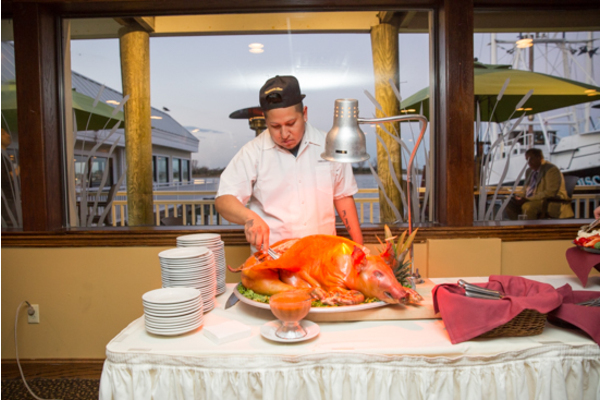 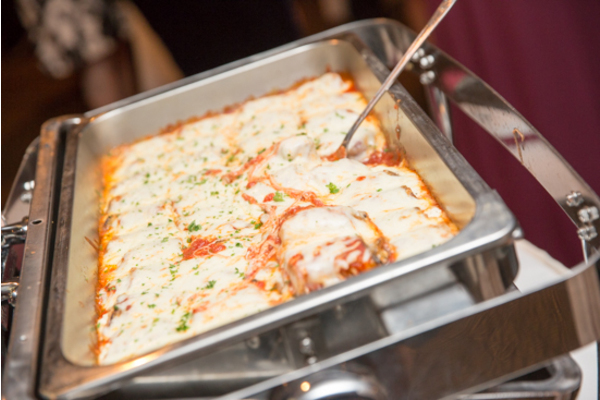 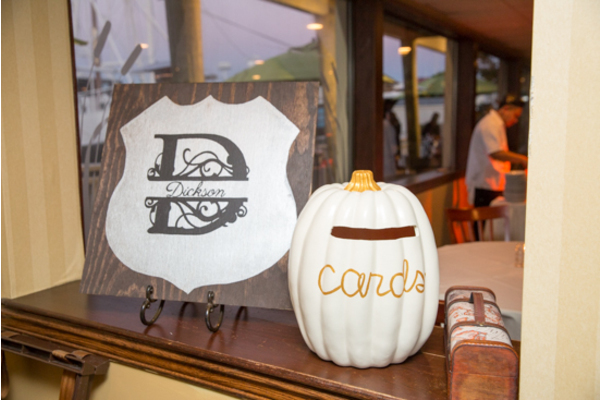 The beautiful waterfront venue made it possible to watch the sunset as guests danced and enjoyed delicious food all night! 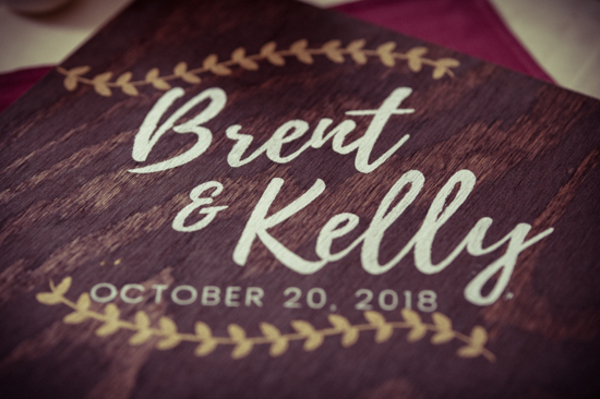 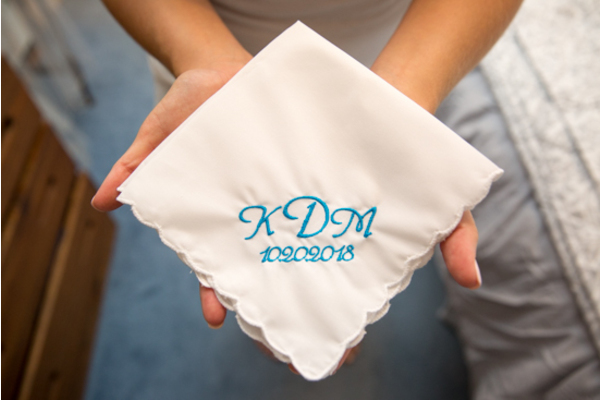 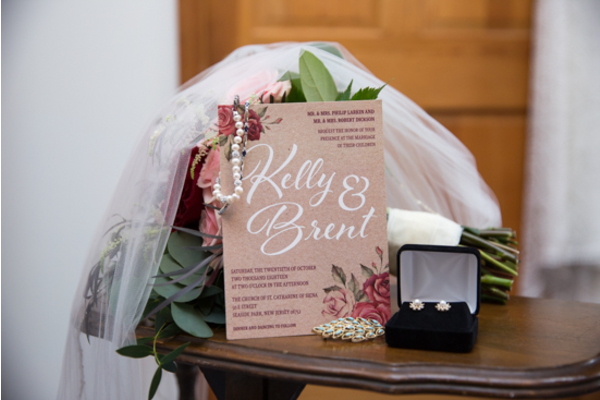 Congratulations, again, to Kelly and Brent. 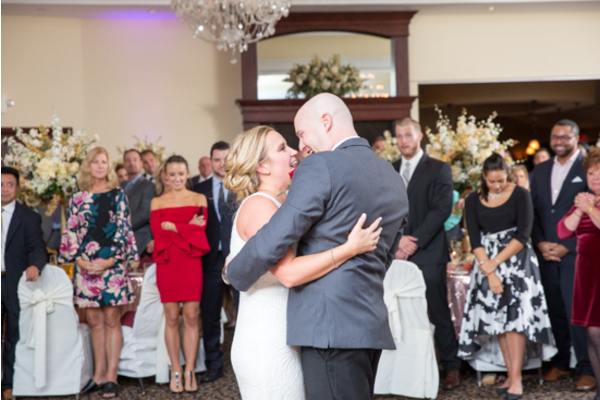 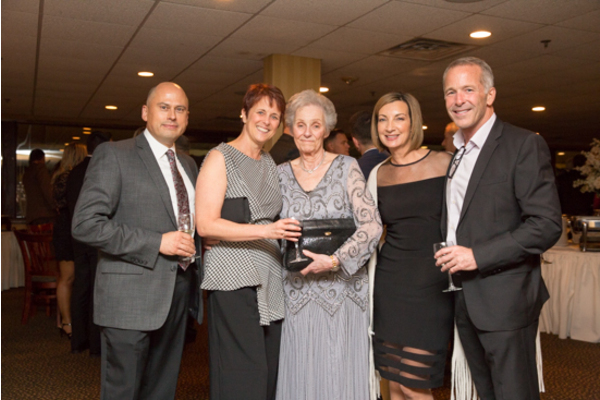 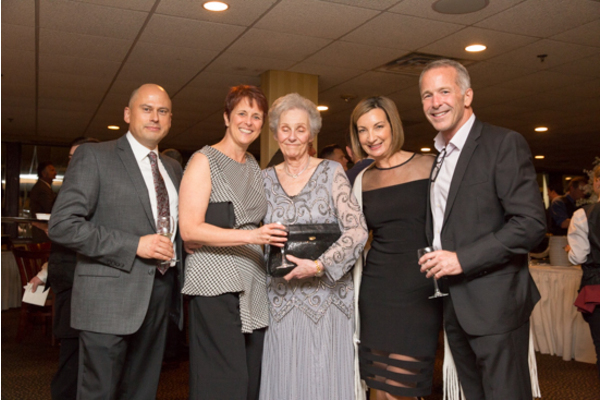 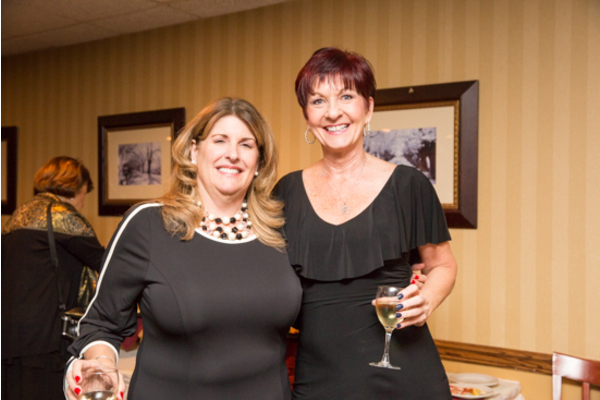 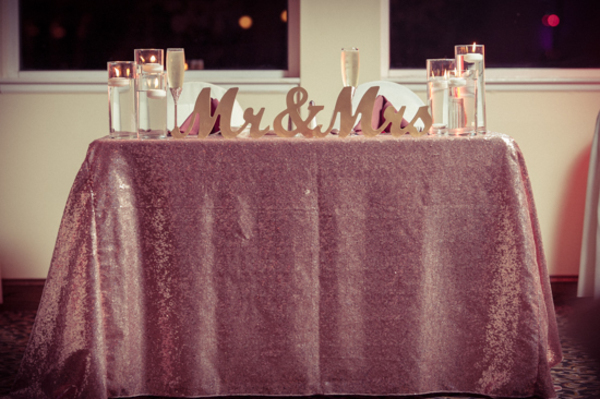 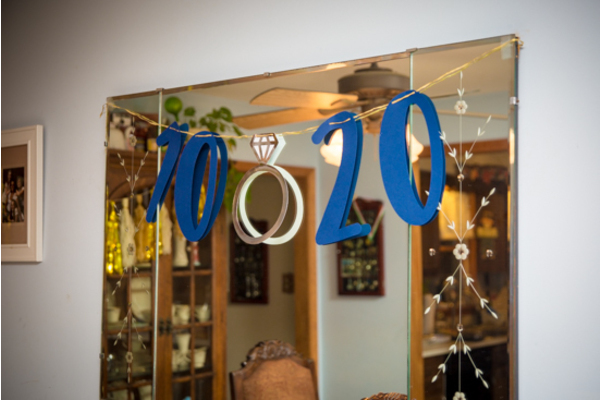 We are so happy we could celebrate with you!